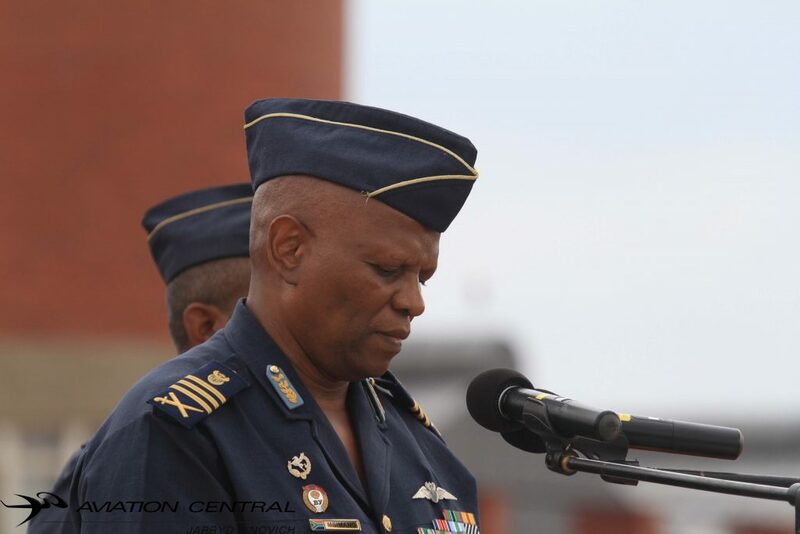 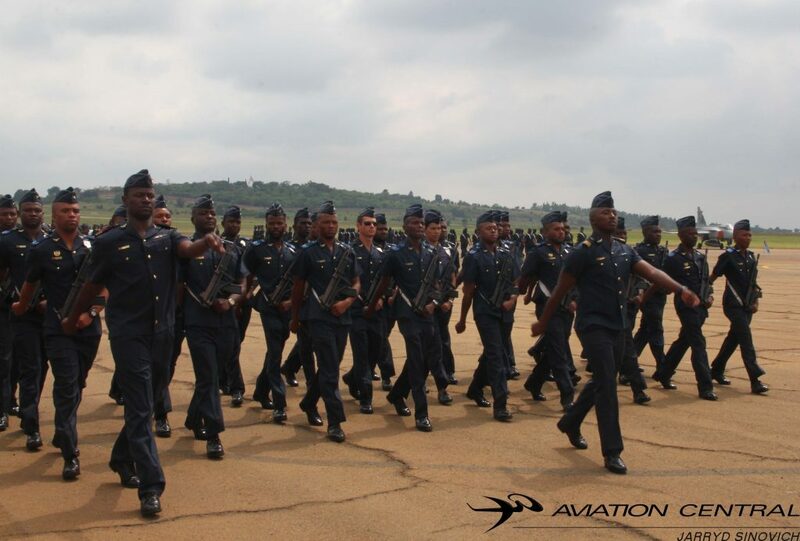 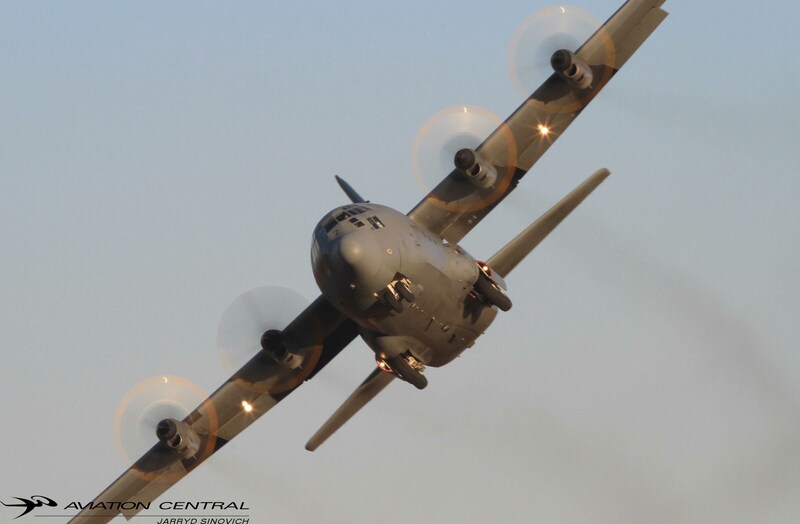 The South African Airforce celebrated 99 years of its historic air force. 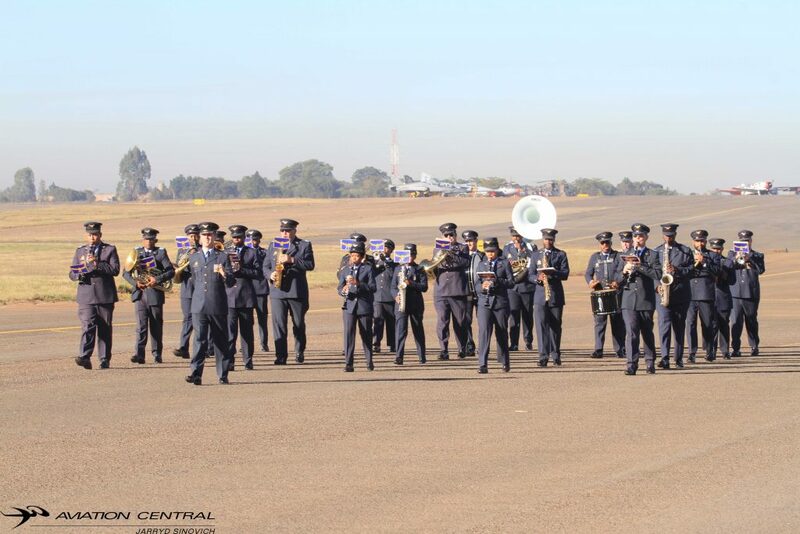 The SAAF was established on 1 February 1920. 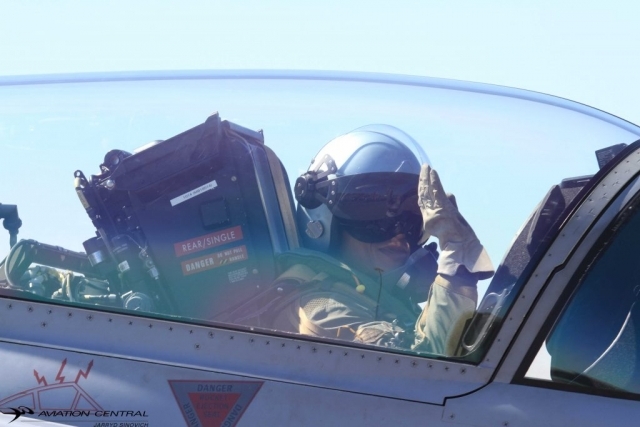 The Air Force has seen service in World War II, Korean War and the Angola Border War. 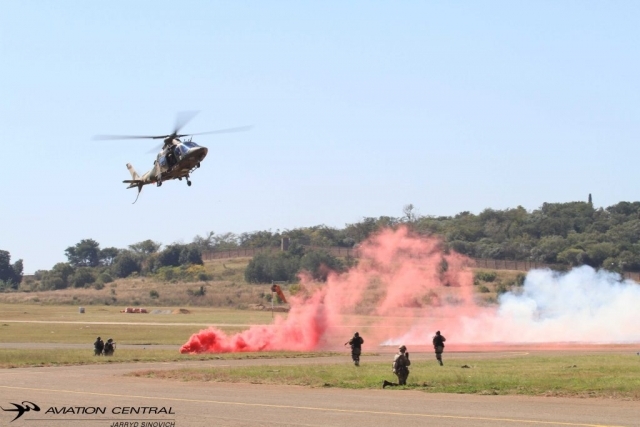 The parade held on the 1 February 2019,started with a flypast by two Agusta A109LUHs,one from 19 Squadron and 15 Squadron. 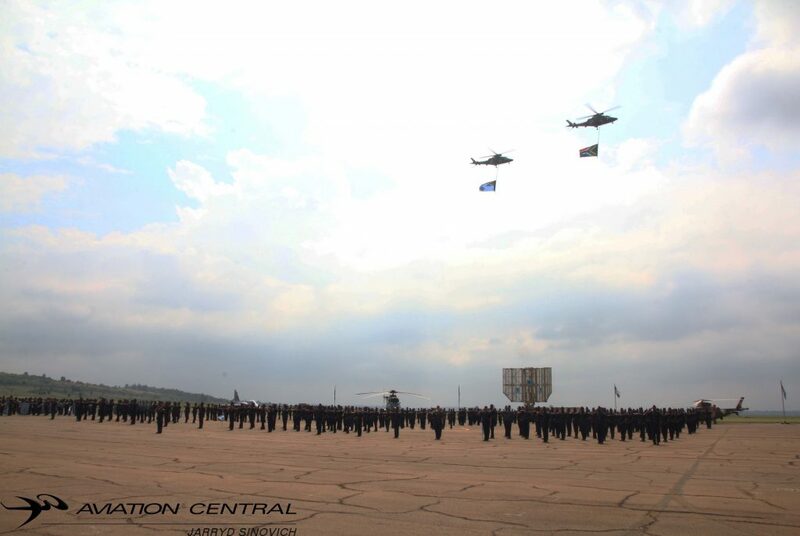 Shortly After we had the mass flypast by most current SAAF types. 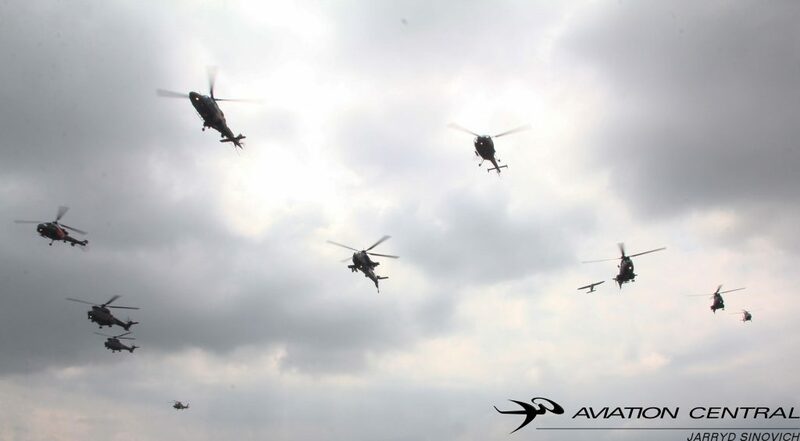 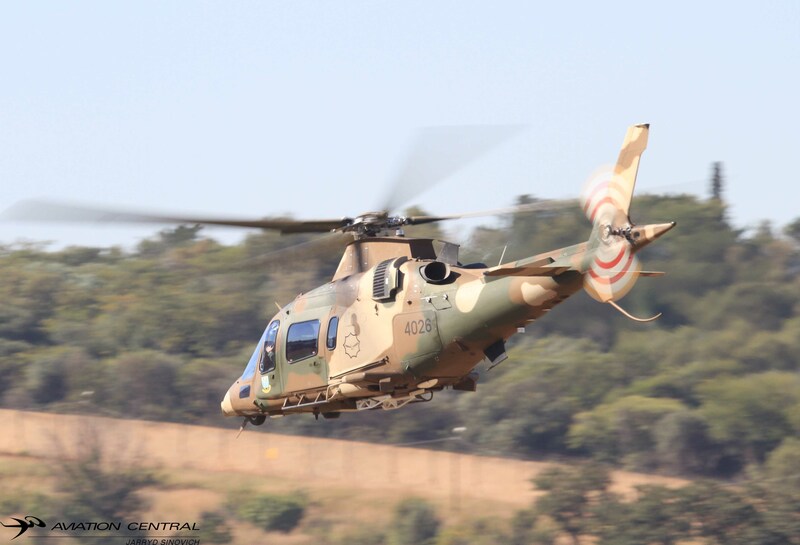 From the helicopters we had 3 Agusta A109LUHs,4 Oryx Helicopters,2 Museum Alouette IIIs and one 16 Squadron Rooivalk. 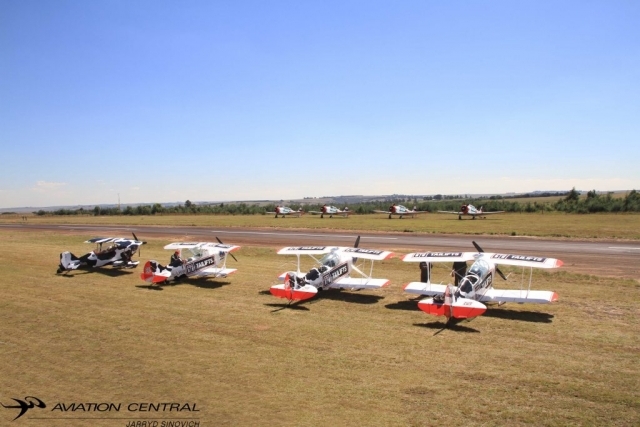 The Museum flew a Cessna 185,A Bosbok and 3 Harvard’s. 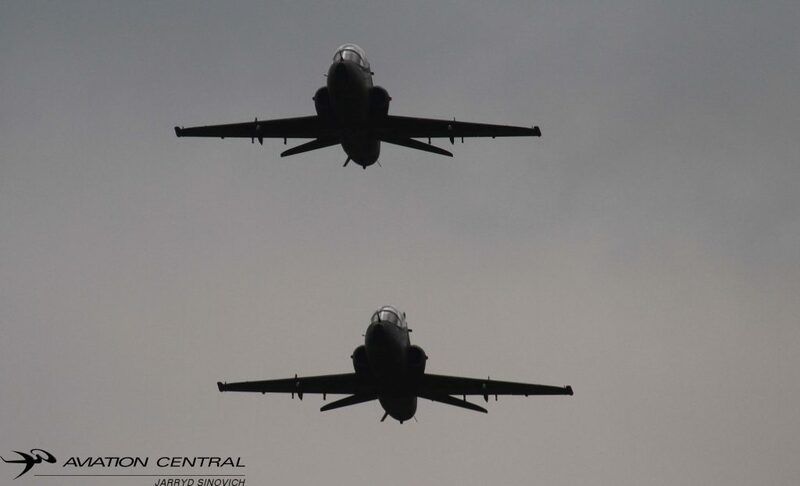 Two 41 Squadron Kings Airs flew overhead before the start of the jets howling overhead with two 85 Combat Flying School Hawk Mk120 jet trainers and the final flypast was by four 2 Squadron Gripens. Air Force Base Ysterplaat in the Western Cape was named as the prestige unit of 2018.Airforce Base Ysterplaat is home to 35 Squadron,22 Squadron and part of the SAAF Museum. “Our successful outreach programs, namely: Siyandiza, Young Falcon and the winter and summer camps, continue to ignite young peoples passion in aviation through science and Mathematics. 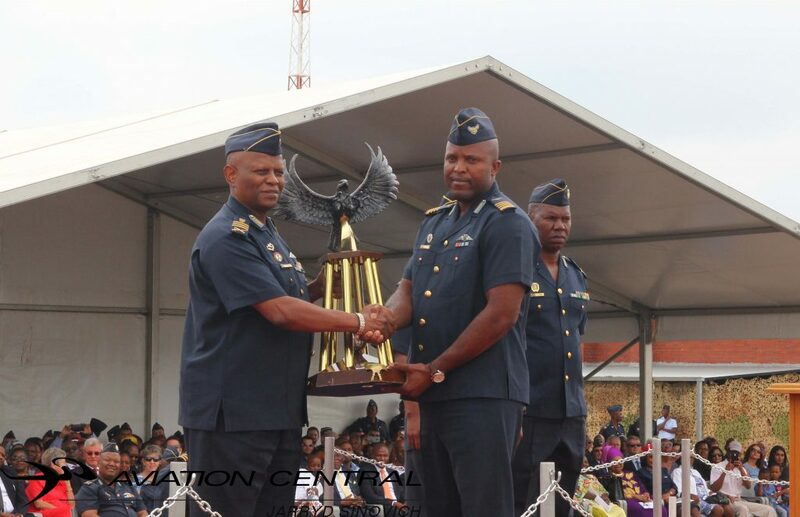 This year we shall introduce cyber awareness and robotics in our programs. 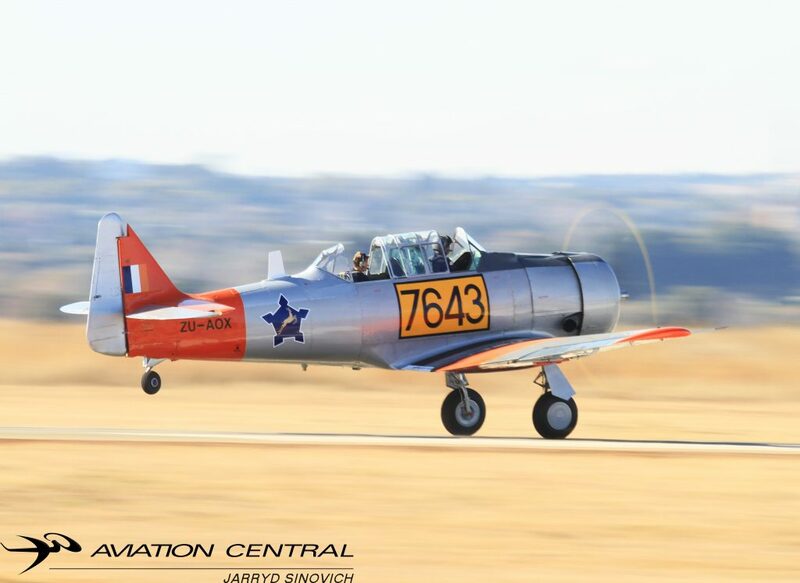 Please click on Advertisement below to help keep us going! Click on day below to open! 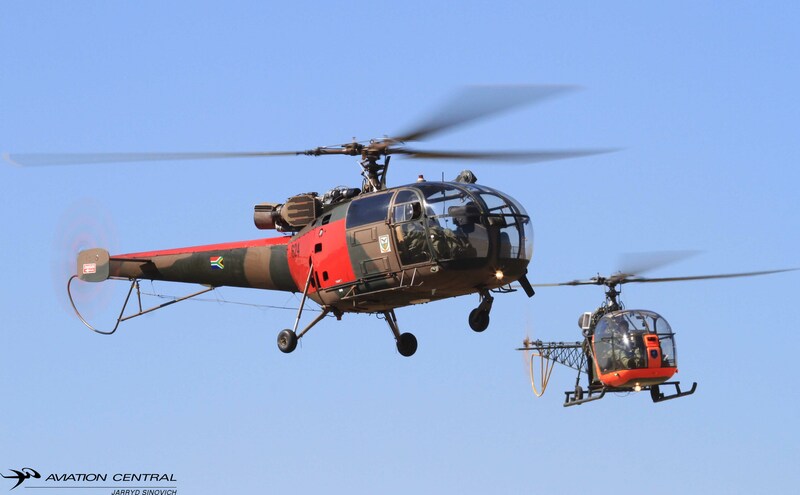 The August winds brought the first flying day of the month of August,we were delighted to be invited to go fly in the SAAF Museum SA330 Puma helicopter, the sole surviving airworthy Museum Puma.We got airborne at 9.45am routing towards the east of Hartbeespoort Dam and the we headed back towards the Pretoria CBD, before landing back at AFB Swartkop. 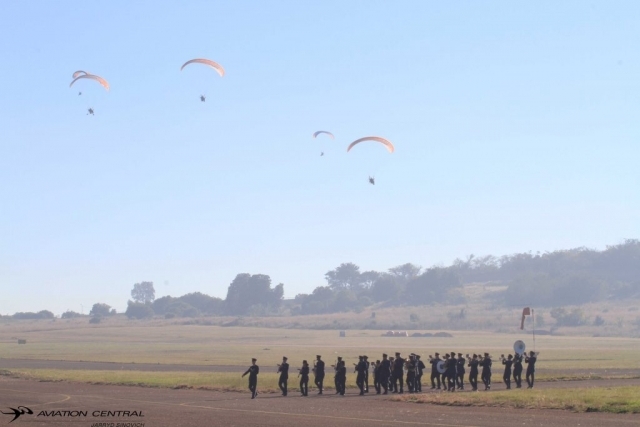 The Flying day kicked off with some of the Pretoria Military Skydiving Club jumping out the Atlas C4M Kudu,as the skydivers made their way safely back towards the earths surface.Museum and Harvard club Harvard’s buzzed the skies above Swartkop with their usual distinct sound.Both the Alouette II and III flew towards the other side of the base,known as Snake Valley, practicing both auto rotation and hovering skills. 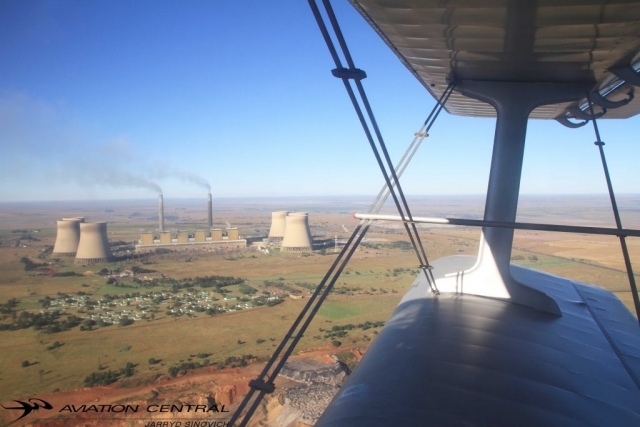 The Bosbok, Kudu and the Museums two Cessna 185s,continued until the end of the flying days proceedings with circuits. 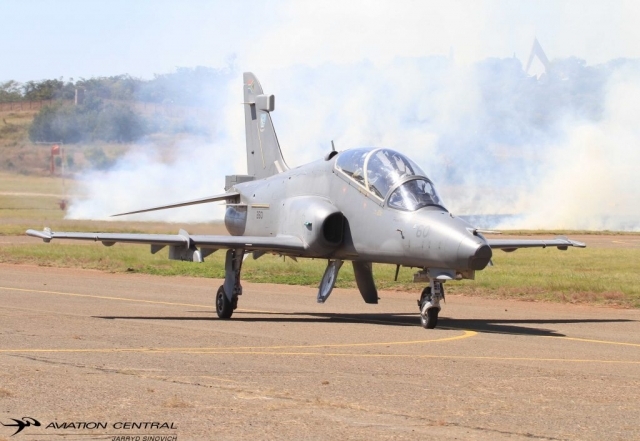 This is all in the interest of giving current SAAF pilots the feel of the old compare with the newer aircraft pilots get to fly these days. 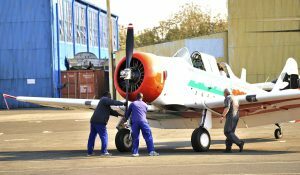 The Spitfire Restoration was present with giving the opportunity for the public to help restore the Museums Spitfire. 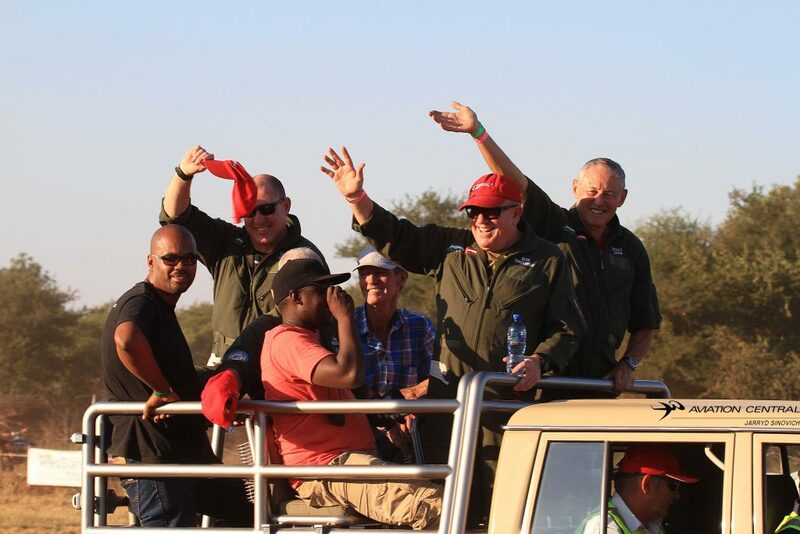 South African National Parks were also present and showing their support of our National parks and how they trying to combat the terrible rhino poaching occurring in the Kruger National Park. 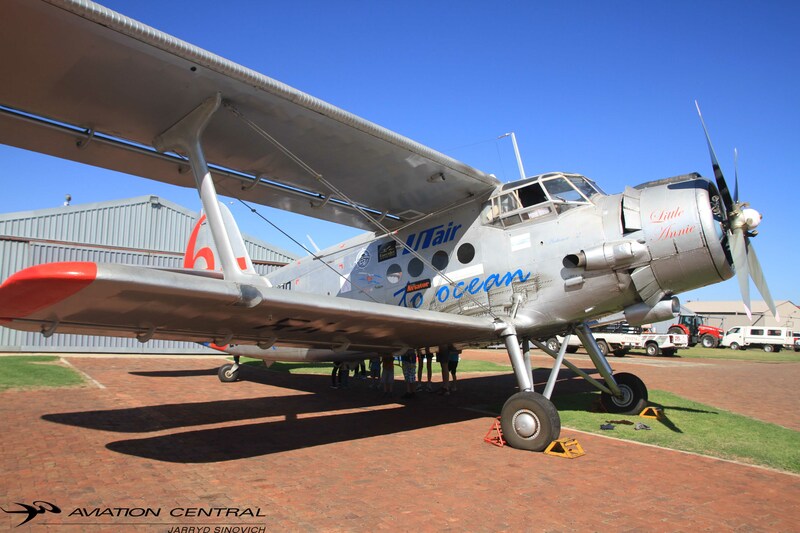 The Windsock Café filled the tummies of many happy visitors of the Museum, where there is no charge to get into the Museum, only a donation that’s goes to keeping the South African Airforce Historic flight in the skies. 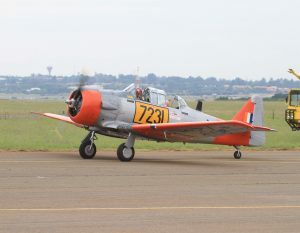 The dream of one day owning a Harvard, (or Texan as it is more commonly known in its country of origin) was the product of my living and going to both primary and high school within a radius of 7 miles of Rand Airport in Germiston, South Africa. 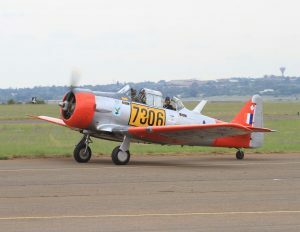 Forty two Squadron was based at Rand Airport and in those early days of the 60’s, hundreds of Harvard’s were flown into Rand Airport, serviced and then test flown overhead the field. 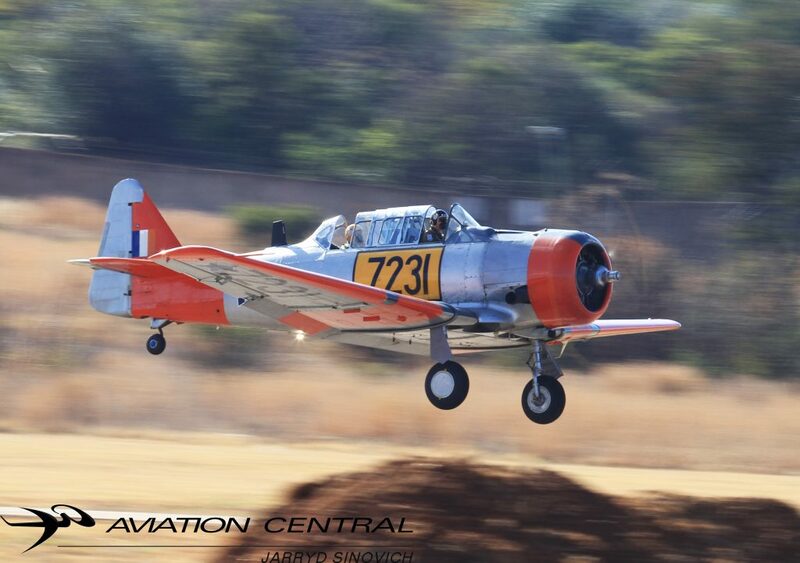 During those early formative years the seed of one day flying a Harvard was planted. 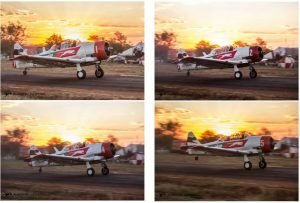 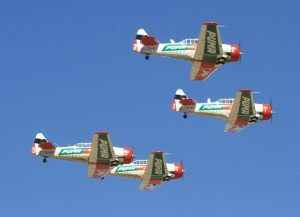 The chance to fulfill this dream came when the South African Air force decided to sell its large fleet of Harvard Trainers in 1994. 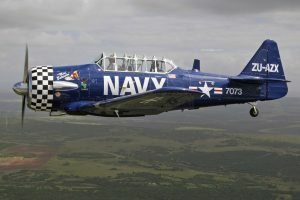 We put in a tender and were awarded the first Harvard. 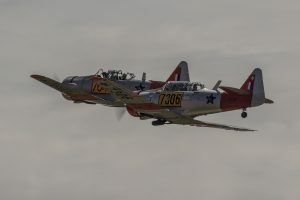 Two more Harvards followed within the next few years. We shared the hangar where Scully Levin kept his Pitts Specials. Not only is Scully a formidable formation and aerobatic pilot, he is also a person who is always ready to help a fellow pilot. It did not take long for the idea of a formation aerobatic team flying harvards to pop up. 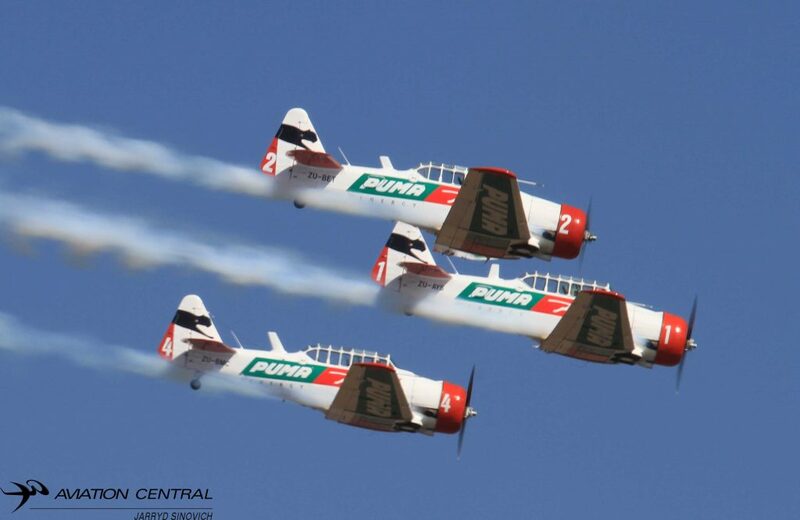 One thing led to another and the Flying Lions Aerobatic Formation Team was born. 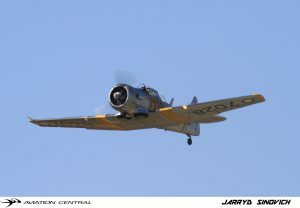 The choice of pilots was most important. 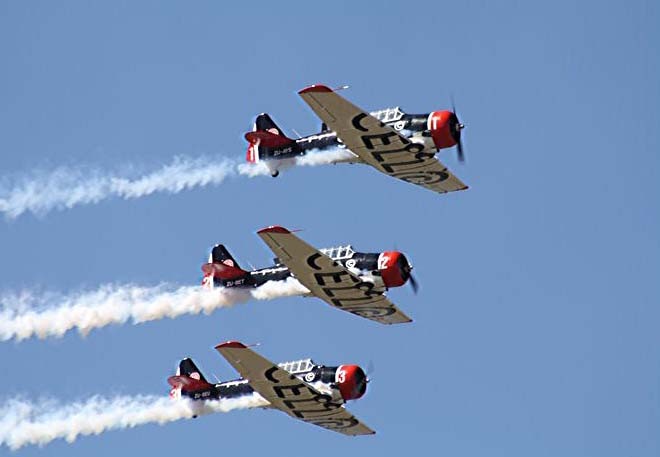 We had to have aerobatic formation pilots who fitted the bill as far as the flying went, but more important to consist of pilots who shared the same mental attitude or culture, discipline and passion. 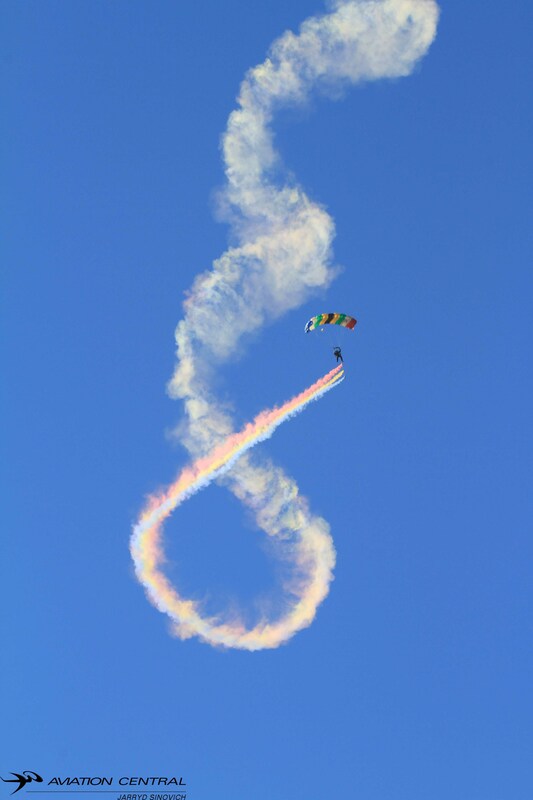 4TH December 1999 at Kitty Hawk. The quest for sponsors then began. 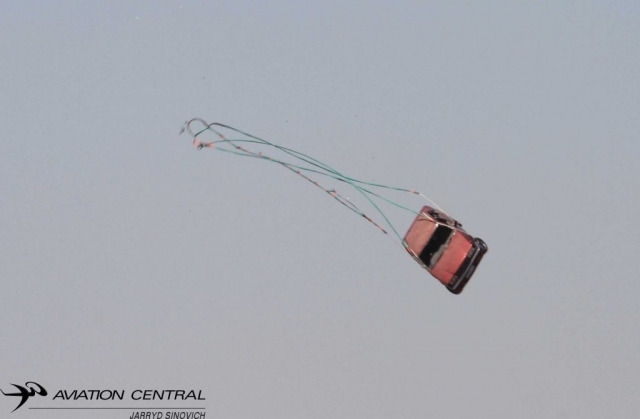 We realized we were onto something good here. 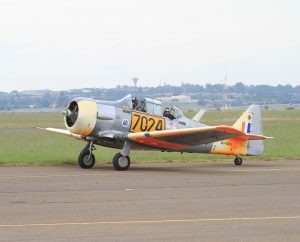 Harvards are noisy, large, they present well, and they have a nostalgic element about them with the South African public. Unfortunately, they also gulp fuel at an alarming rate! 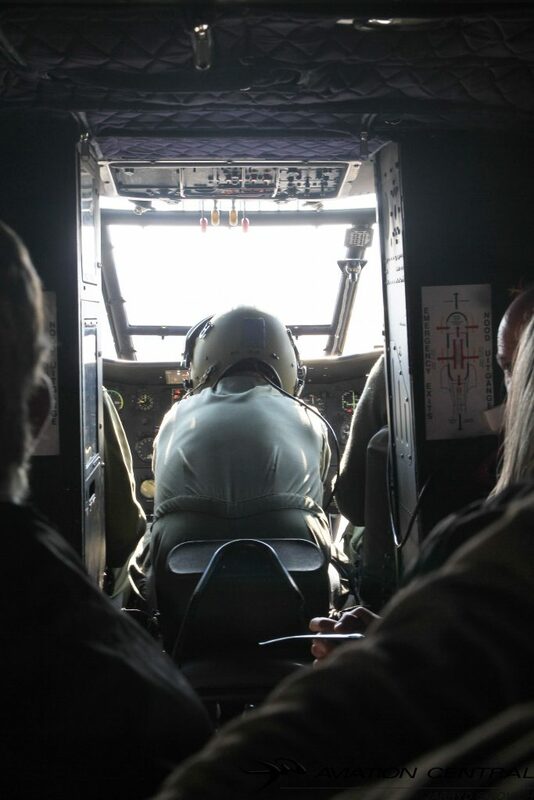 Our expenses were rising and our pockets were emptying! 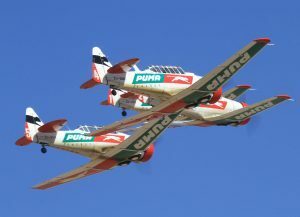 The brushware company, which I owned in those days, Academy Brushware (Pty) Ltd was the first obvious choice to support our team, but the burden was a heavy one. 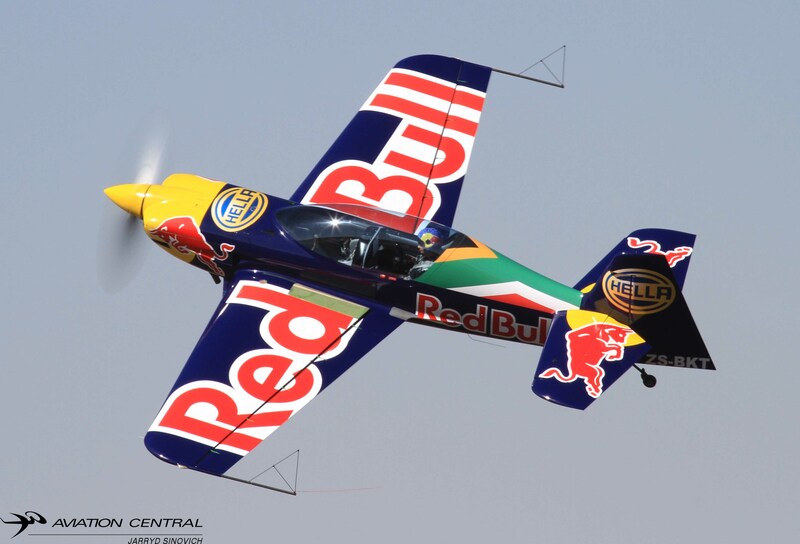 Our next stroke of luck came when Peugeot started co-sponsoring our three-ship team on 1 March 2000. 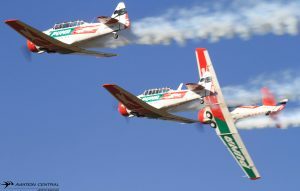 In January 2001 BP fuels with their subsidiary Castrol became part sponsors with Peugeot and Academy Brushware. 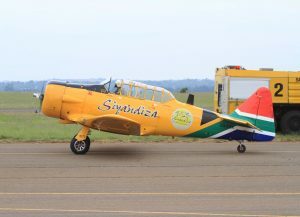 Later that year, they allowed us to negotiate a sponsorship with Nissan who were interested in giving us an overall sponsorship for the Harvards with full Nissan livery and no other branding. 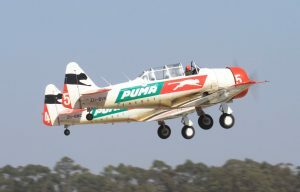 This happened in January 2002, Nissan SA approached Peugeot and BP and took over their portion of the sponsorship, and in the meantime we had acquired another two Harvards. 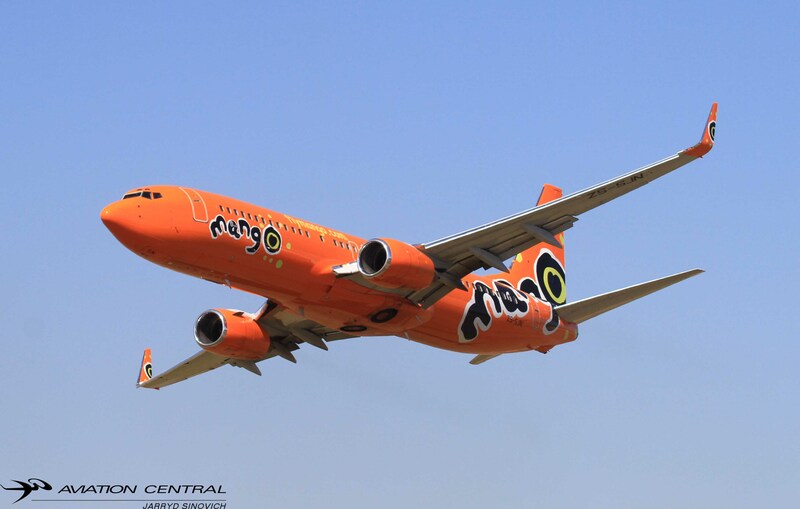 This sponsorship lasted four and a half years and was a most successful one for both parties. 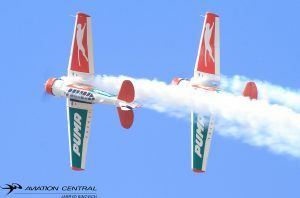 BP Ultimate with its subsidiary Castrol then regained full sponsorship of the Flying lions and this lasted until 2010. Our association with BP was in actual fact the longest even though it was intermittent but had lasted from January 2001 up until August 2010, approximately nine years. 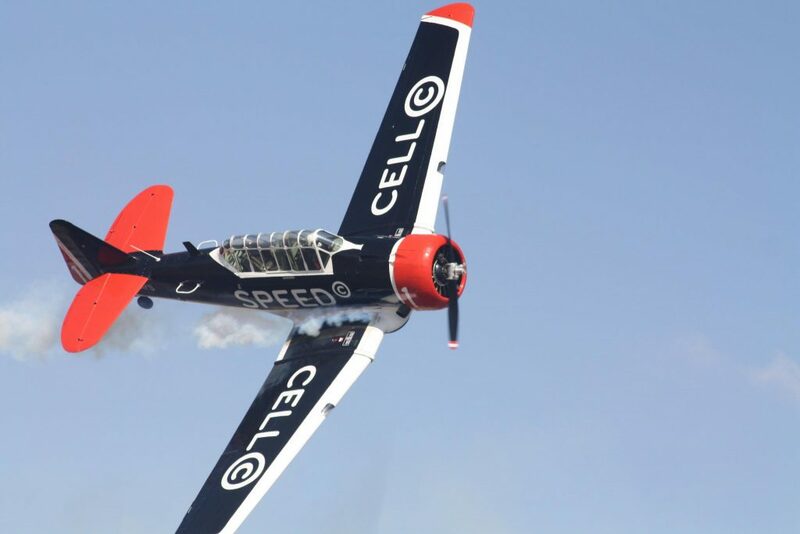 In August 2010 we entered into a temporary sponsorship agreement with Cell C and were flying the Cell C 4G logo around the country. This was a short term sponsorship which lasted for just over a year. 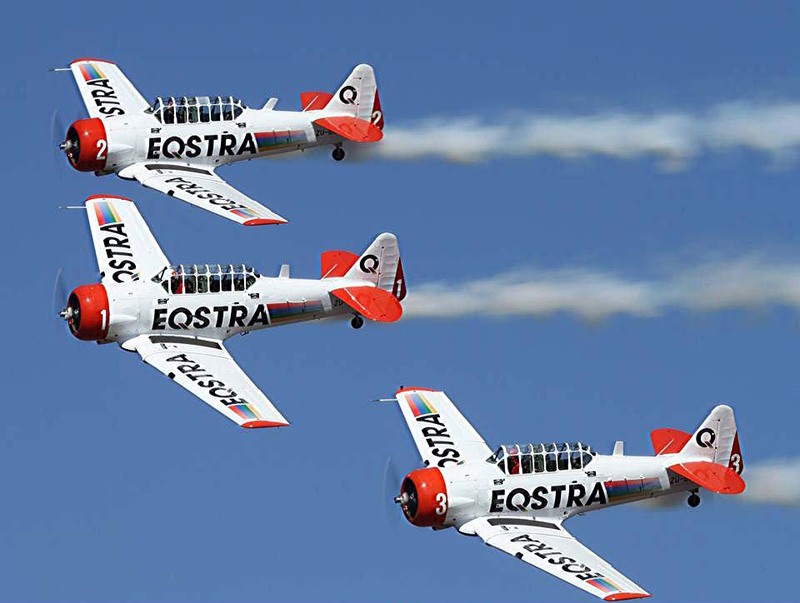 Then in the 2012 Eqstra took over the sponsorship and we ran for four years giving them a large amount of advertising for their brand and ending the sponsorship when they unbundled the company in 2016. 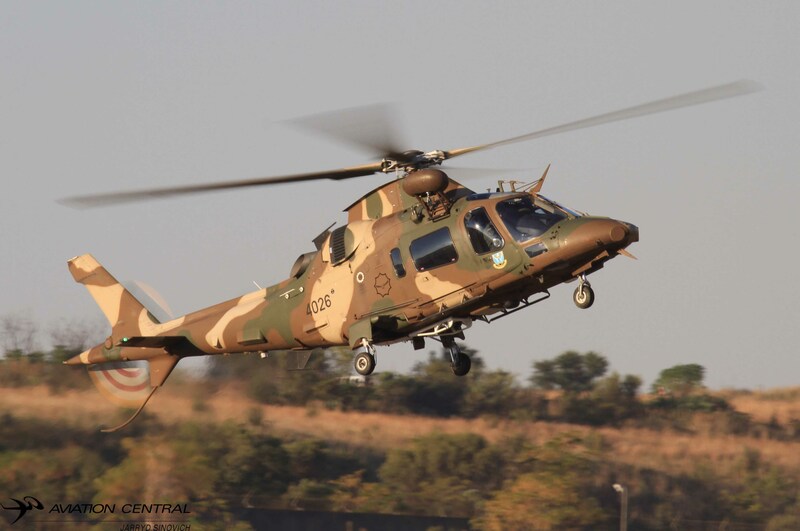 We then operated for a year and a half without sponsors keeping the aircraft flying with our own funds and engaging every potential sponsor, until, in December 2016, we did a display at a private lodge in the Skeerpoort valley and Puma Energy was there and were enthralled by what they saw. The rest is history and we are now the Puma Flying Lions and have a magnificent relationship with Puma Energy. It is a forward thinking company that concentrates on high quality fuels and the manufacture, storage and distribution thereof. 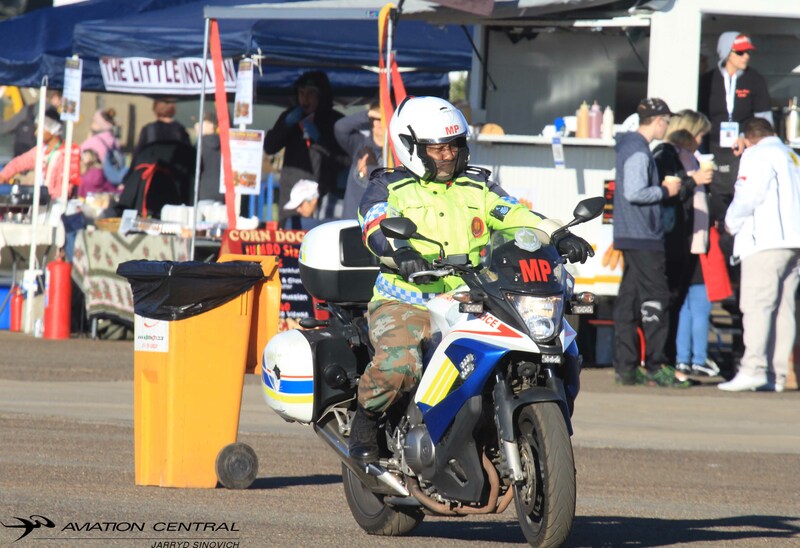 They are involved in the community which they serve not only at ground roots level but also in the environmental aspect where they sponsor the Race for Rhinos and Rhino 911 operations that take care of traumatized and orphan rhinos during anti-poaching operations. 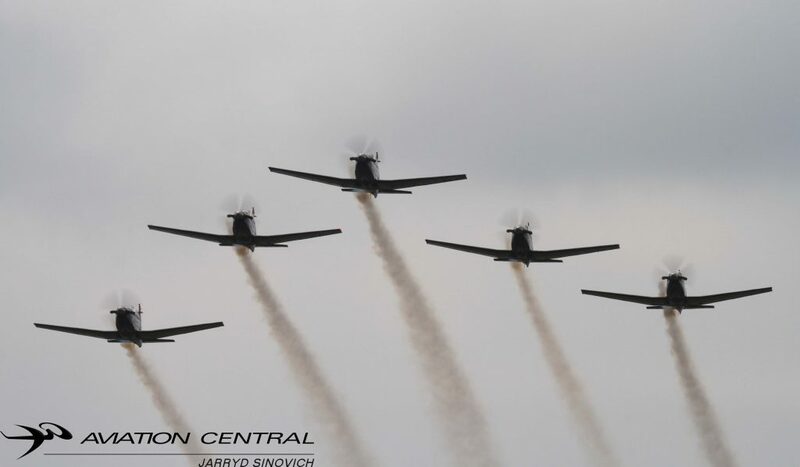 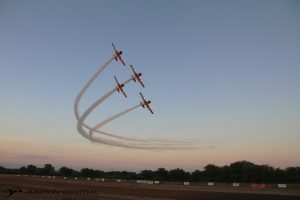 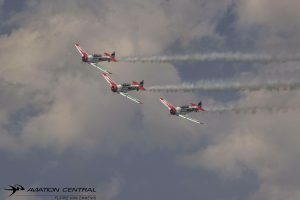 The team displays a four ship formation choreography of loops in Vic, in line abreast and in line astern ,with barrel rolls and straight rolls while trailing smoke which is nontoxic oil burning in the aircraft’s exhausts. 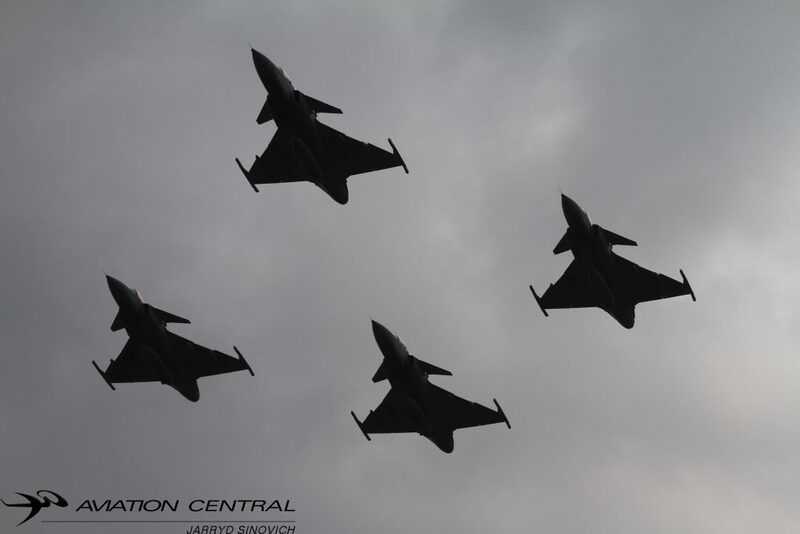 They are well known for their precision formation flying and their magnificent night display. 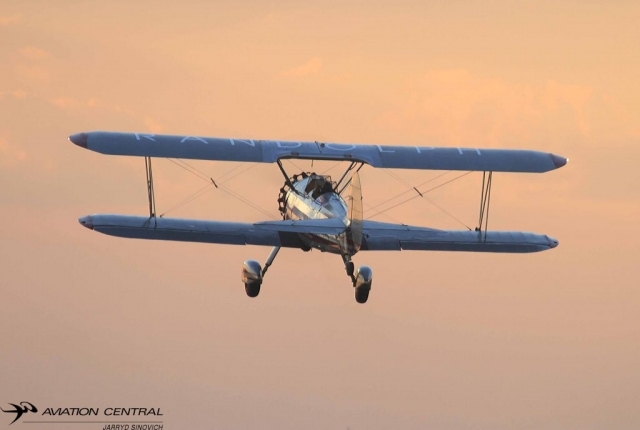 The Flying Lions Aerobatic Formation Team has successfully dovetailed vintage aircraft, formation aerobatics and marketing to the benefit of all. 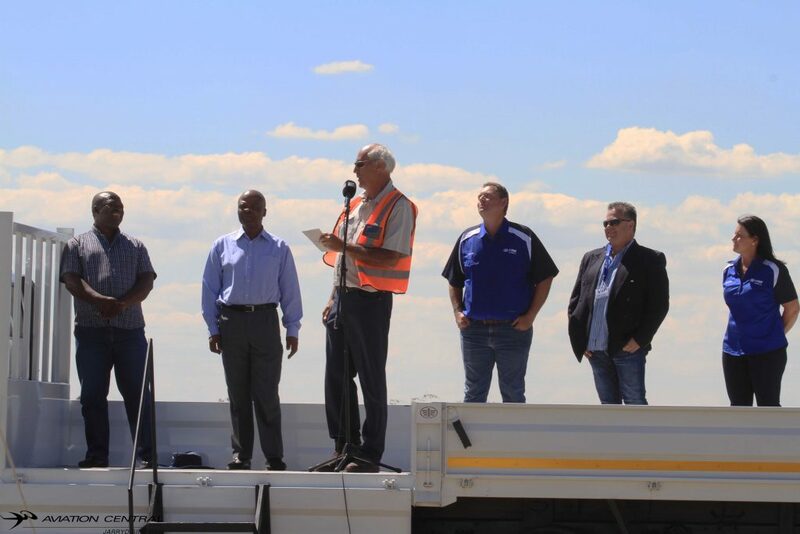 And what keeps this all together and ticking is the passion of the pilots and the people behind the scenes that form part of a larger team. 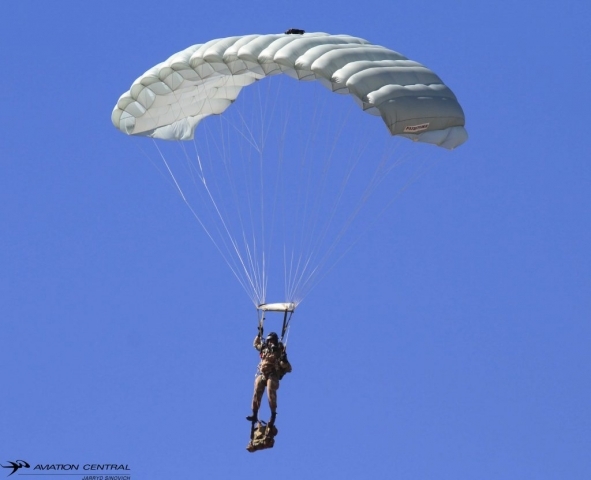 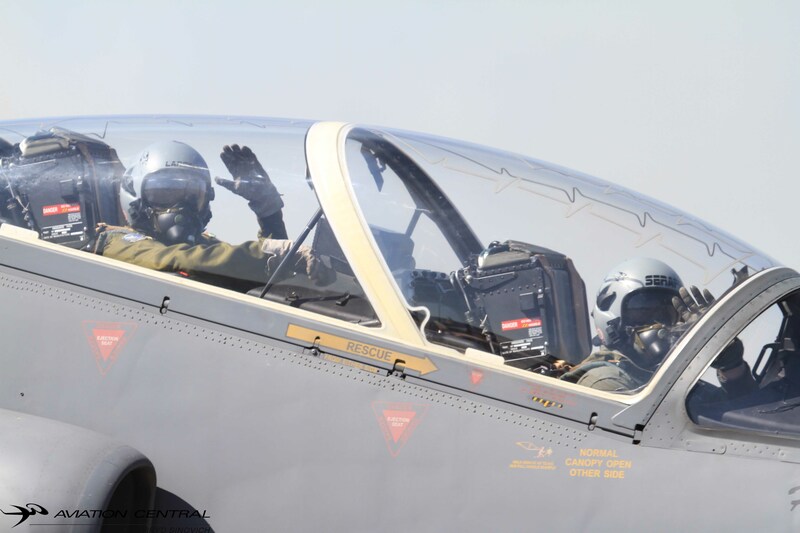 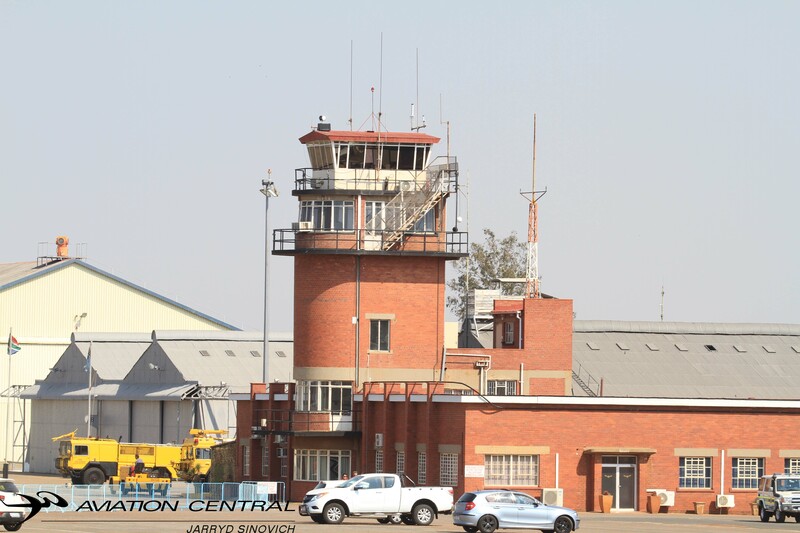 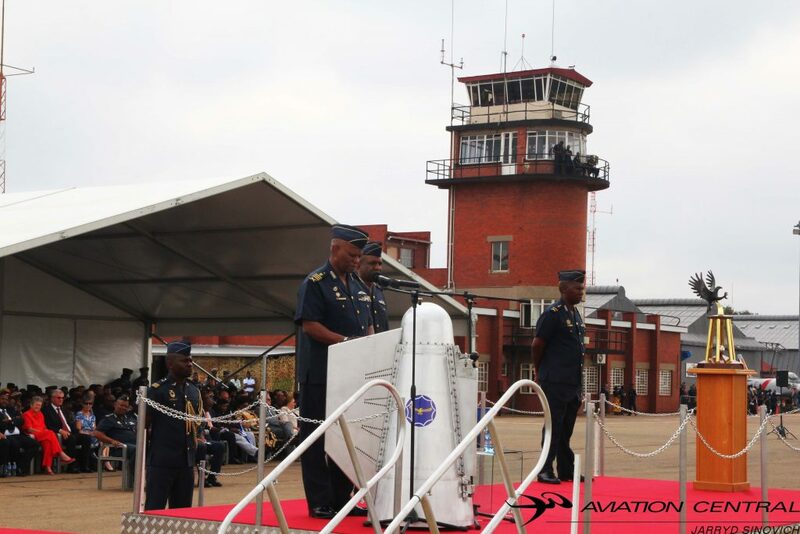 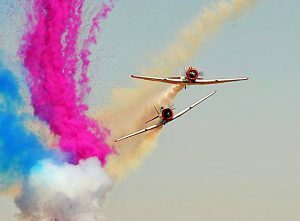 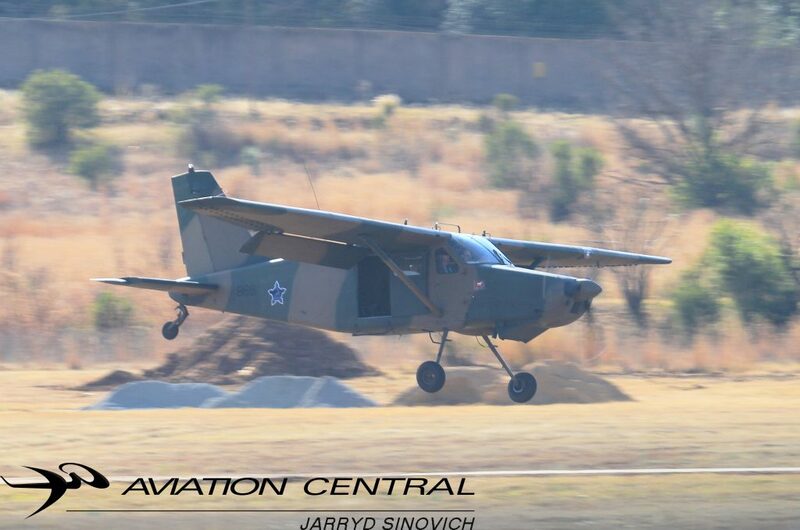 The first weekend of July, The SAAF museum hosted their annual monthly flying day at Airforce Base Swartkop in Pretoria. 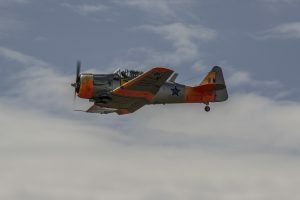 Probably one of the colder flying days we have attended and a good X-wind blowing across the field many of the Museum fixed wing aircraft were using the Grass runway towards the Snake Valley side of the base. 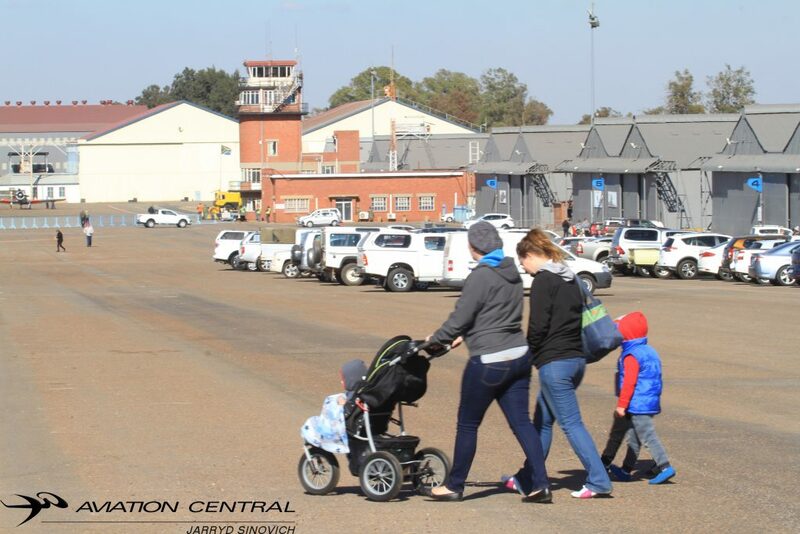 Visitors from all over came to support the museum, as a small donation upon entry into Swartkop that’s goes to maintaining the Museums aircraft fleet and restoring future projects. 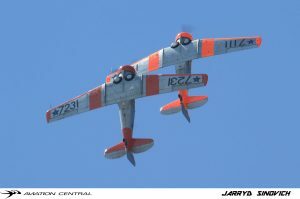 The Windsock was busy with their filling breakfast, lunches and a piece of memorabilia for purchase to take home. 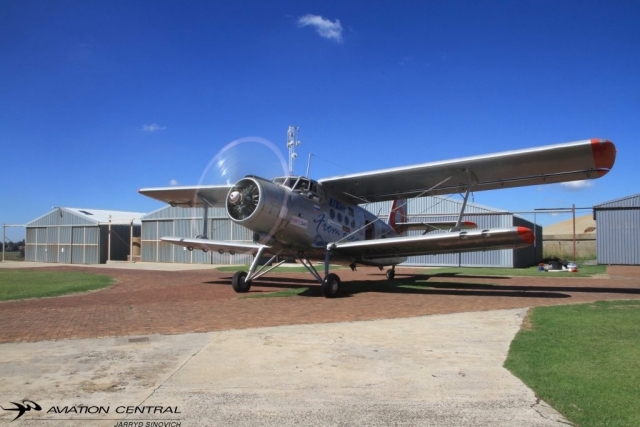 These flying days also give the public and opportunity to visit the Hangars and get up close and personal with past aircraft and the history of the South African Airforce. 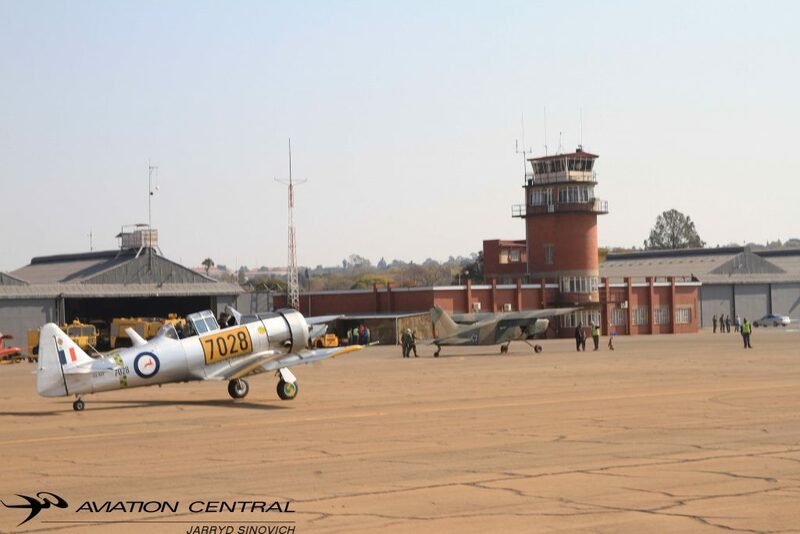 Its also a chance for volunteers to help rebuild or donate to the Museums Spitfire restoration and getting involved with the friends of the museum. 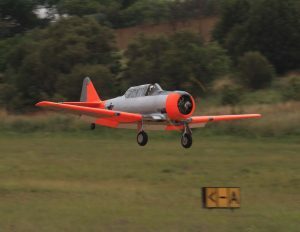 And for the adrenaline junkie, one can go fly in a Harvard at a reasonable price at the Harvard Club of South Africa. 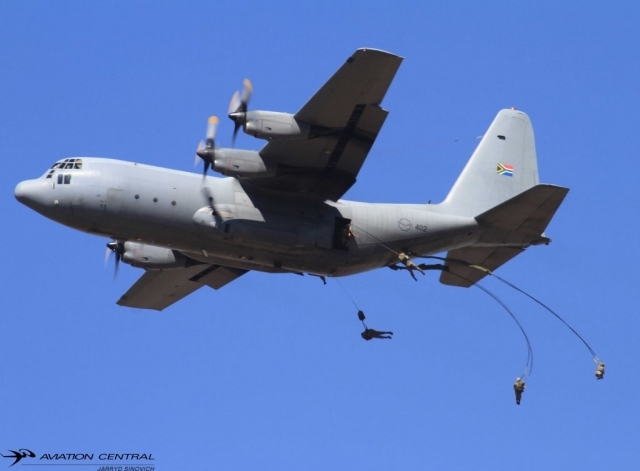 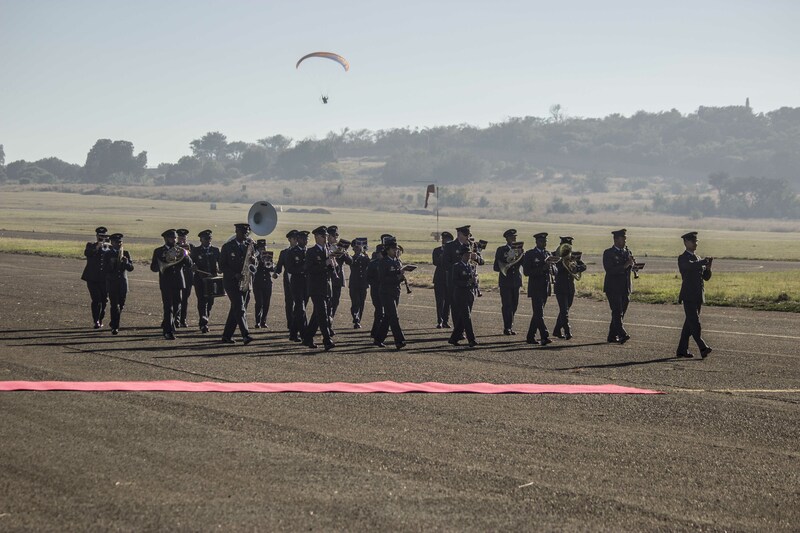 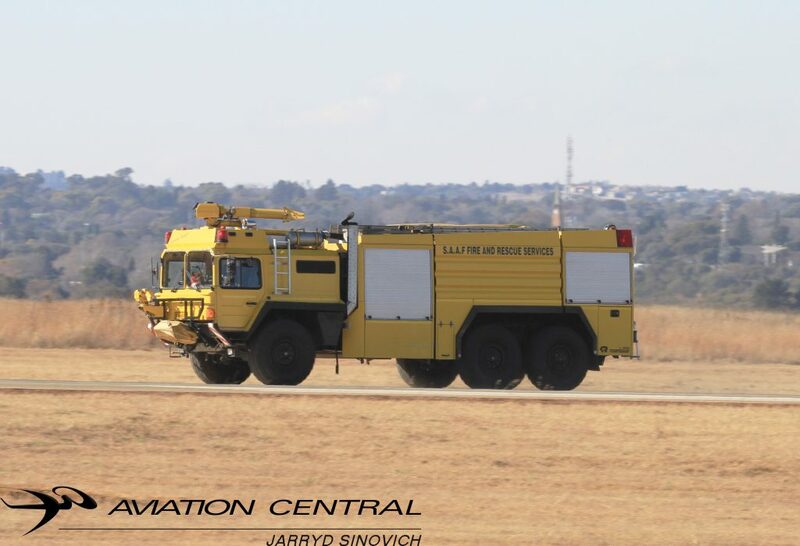 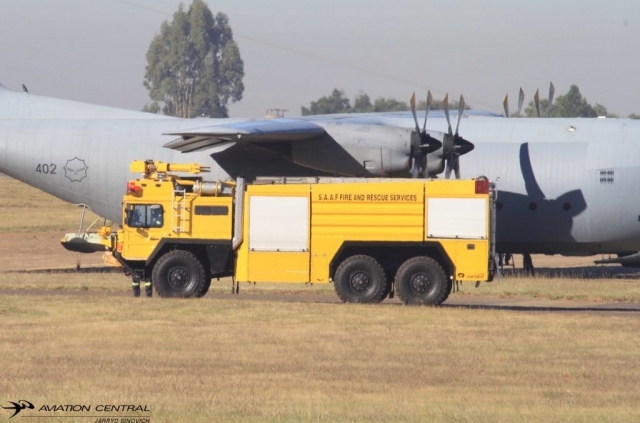 The SAAF Fire and Rescue crew opened the proceedings with a runway inspection, before the Atlas C.4M Kudu got airborne with the Golden Eagles Parachute Team. 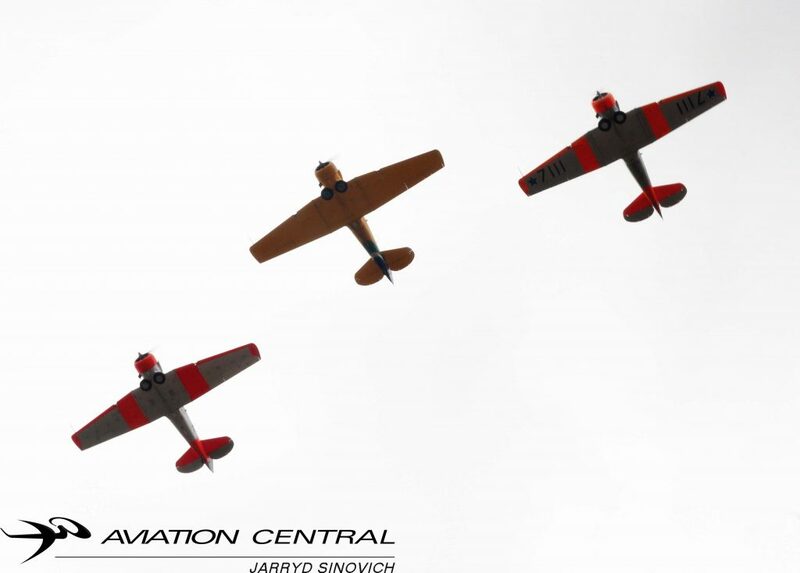 Most of the Museum Harvard’s and the odd Harvard Club machines took off and completed a series of currency flights and flips for the day. 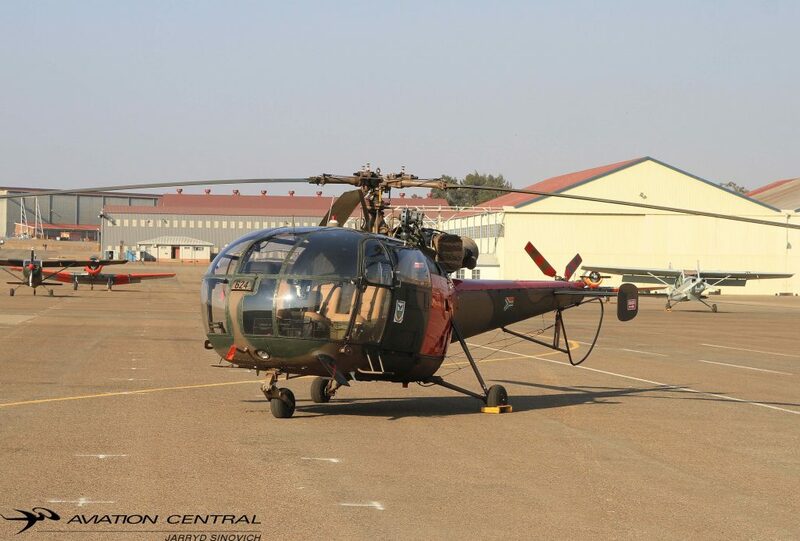 The Museum Choppers like the Alouette II and lonesome Puma were out and about also busy with currency flights and flipping. 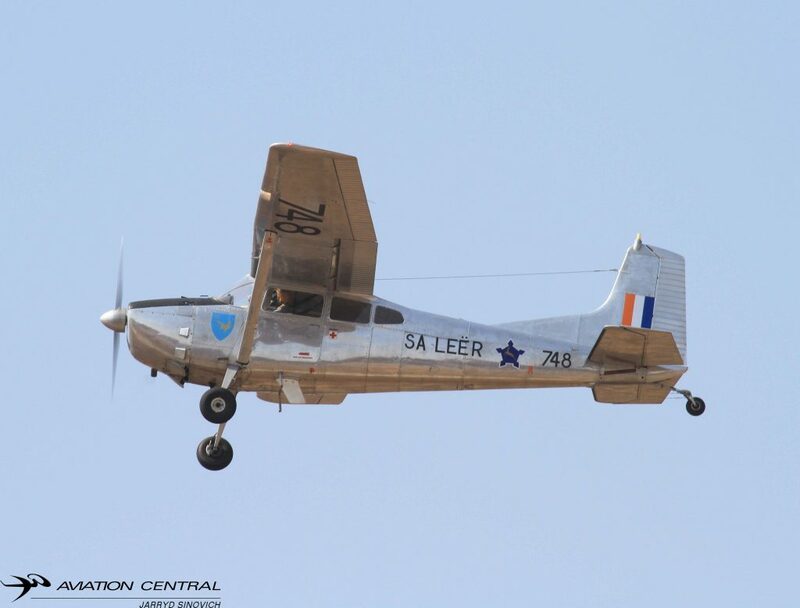 A former workhorse of 44 Squadron the Cessna 185 also took to the skies and was joined by the Museums second C185 former 42 squadron bird. Most of the Museum Flying Exhibits should be seen at AAD2018 later this year. 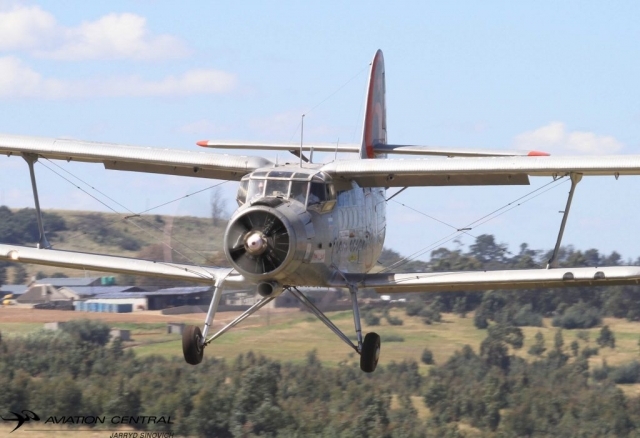 The closer we get to the 19-23 September 2018 we will see more flying from the Museum Flying days to come. Well done to the hard working ground crew keeping the museum aircraft in flying status, also giving up their Saturday to be on standby at the Museum. 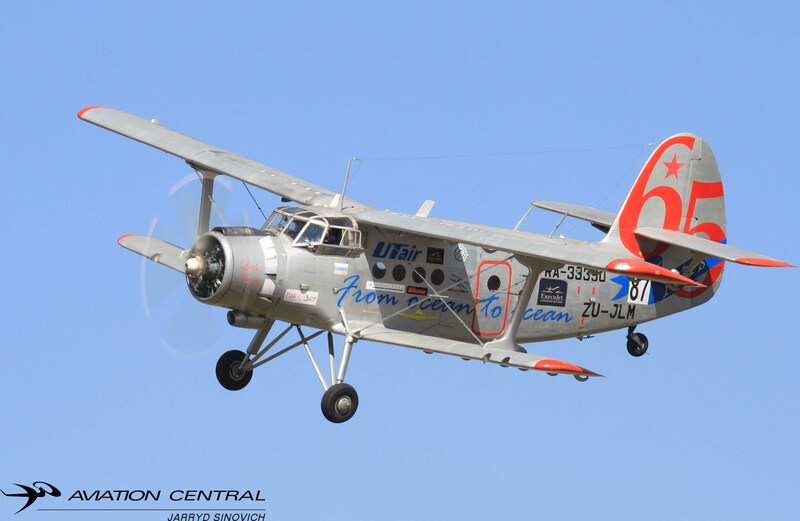 We look forward to the next flying day in the first week of August. 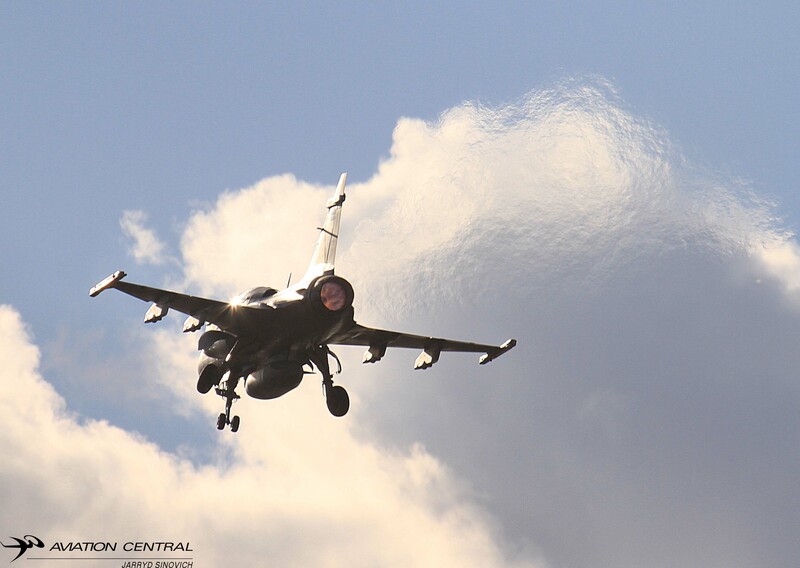 Till then….. 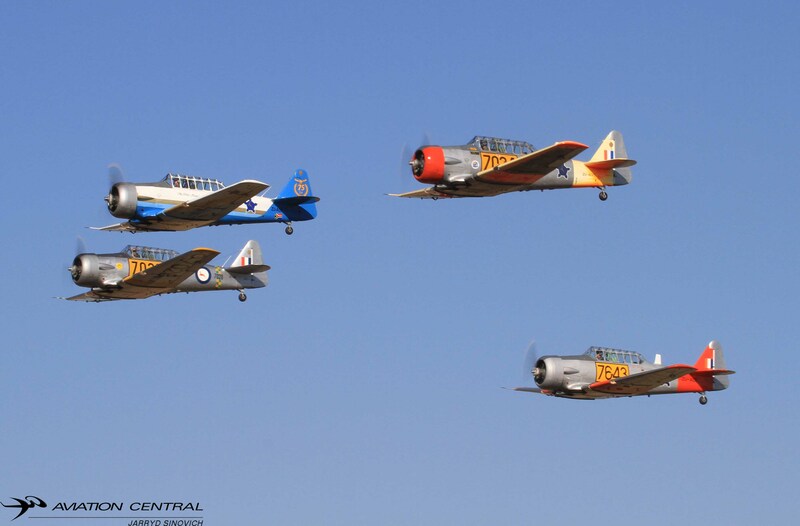 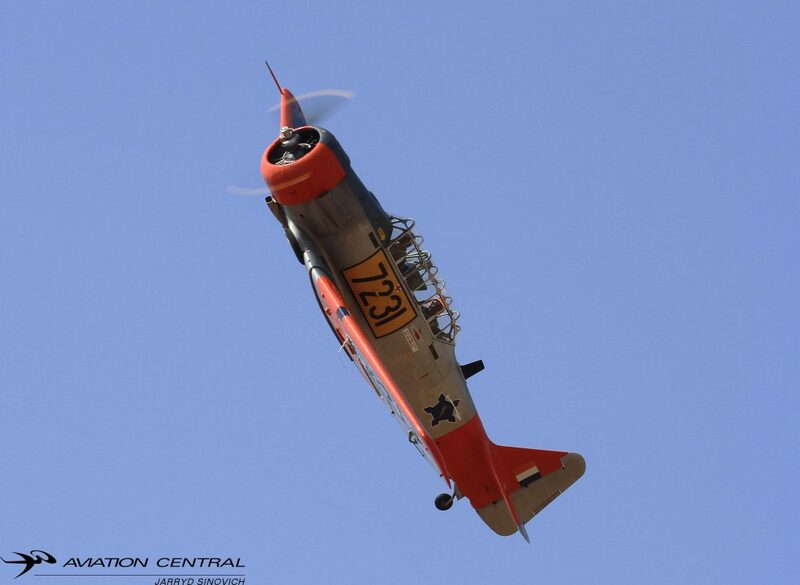 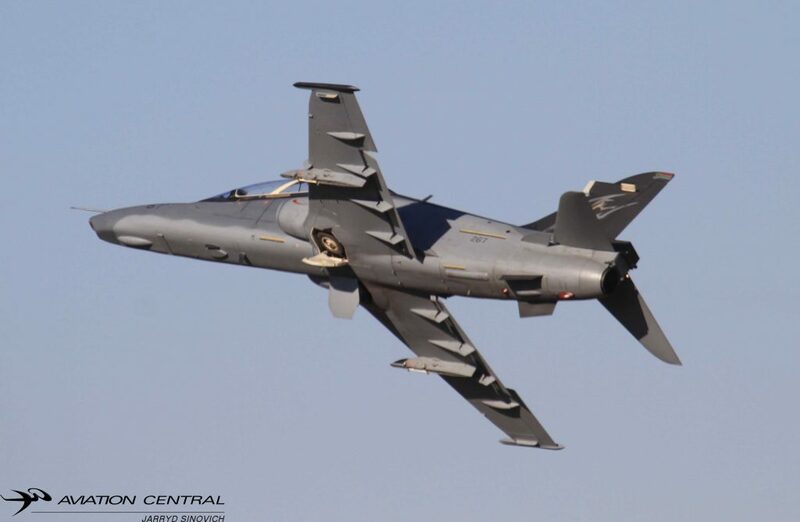 The long awaited annual SAAF Museum Airshow was held on the 5th May 2018,on some what perfect airshow weather.The show was conducted under the theme:Our Indomitable Spirit,both Civilian and Military aircraft and pilots showed off to the thousands of people that arrived early on Saturday morning at Air force Base Swartkop along side old Johannesburg Road in Valhalla, Pretoria. 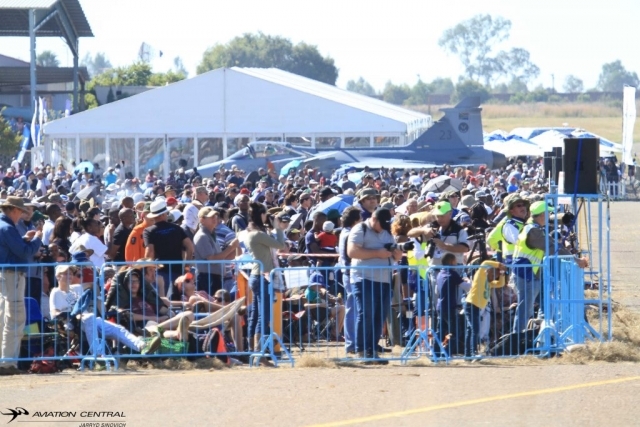 The SAAF Museum Airshow is designed to offer aviation enthusiasts, aviation institutions and publications ,the general public and as well as former and current SAAF an opportunity to reflect and or reminisce on the memories and presentations on history. 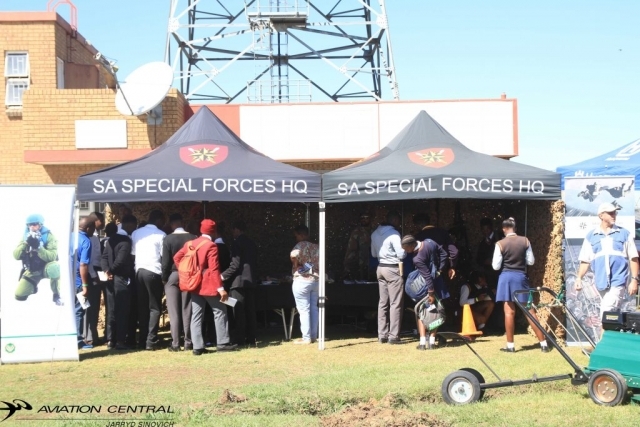 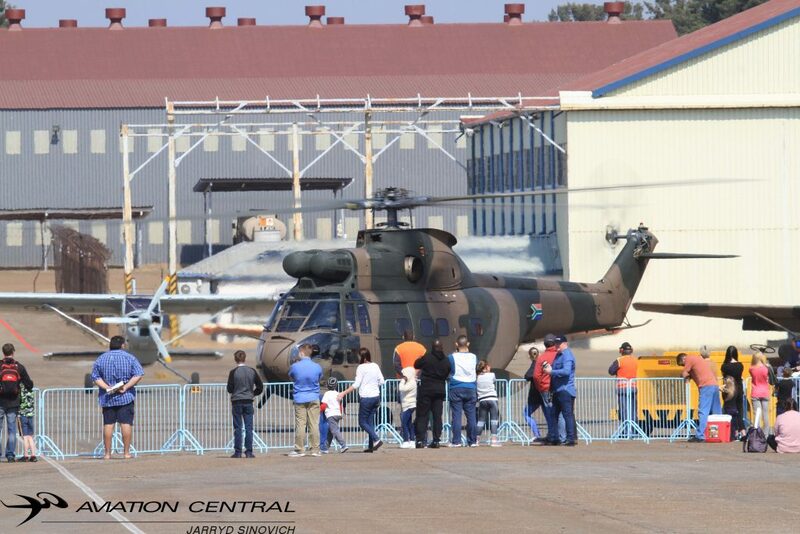 The day before the SAAF Museum and the SAAF hosted a career expo for learners around the Gauteng area. 14 different schools and a total of 1000 learners were invited to Hanger 4A to interact with some of the exhibiters including the south African Air Force. 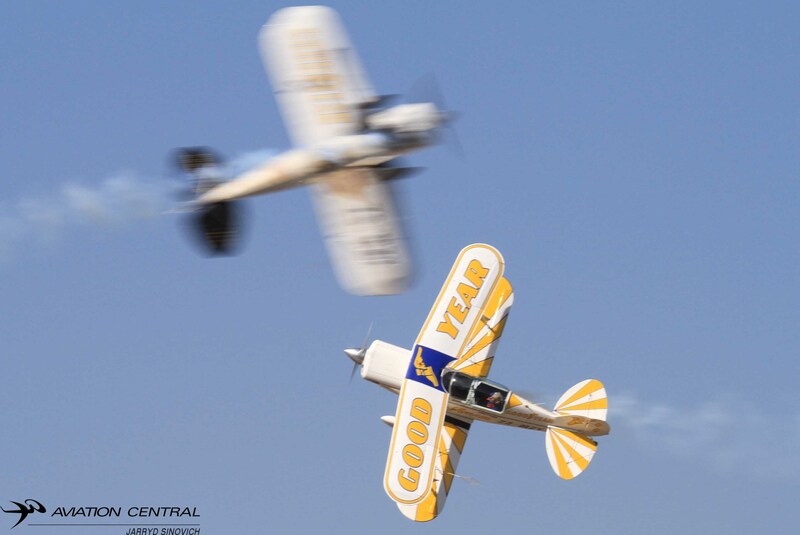 Plz Browse Advertisement(s) below to help keep us going! The show started with paragliders who filled the skies with much colour to their bright chutes they were using as well as a single gyrocopter all operating out of the Grasslands field not to far from Swartkops. 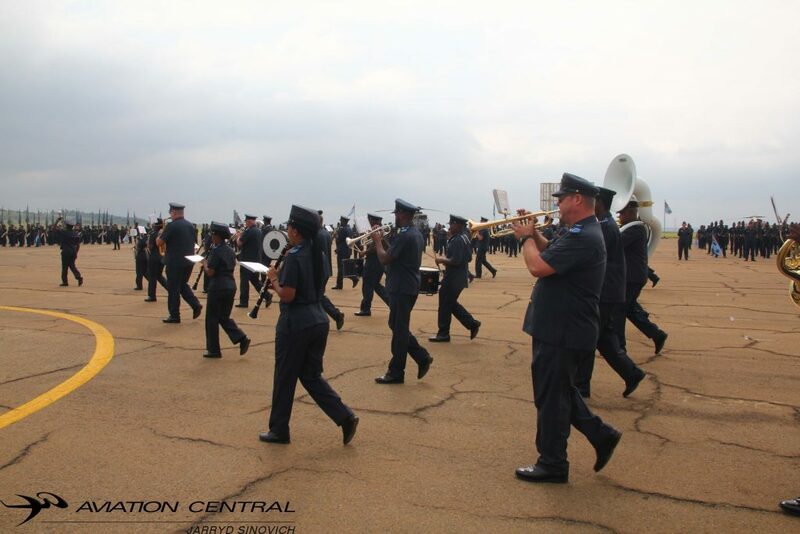 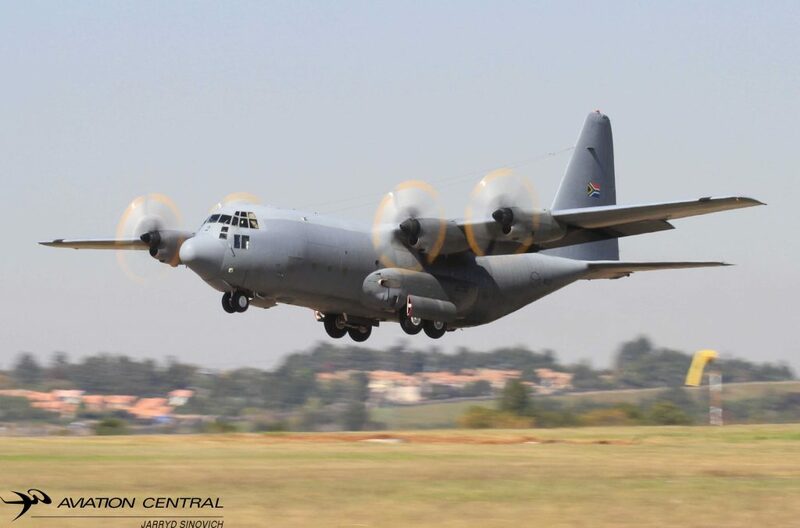 Next up the 28 Squadron C130BZ from AFB Waterkloof landed with a special surprise in being the SAAF Band that entertained the crowds until the show was officially opened, This has never been done at a airshow before in South Africa. The C130 then took off from the base to climb to altitude to drop the several parachutists from both the Golden Eagles Parachute team and member’s of the special forces.The landed just in time to meet and greet the Chief of the South African Air force Lieutenant General Fabian Zimpande Msimang and Officer Commanding Airforce Museum Swartkops Lieutenant Colonel Melvin Bruintjies. 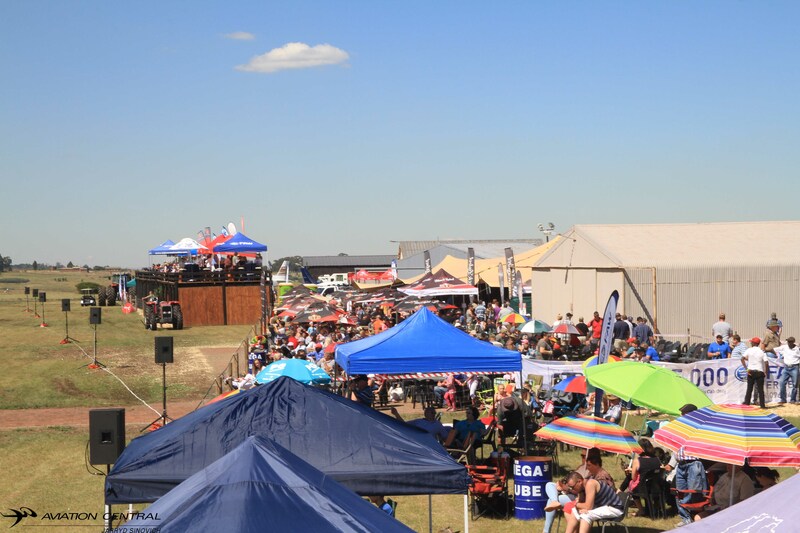 Capital Sounds provided sound equipment for the large crowd line, excellent commentary from Brian Emmenis,L eon Du Plessis and Elvis Manene. 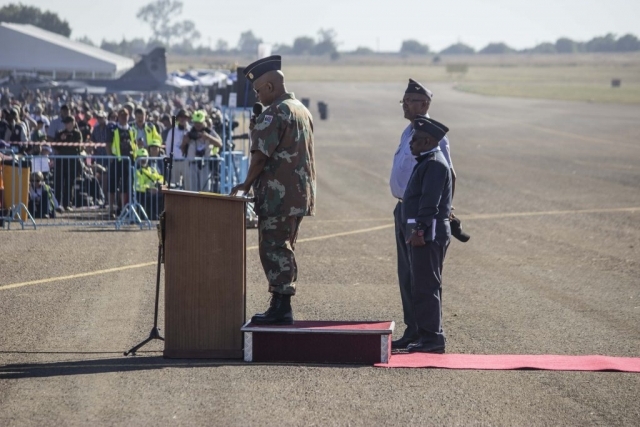 SAAF commentators that provided information for the ever eager public was Colonel Lance ‘Lancelot’ Mathebula who also provided commentary from one of the Hawk Mk120s during simulated top cover during the mini war.A first for a airshow. 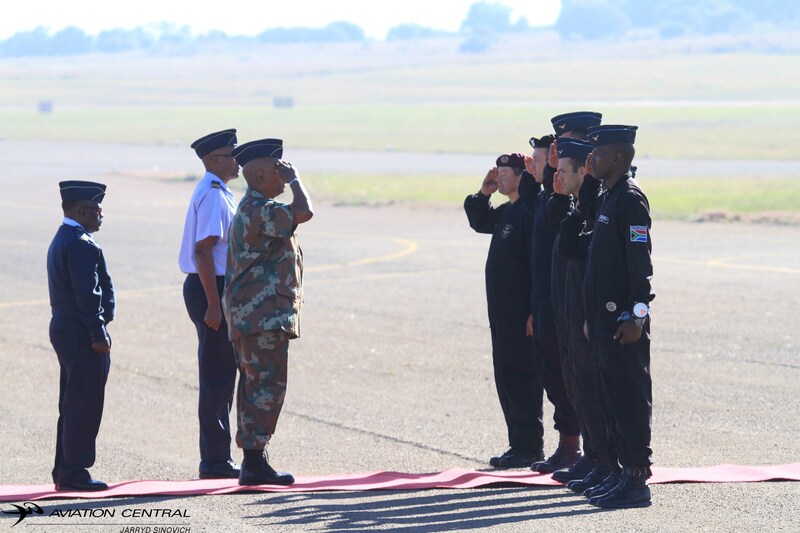 He was also joined by two new hawk pilots Captain ‘Comet’ Mfeka and Tiisetso ‘Lego’ Legodi. 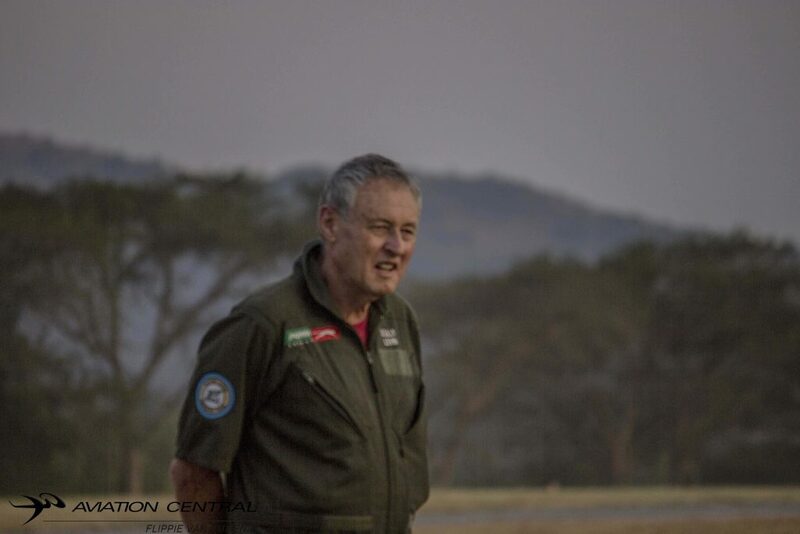 Airboss for the show was Colonel Keith Fryer and also commentated during some of the display slots, Colonel Keith Andrews was ramp Boss and some of the best SAAF ATC’s were present keeping the airspace safe for display routines. The show was opened by the Hawk Mk120 ‘Gannet’ flown by officer commanding of 85 Combat Flying School Craig ‘Shark’ Leeson,showing what the lead in fighter trainer is capable of and training the new generation fighter pilots on the type. 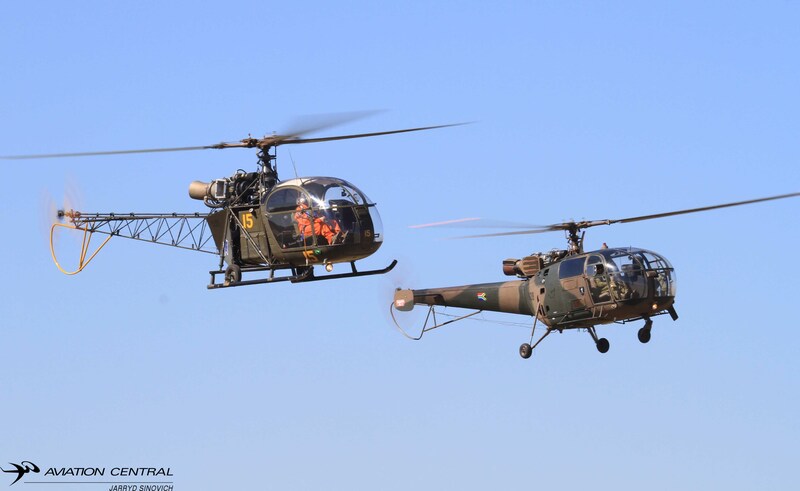 The SAAF Museum heritage flight were straight after the Hawk landed,first up the helicopters consisting of the Alouettes II and III and Aerospatiale Puma.The Cessna 185s were soon over head the field followed by the formidable sound of the Atlas C4.M Kudu and Bosbok and Harvards.Glen ‘Gringo’ Warden flew a gentle solo display in the De Havilland T55 Vampire. 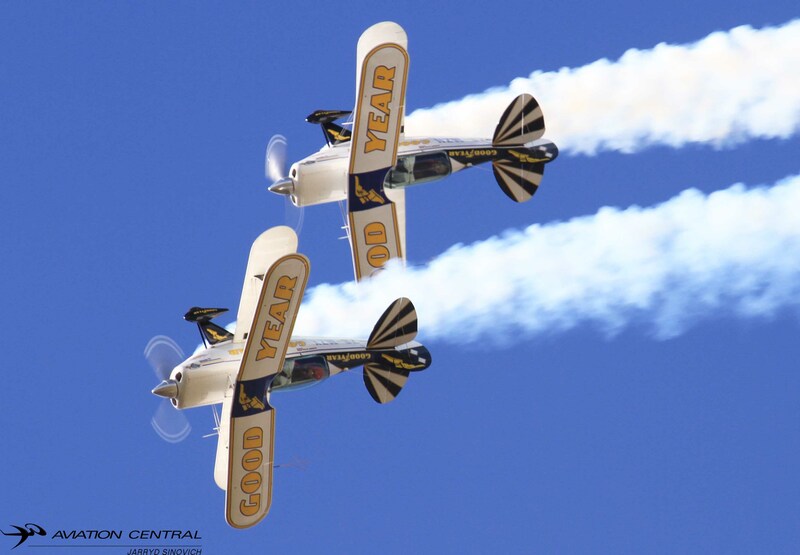 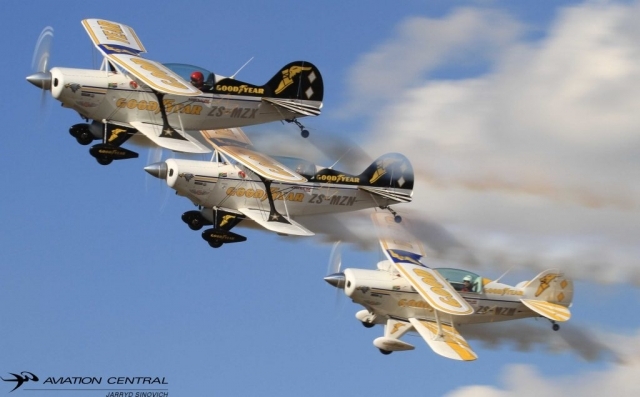 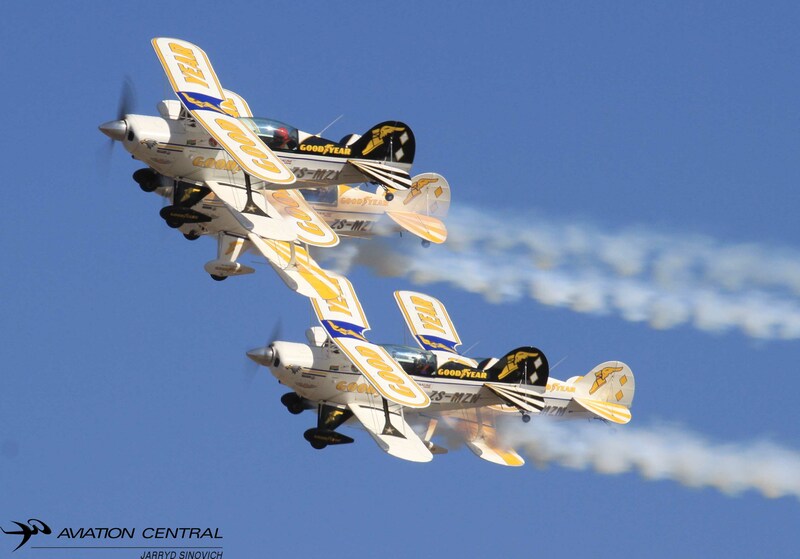 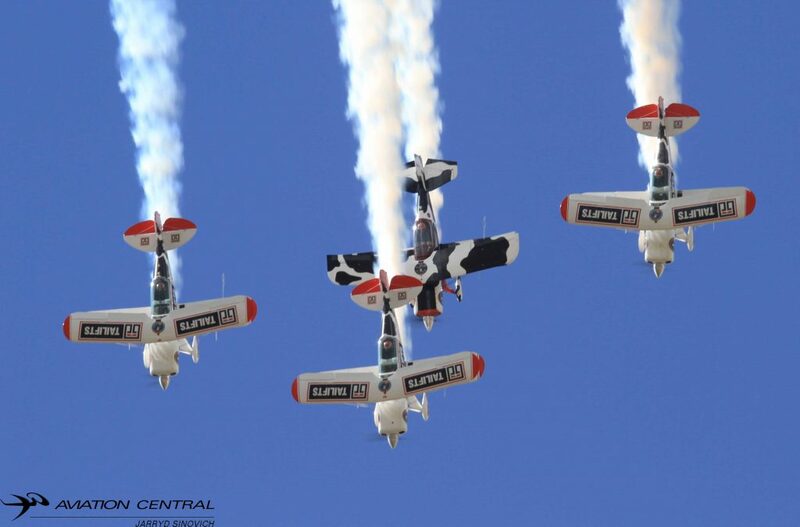 The Rand Based Pitts Special teams flew their high energy display being the new Cows Aerobatic Team and the Goodyear Eagles Aerobatic Team led by Glen Warden, Johan Von Solms both ex fighter pilots joined Nigel Hopkins and Jason Beamish. Team Extreme performed their first airshow as a four ship led by Nigel Hopkins,Mark ‘Sammy’ Sampson,Mark ‘Bugs’ Hensman and Jason Beamish. 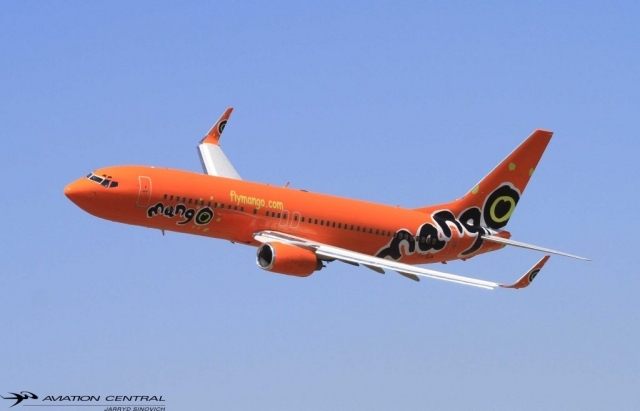 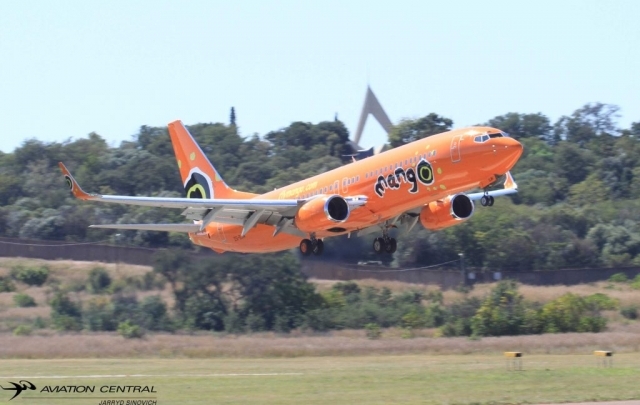 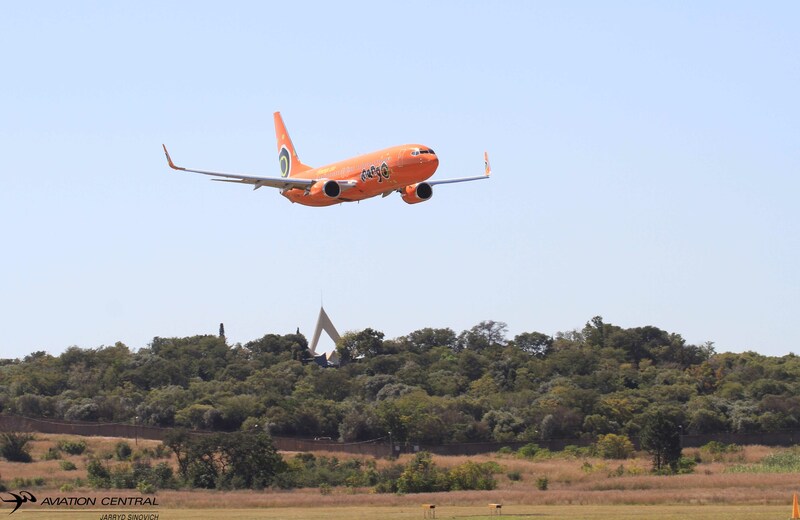 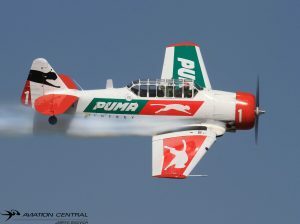 The Mango 737-800 was flown out of Lanseria International Airport to display at the show by Captain Scully Levin and Captain Rodney Chinn.The Puma Flying Lions also flew a great display and were part of the 12 Harvard mass shutdown towards the end of the day! 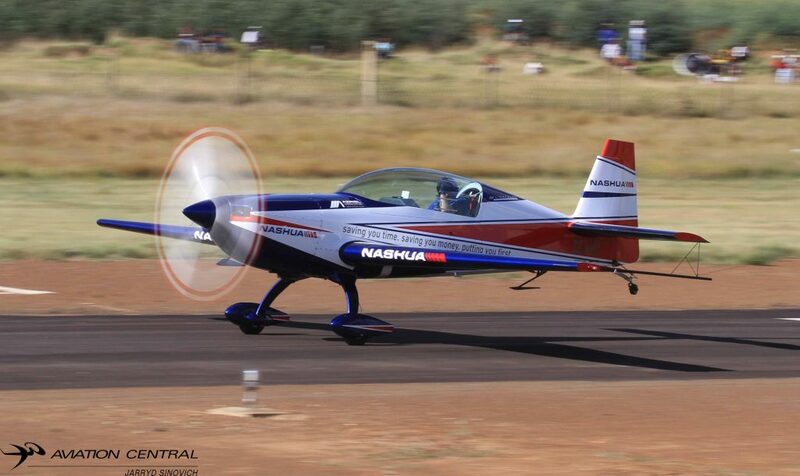 Andrew Blackwood Murray Displayed the Nashua Extra 300L and other aerobatic slots saw Patrick Davidson who flew up from Port Elizabeth in his Red Bull Sponsored Sbach 342, it was great to see Patrick at a airshow on the Highveld, he was joined by unlimited aerobatic class pilot Barrie Eels in his new Extra 330sc in a dual display of intense aerobatics. 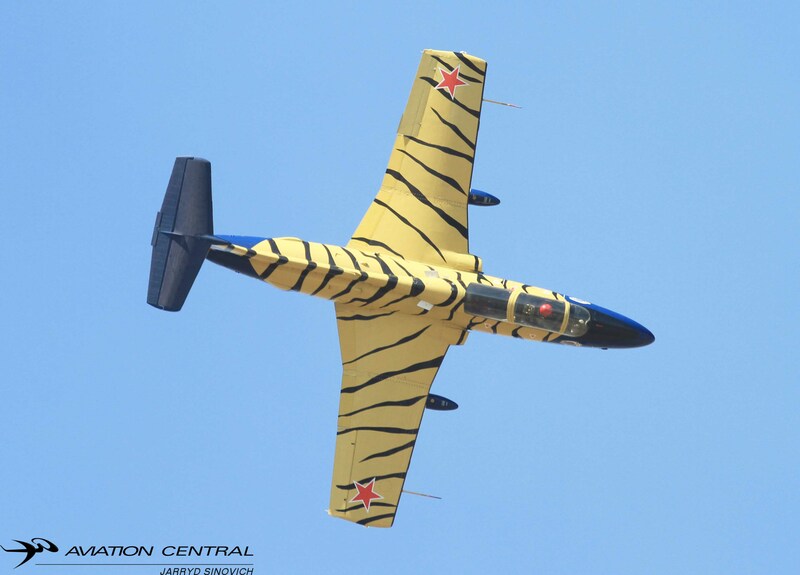 Ex Russian Jet trainers that flew at the show was Ex Sasol Tiger L29 ZU-AUX and L39 ZU-TEE in its new colour scheme,both flown by Glen ‘Gringo’ Warden.He definitely kept the photographers happy with his display passes. The mini war that the crowd got to witness was a absolute treat to see the new and the old from the choppers,that being the Puma and the Oryx helicopters. 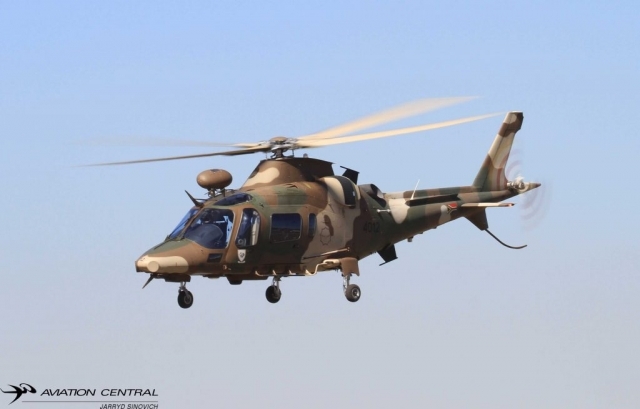 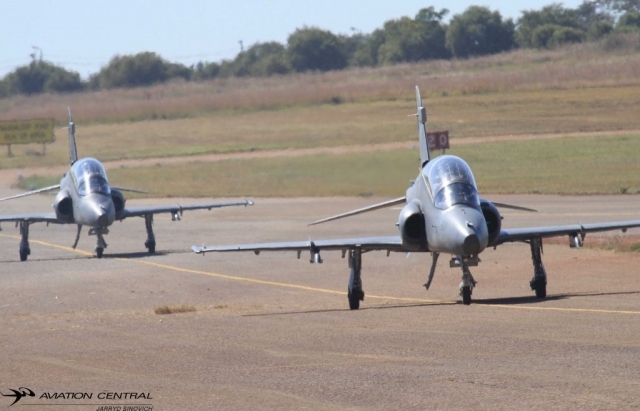 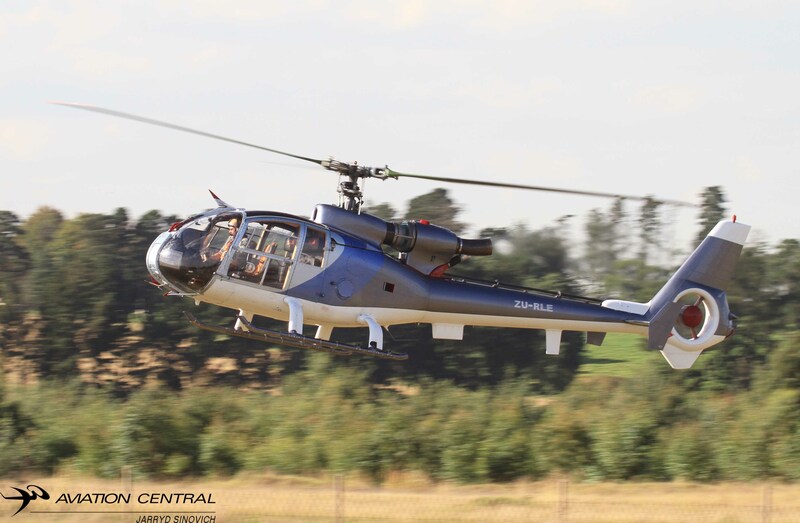 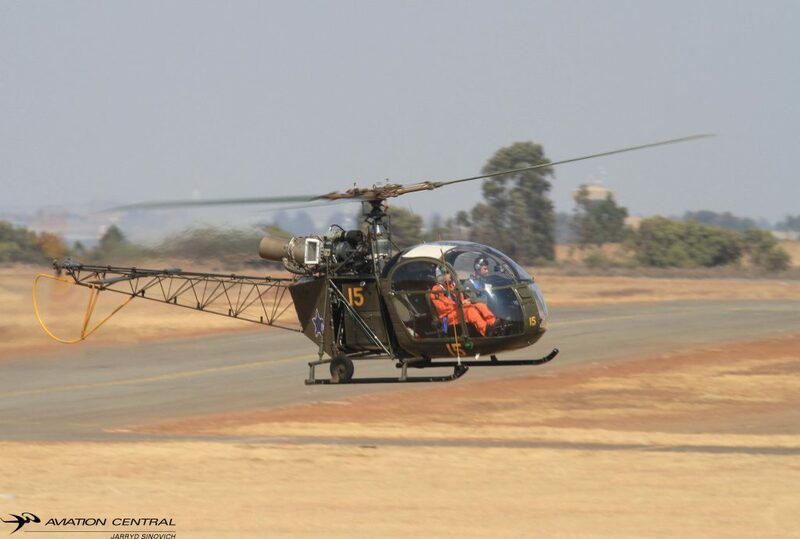 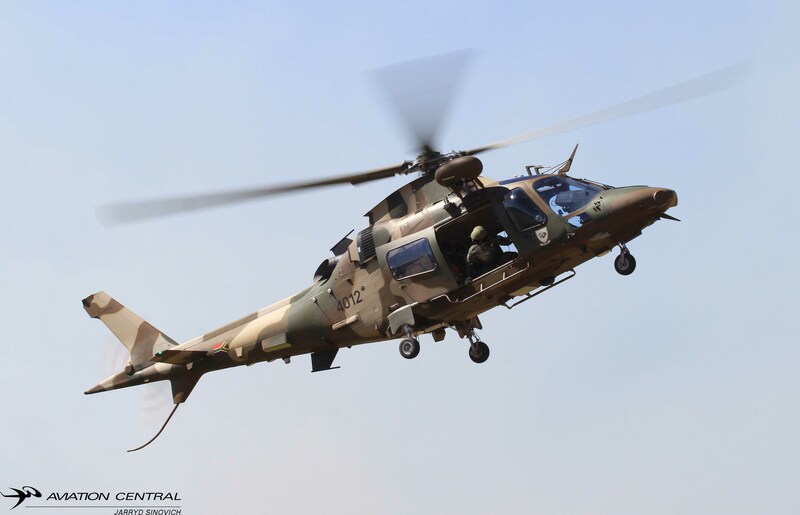 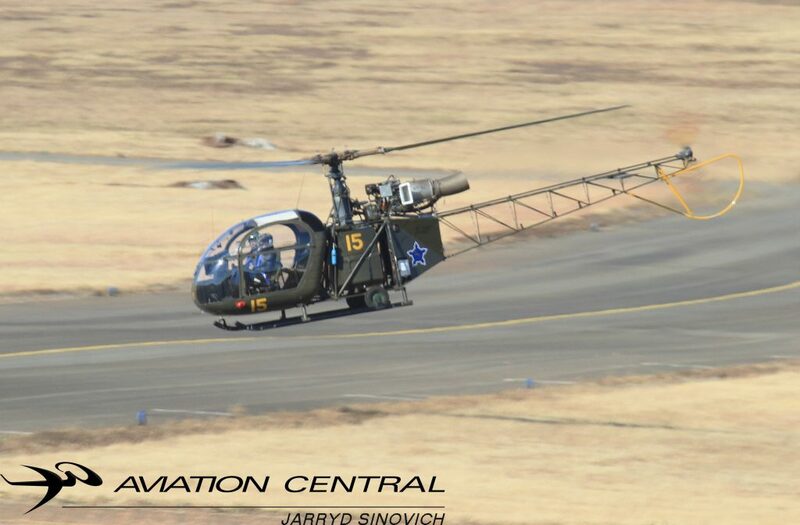 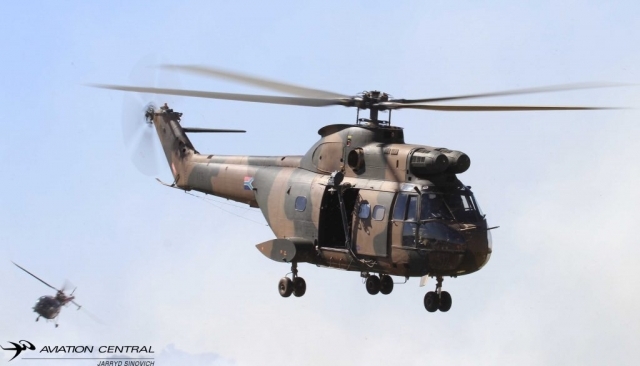 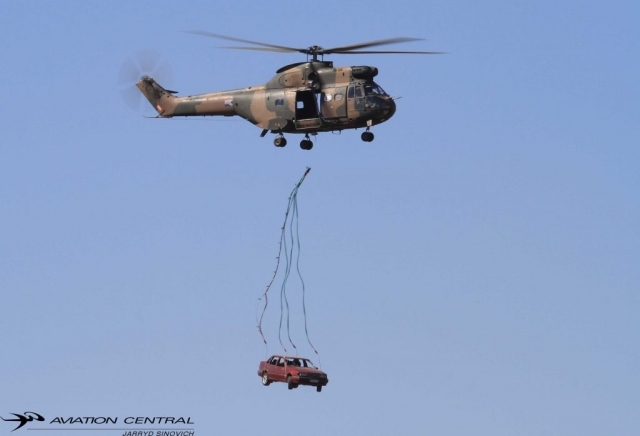 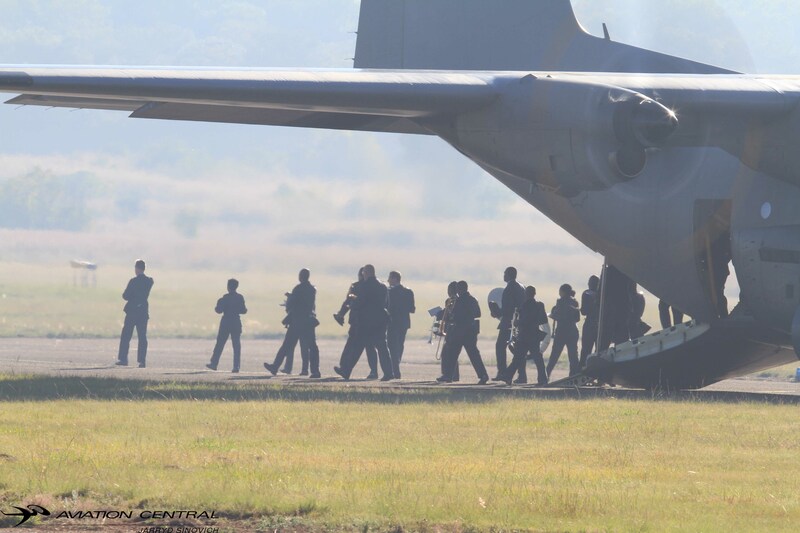 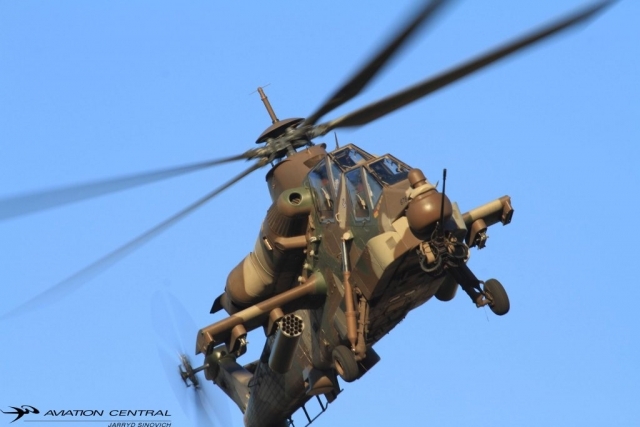 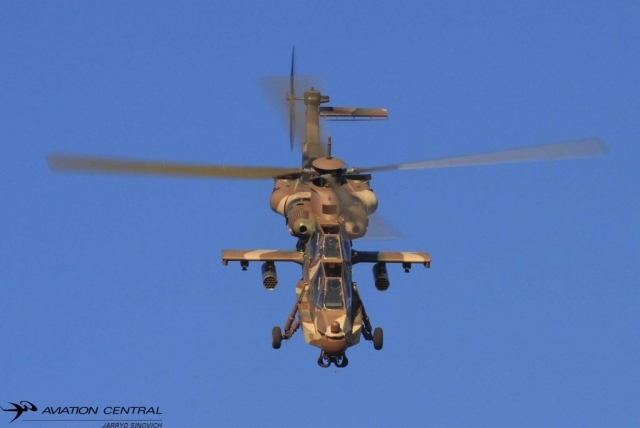 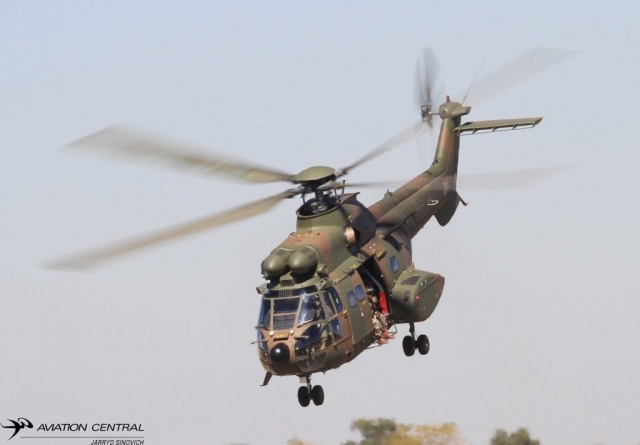 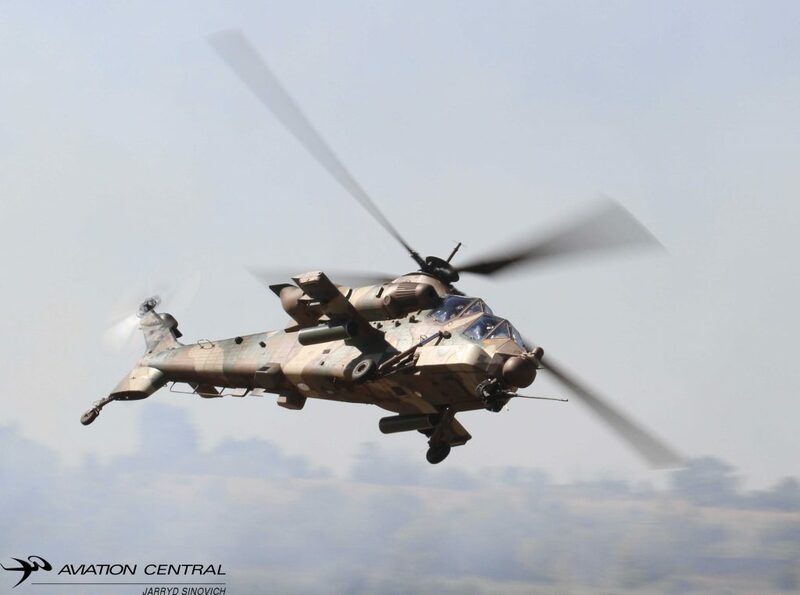 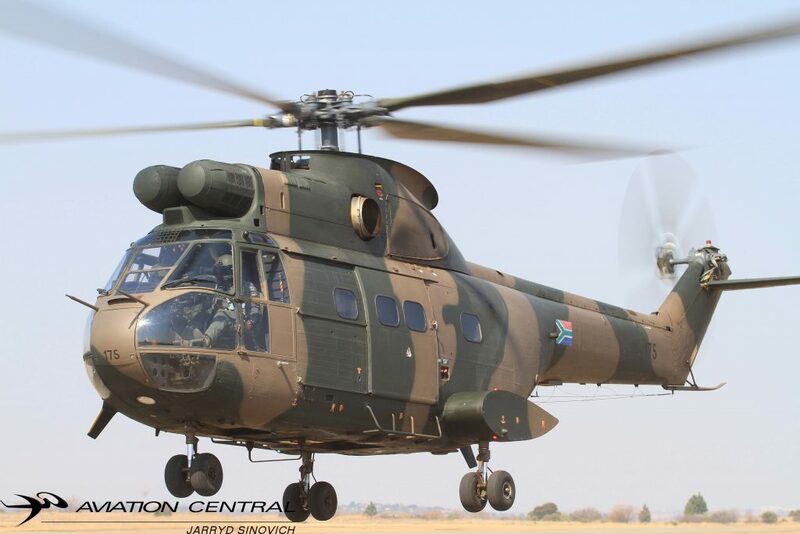 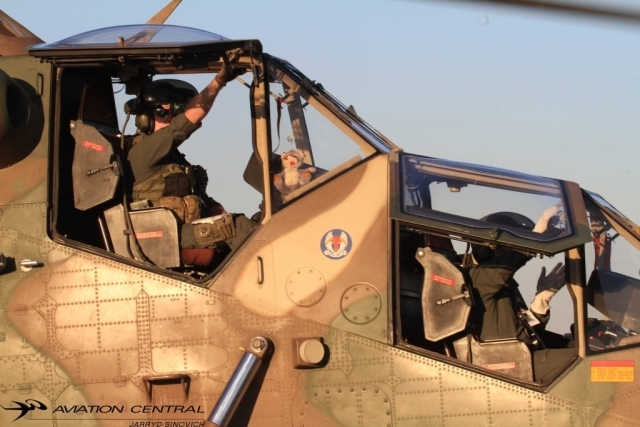 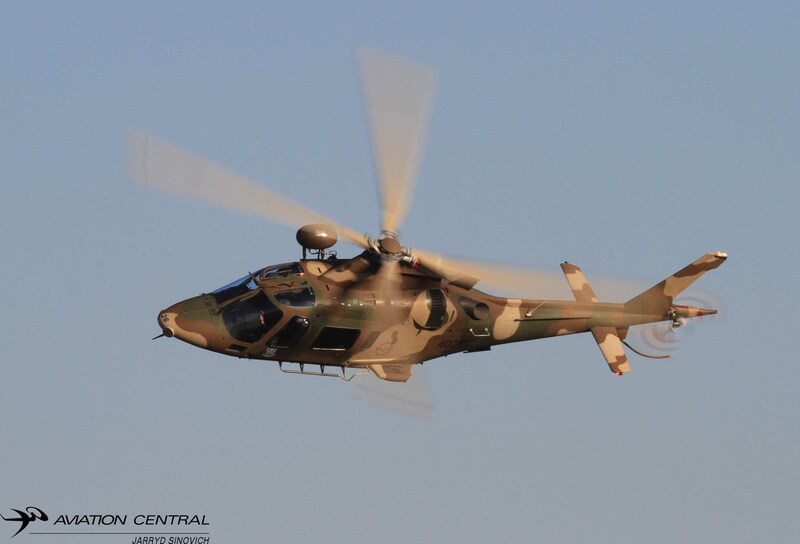 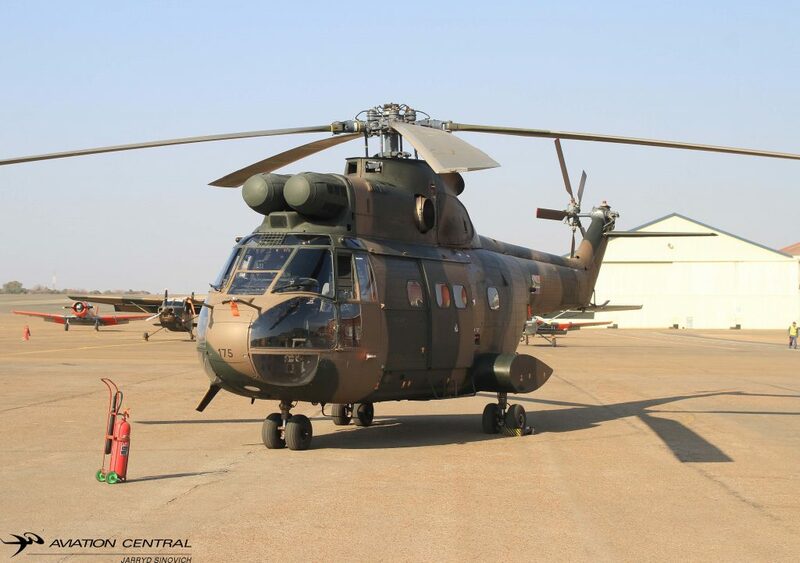 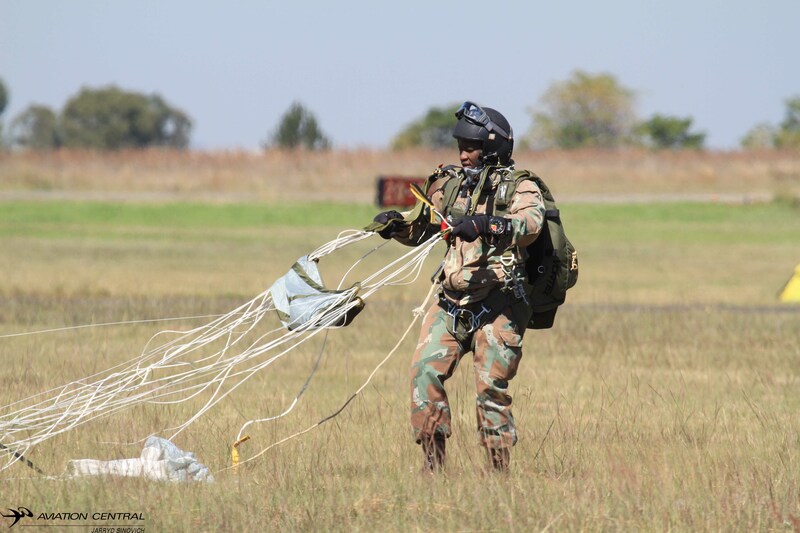 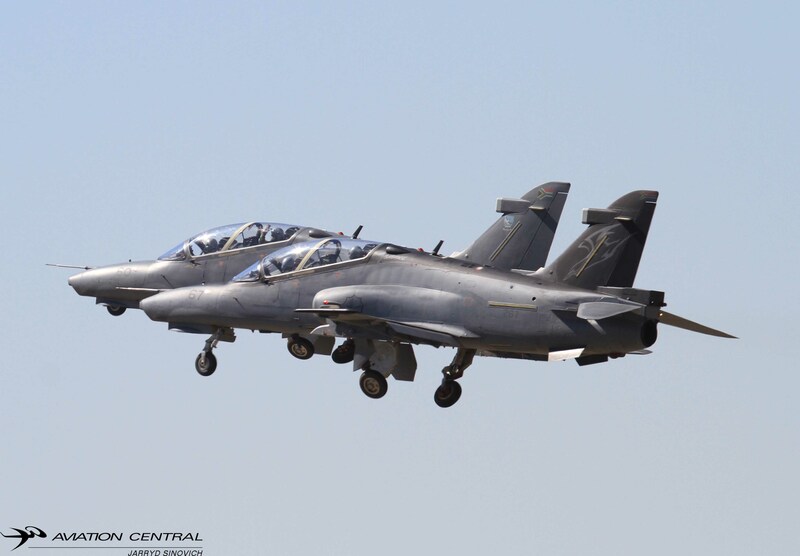 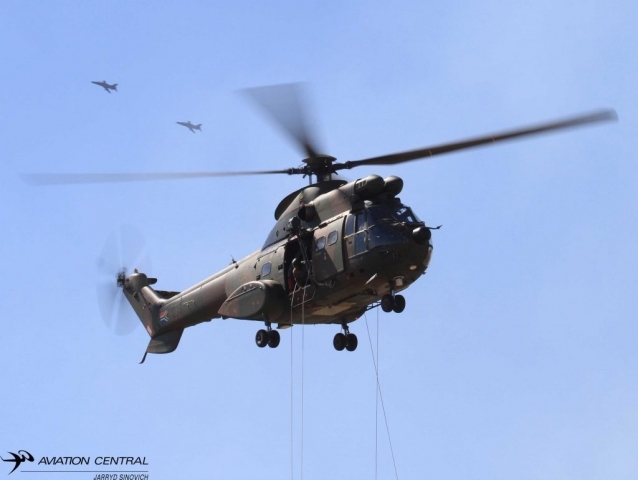 The gunships saw the Alouette III and Rooivalk and two Agusta A109LUHs.The bosbok was also flown in the demonstration simulating airstrikes as well as two Hawk MK120s flown by Simon ‘Seraph’ Theunissen and Jabulani ‘Cyrax’ Mabona. 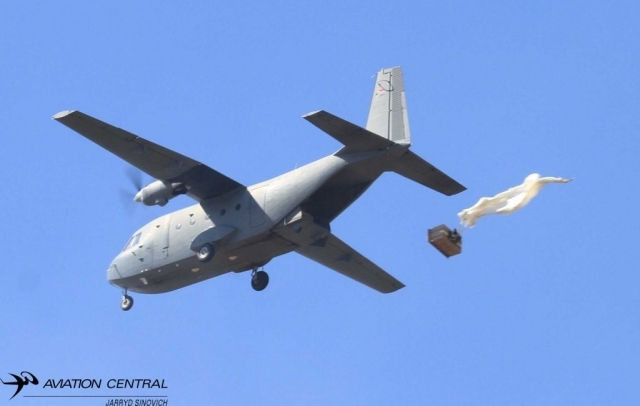 The C130 was used to drop parabats on the far side of the field and the 44 Squadron Casa 212 was utilized for a supply drop, while the army engineers provided pyrotechnics in the background. Major Geoffrey ‘Spartan’ Cooper showed off the JAS39C Gripen from 2 Squadron, he definitely shows the aircraft well and in its limits. 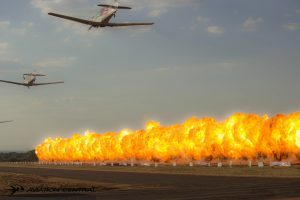 The crowds were on their feet during his famous dump and burn. 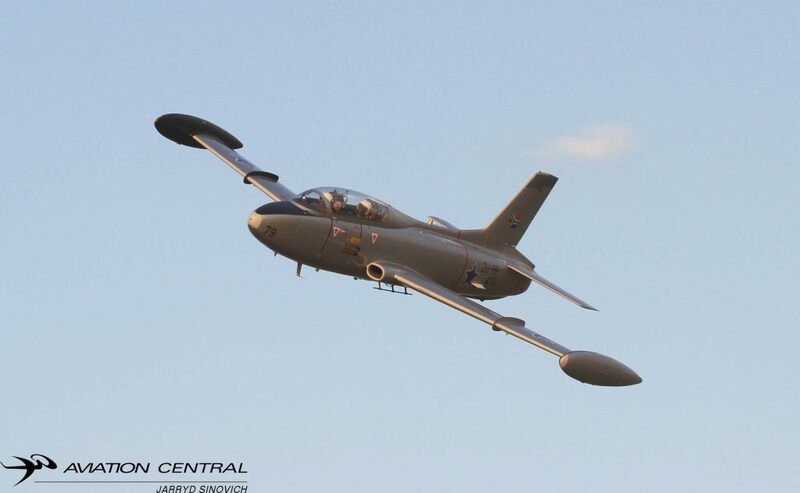 The Pilatus PC7MKII was put through its paces by Major Bheki ‘Swaziboy’ Shabungu. 15 Squadron pilot Major Diaan Grobbelaar flew a awesome display in the Agusta A109LUH as well as Paul ‘Raccoon’ Kempthorn in the 16 squadron Rooivalk,great display from the chopper boys. 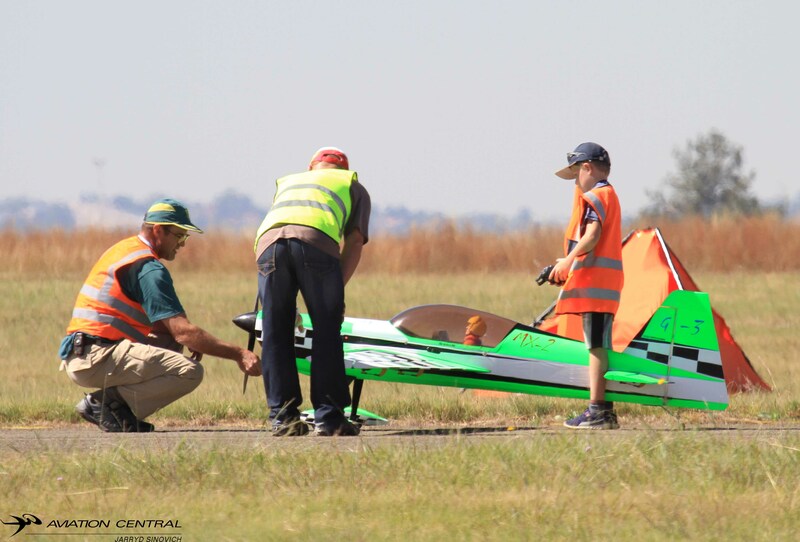 The youngest airshow participant on the day was Ger-Drie de Beer flew his RC MX2,what a great display he did for the thousands of people he displayed for. 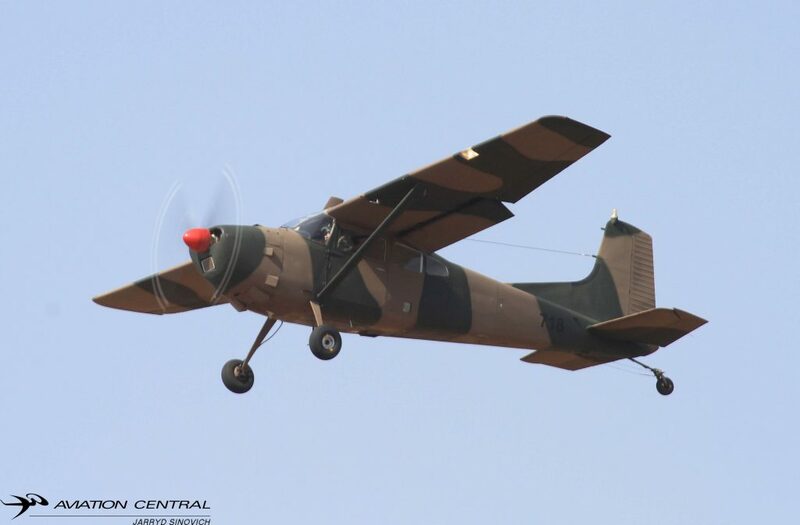 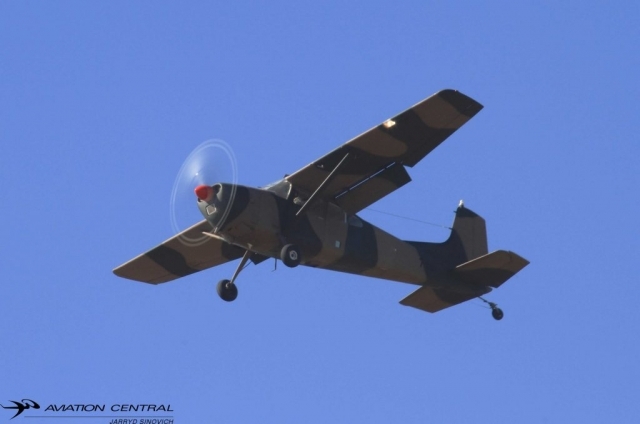 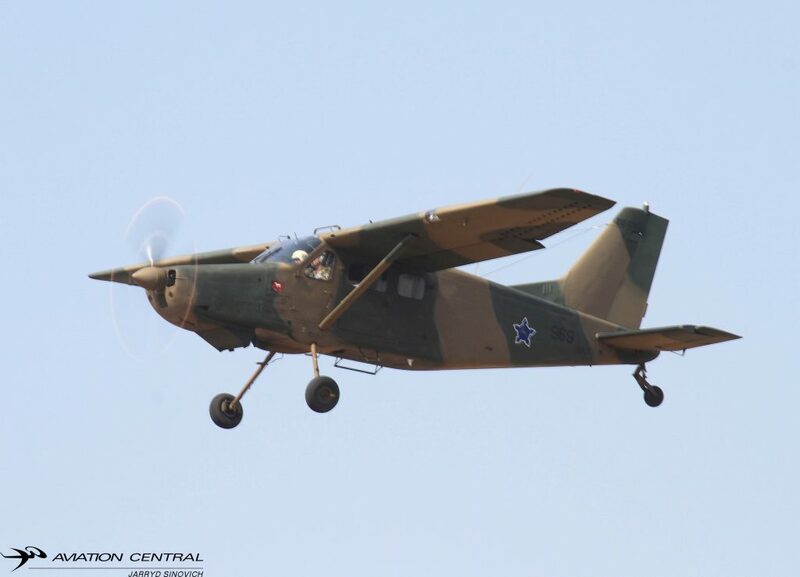 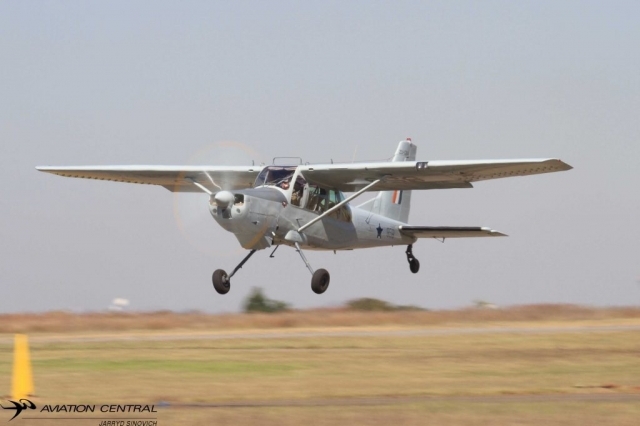 Retired Gen. Des Barker few the first airshow display in the Atlas Angel, which is a upgraded Kudu with a Pt6 turbine engine, Gerrie ‘Sparkie’Pretorius flew a brilliant tight display in the Museum Cessna C185. 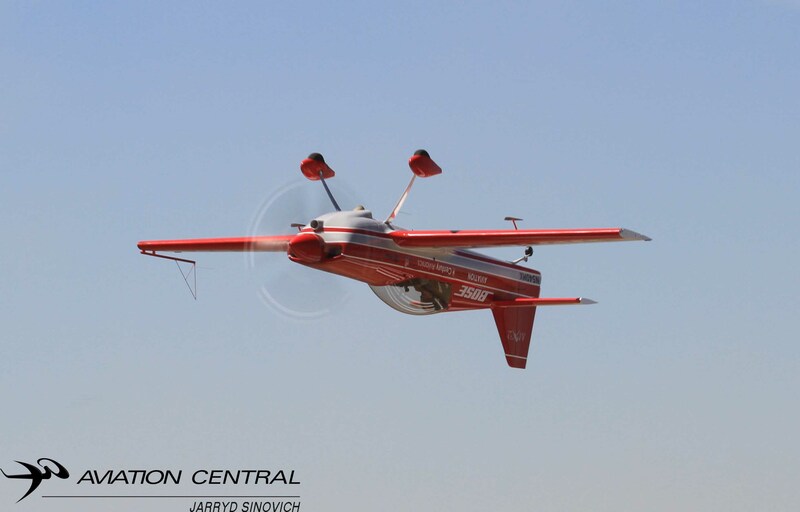 ‘Little Annie’ an Antonov 2 showed why its the worlds largest Bi-Plane piloted by father and son team Mark and Jon-marc Hill. 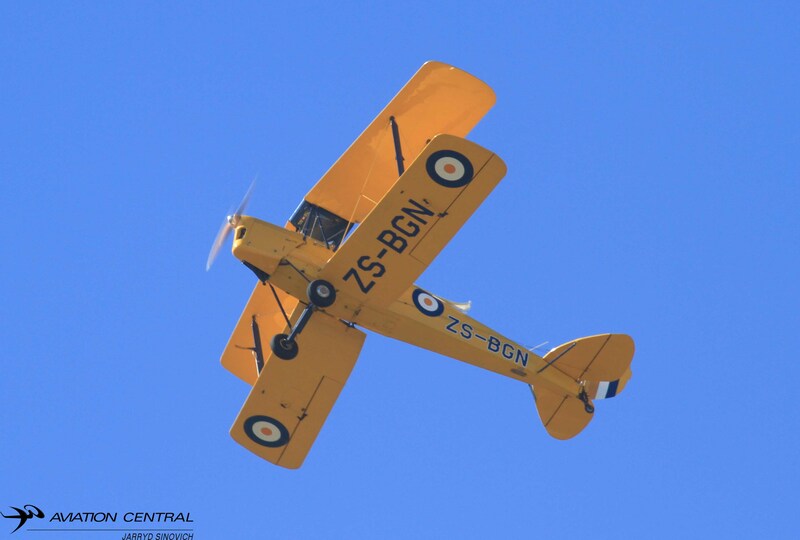 Jeff Earle flew his Vereeniging based De Havilland DH. 82 Tiger Moth.The Randolph sponsored Boeing Stearman flown by Comair Boeing Captain Ivan van der Schaar.28 Squadron flew their usual low-level routine in the C130Bz from 28 Squadron flown by Clint Hawtrey and Caro Duven. 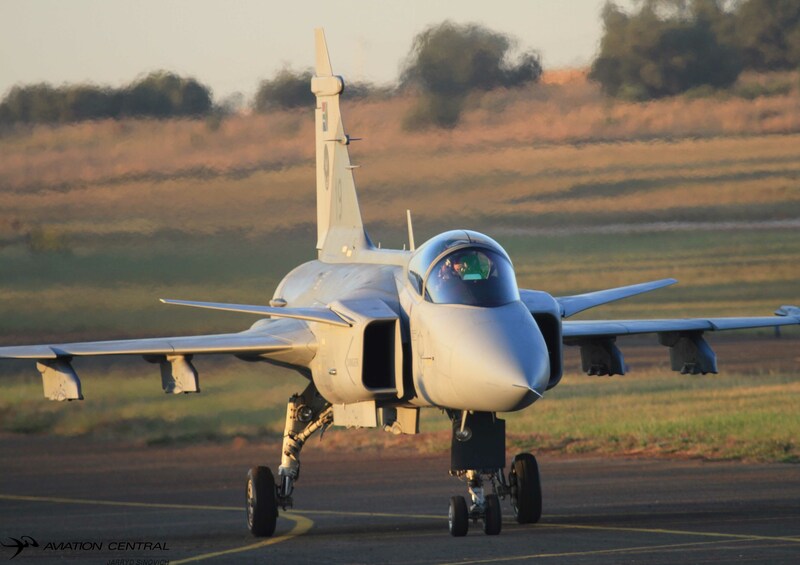 The SAAF Museum Puma dropped a car that apparently parked where it shouldn’t of been ,the public made sure it wasn’t their vehicle at the end of the day.At the end of the last act being the Gripen,Captain Mark Kelbrick proposed to his wife to be in front of of a large crowd who waited until the last slot of the day had been flown. 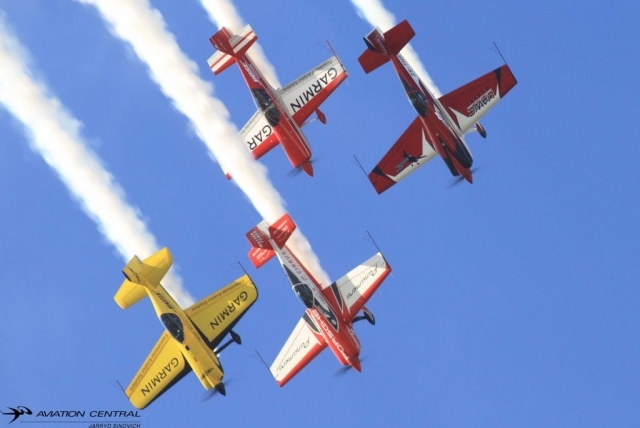 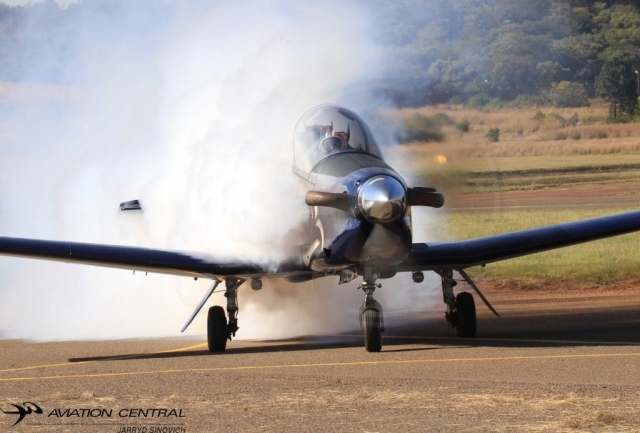 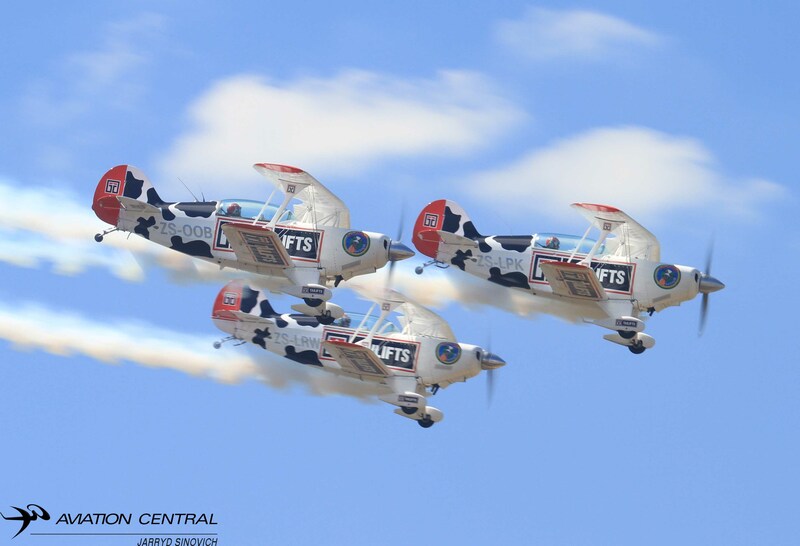 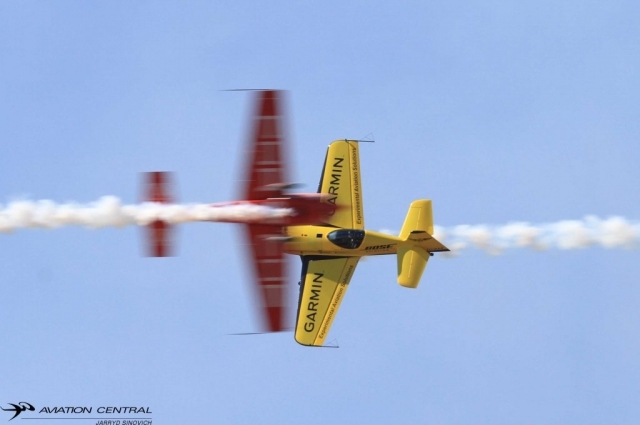 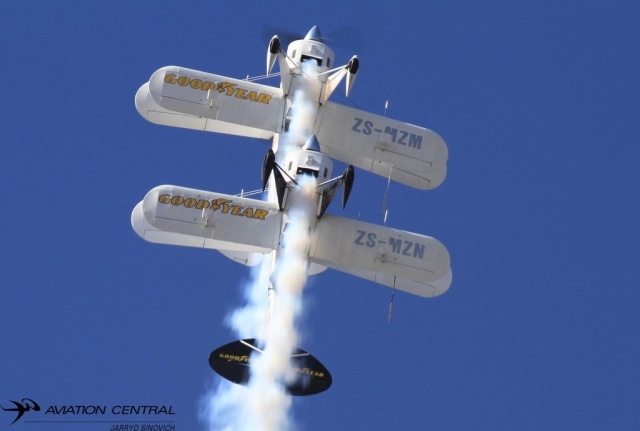 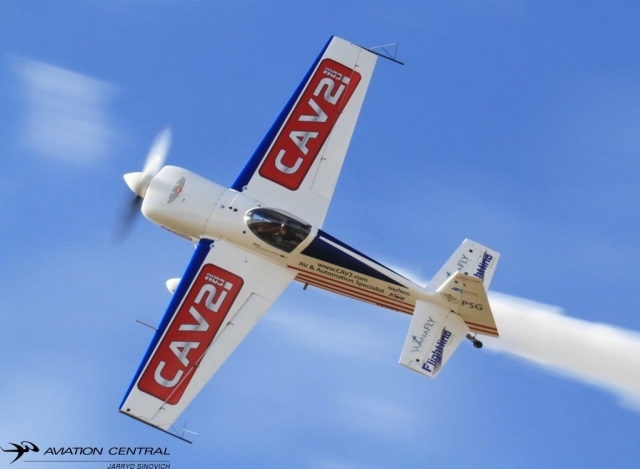 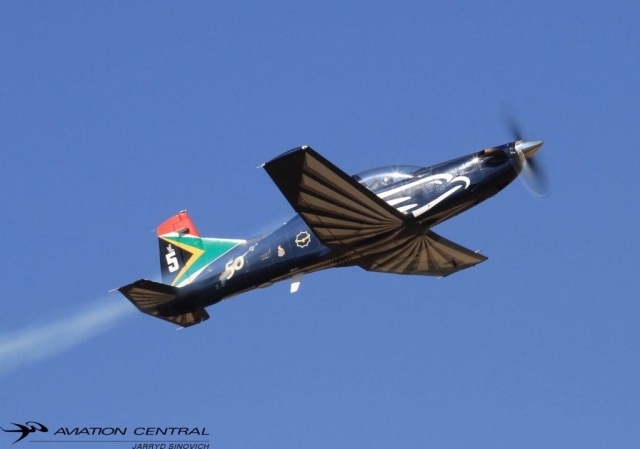 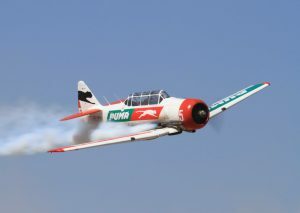 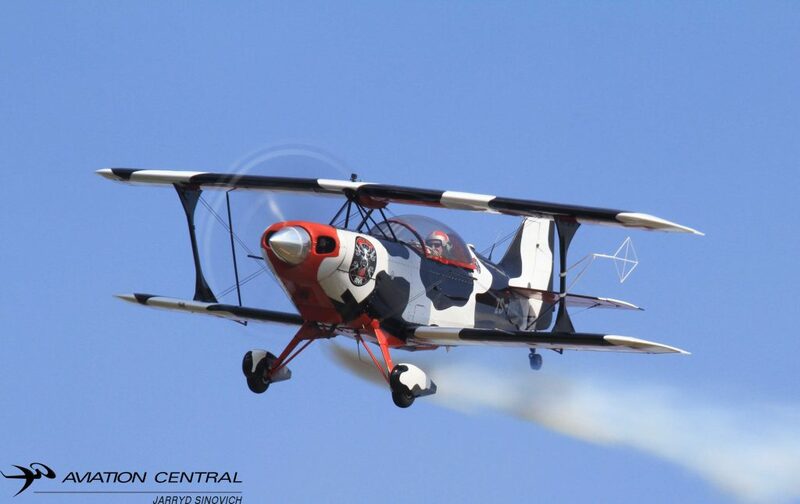 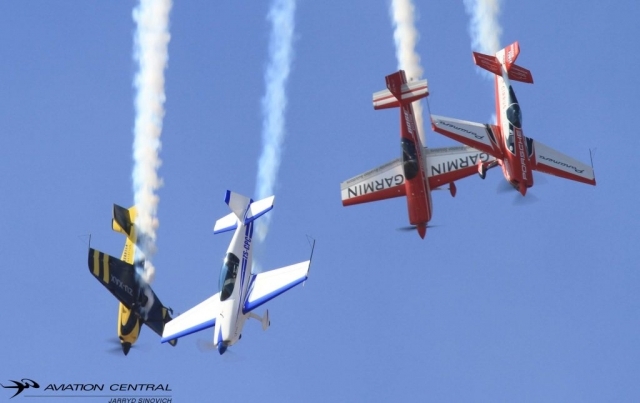 The great Ermelo Airshow has finally returned to the Airshow circuit once again, after an absence since 2011. The show made a welcome return on the 7th April 2018 under the Gert Sibanda Local Municipality. 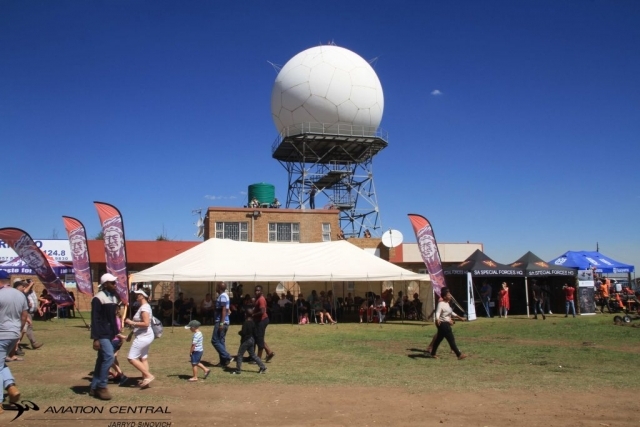 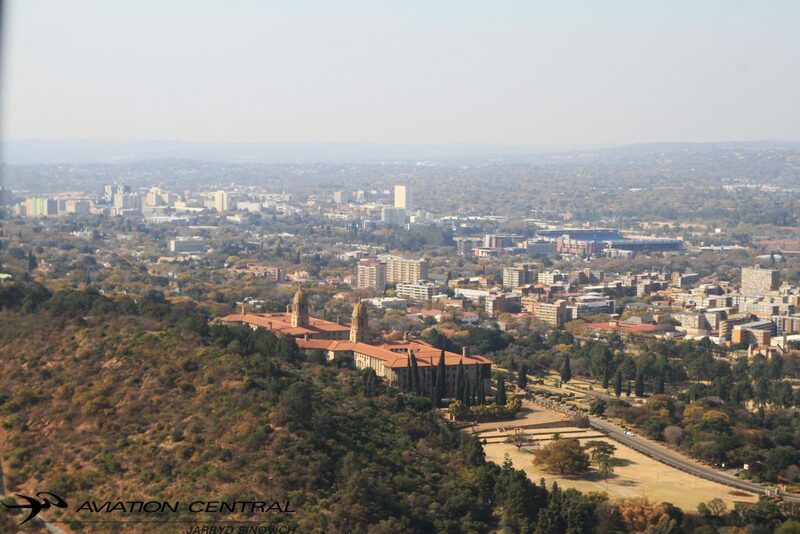 Ermelo is situated 210 kilometers east of Johannesburg. 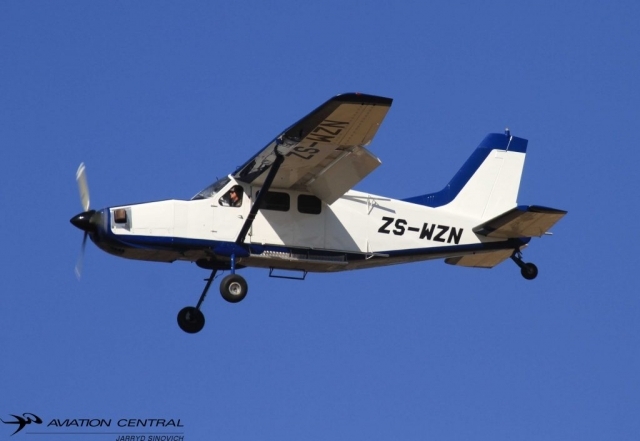 It is both a mixed agriculture and mining region of South Africa.The airfield sits at 5700 feet MSL, pilots took the proper precautions as this was not a usual airfield pilots are used to flying at. I was fortunate to fly into Ermelo airfield the day before the show with the Hill family in their beautiful strong Russian Antonov An2 “Little Annie” from Wonderboom National Airport in Pretoria.We arrived at the field with full of smiles from organisers and marshals,welcoming us and providing us with some of the best hospitality one can ask for. 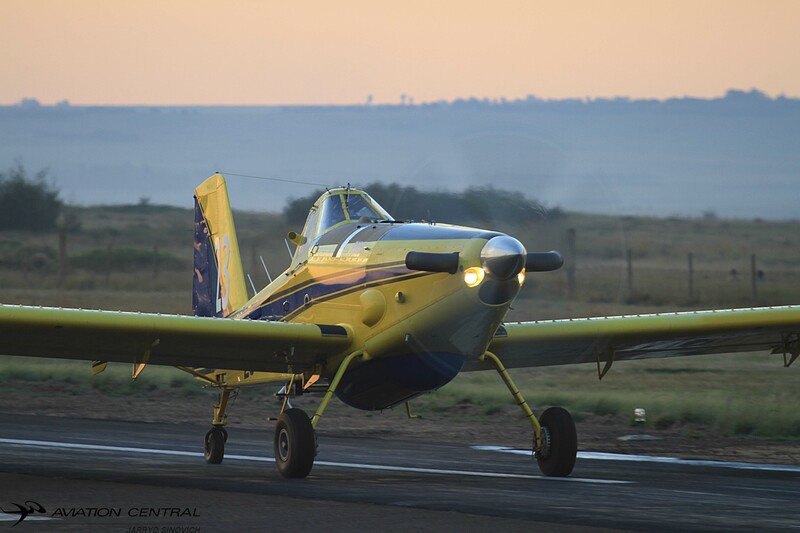 That evening we were again treated to a lamb spit braai for all the pilots and VIPs that were invited to the braai.At this point of time the next day would see most display pilots and other aircraft just flying inn for the show. 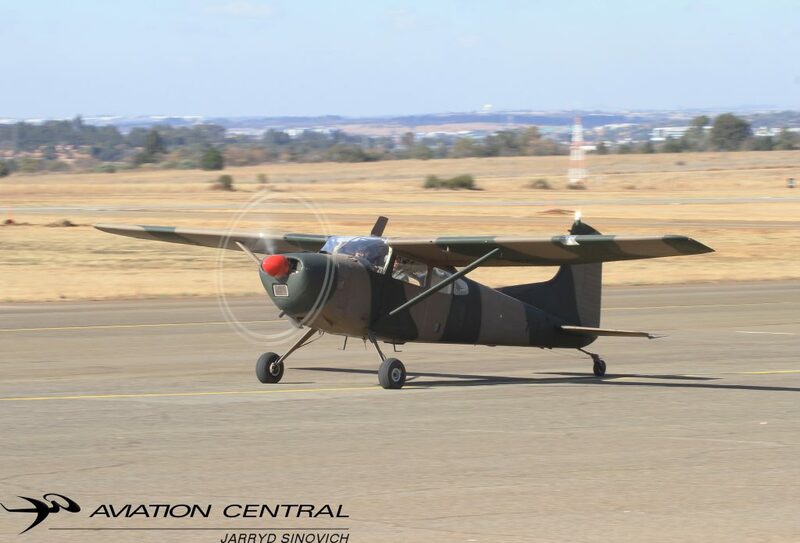 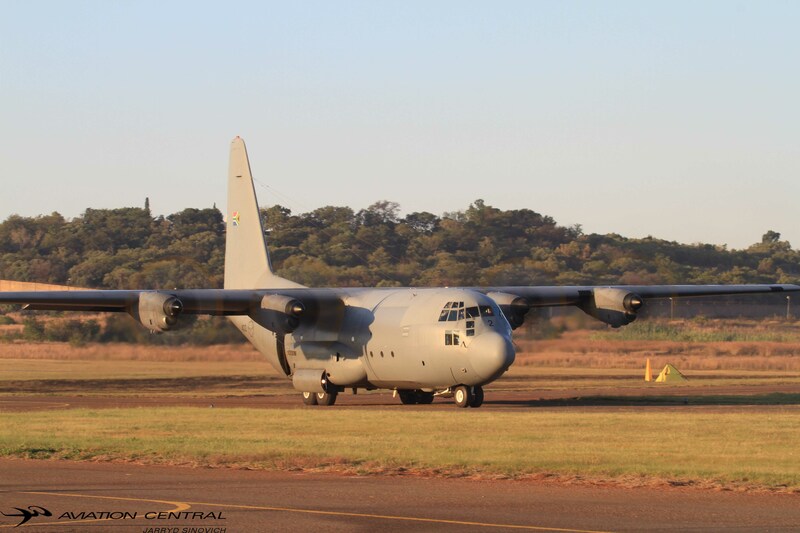 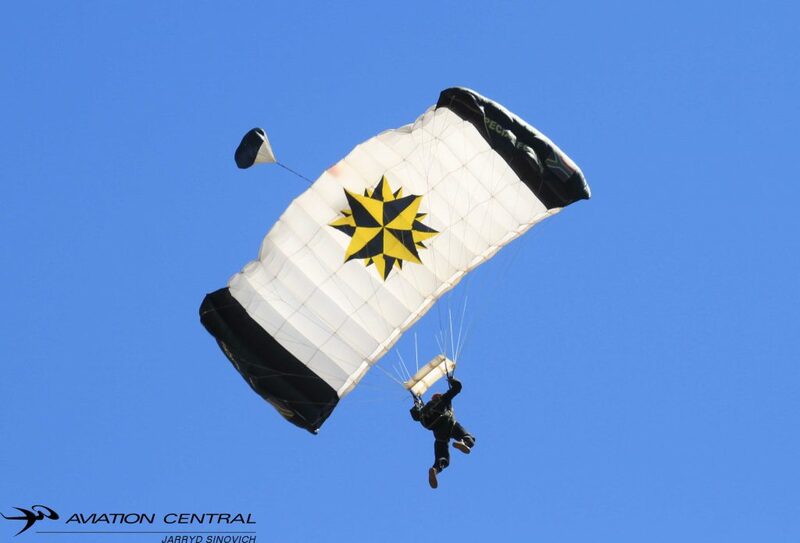 Apon arrival at the airfield on Saturday the 7th April,we were blessed with beautiful weather for flying.As aircraft after aircraft arrived.The show started off with a parachute drop with SANDF Special Forces ,their jump ship was the An2 “Little Annie”. 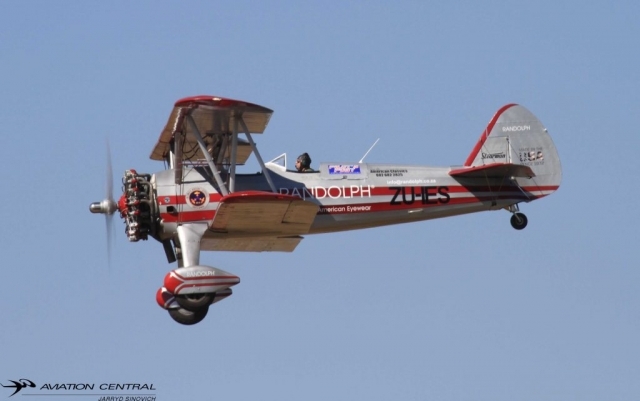 The An2 was then showed why it is the worlds biggest single engine bi-plane flying in the world today flown by Jon-Marc and Mark Hill. 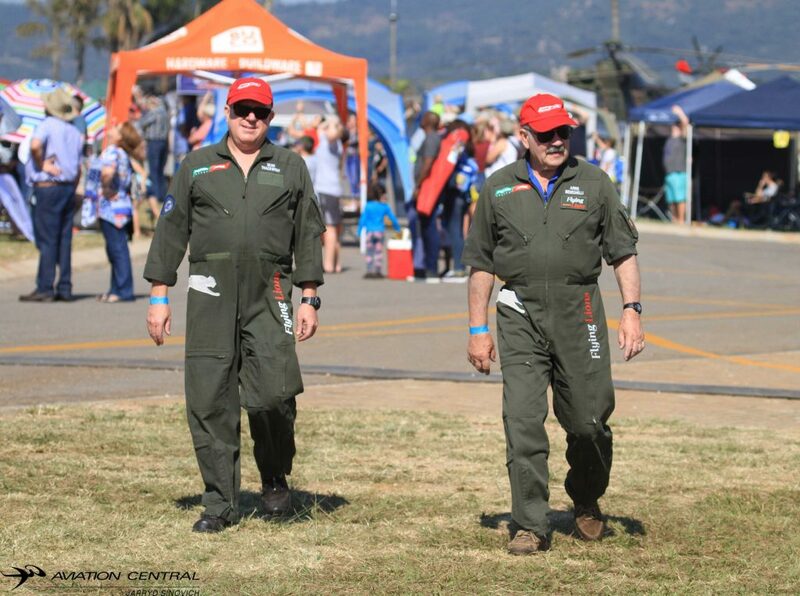 Ensuring the airshow ran smoothly during the course of the day, safety officers Pete Graham and Trevor Wilson and display directors Kishugu’s Johan Heine was show boss for the day.The Capital Sounds team arrived the Friday before the show to set up for the show, Brian Emmenis and Leon Du Plessis provided excellent commentary and ensuring all information on aircraft and pilots flying on the day. 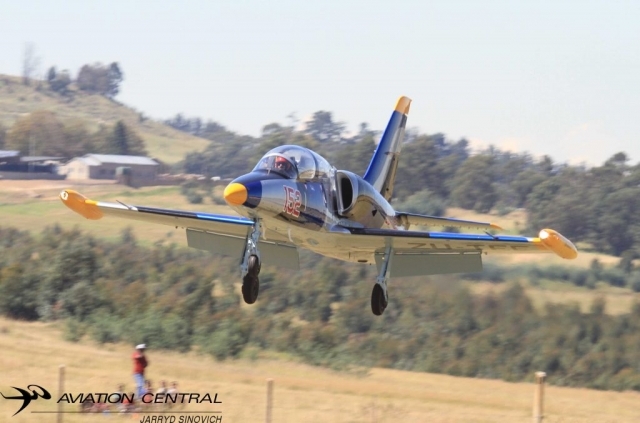 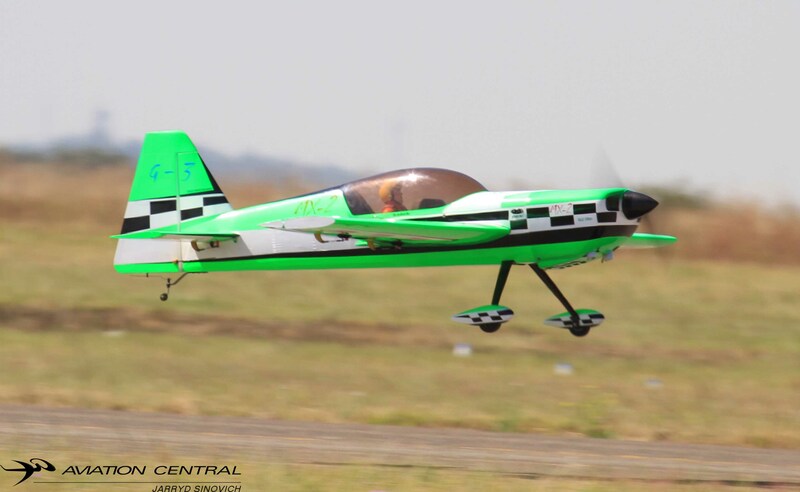 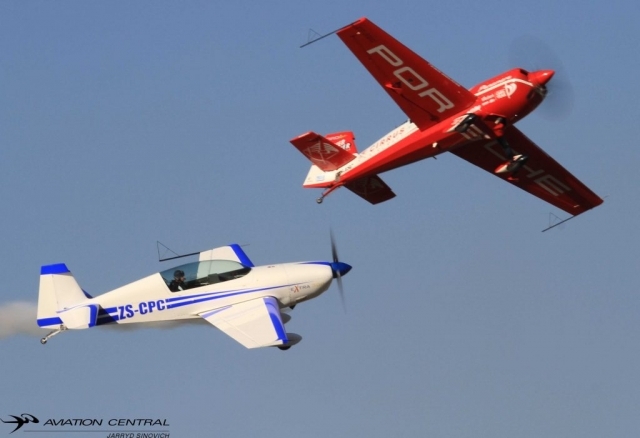 The Ermelo RC Club was next with two RC aircraft, while Neville Ferreria was soon up after the RC display. 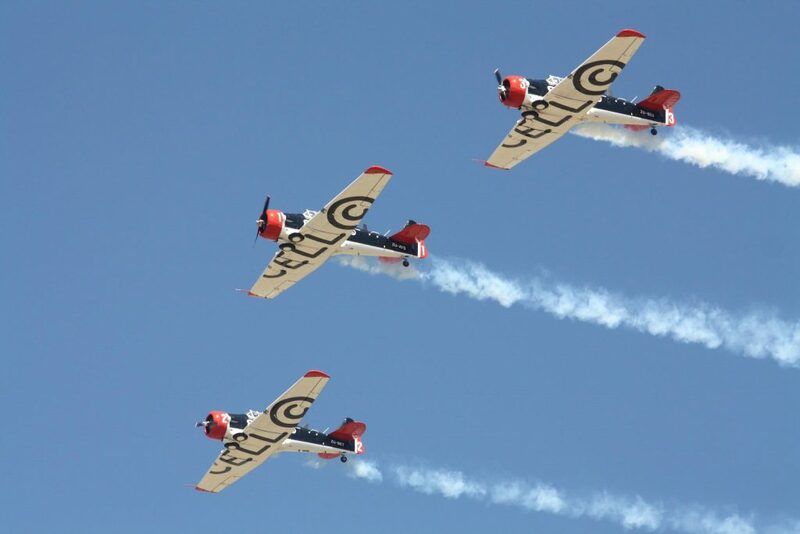 His sequence showed part of what the unlimted Aerobatic team level is sitting at. 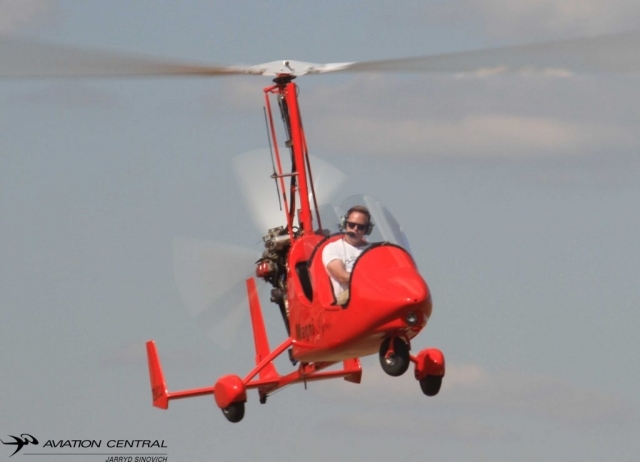 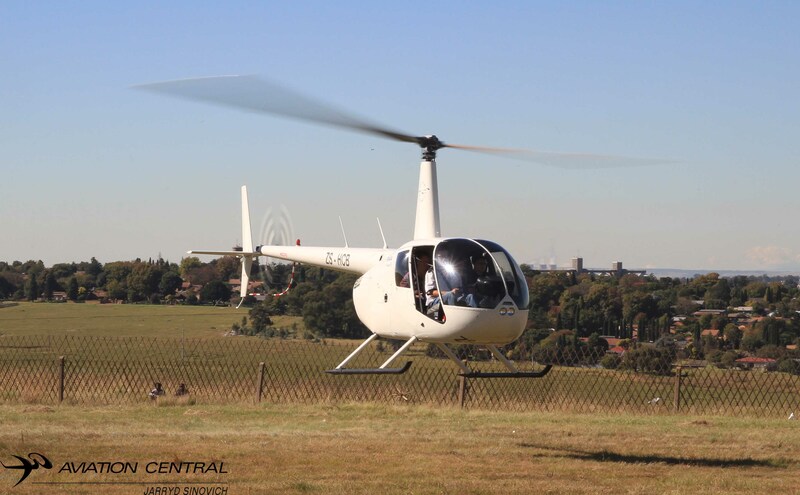 The Magni Gyrocopter flown by Matthew Zalewski from 303 Squadron flying school from Brakpan/Benoni airfield.Johan ‘Juba’ Joubert flew the only helicopter display for the day in the Aerospatiale Gazelle. 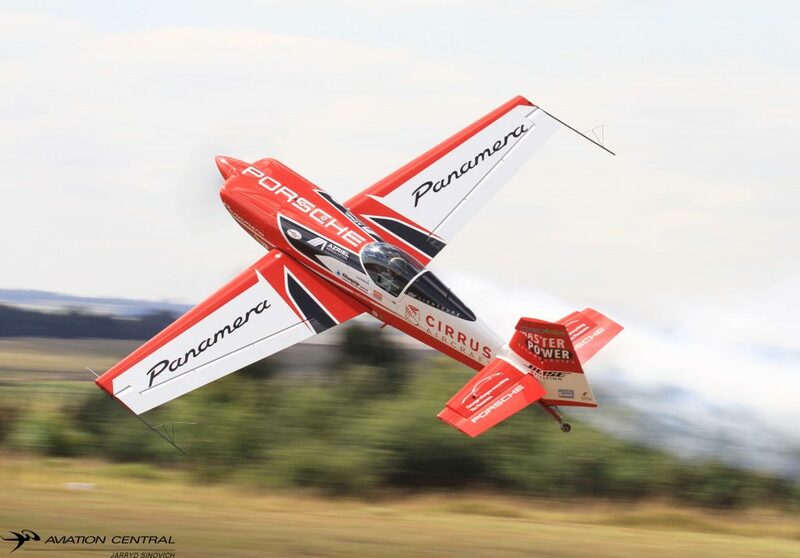 The show was a first for Team Extreme made up of Nigel Hopkins, Jason Beamish,Mark ‘Bugs’ Hensman and Mark ‘Sammy’ Sampson. 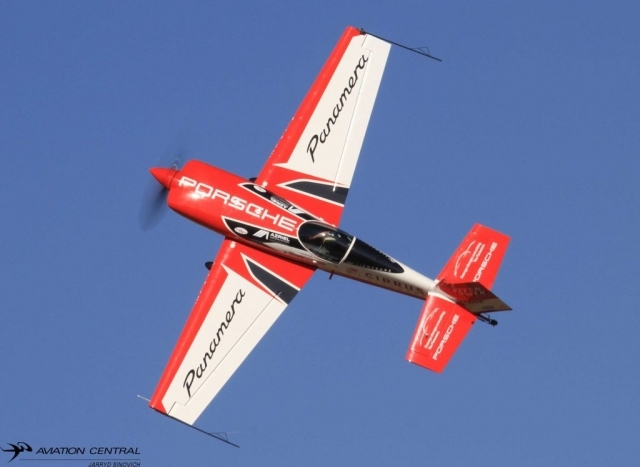 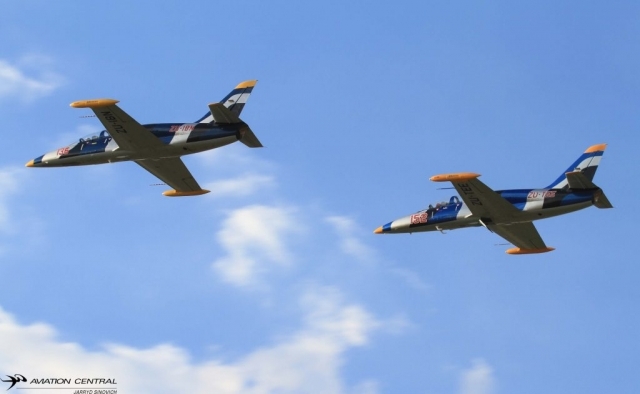 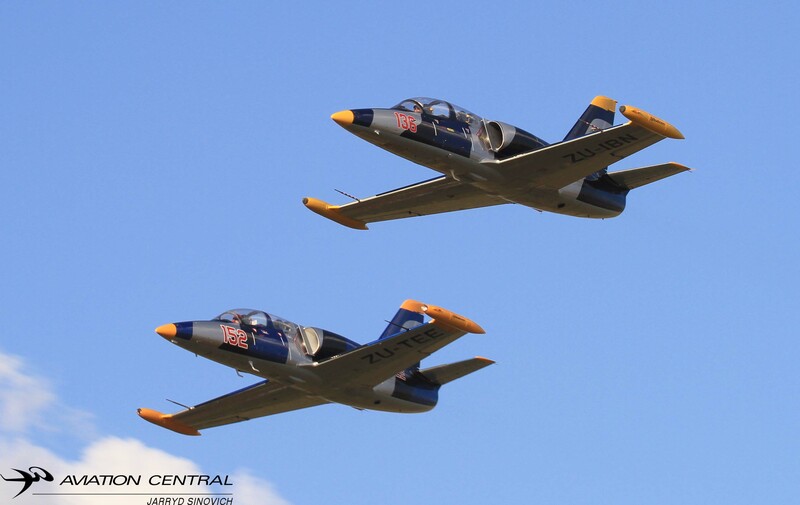 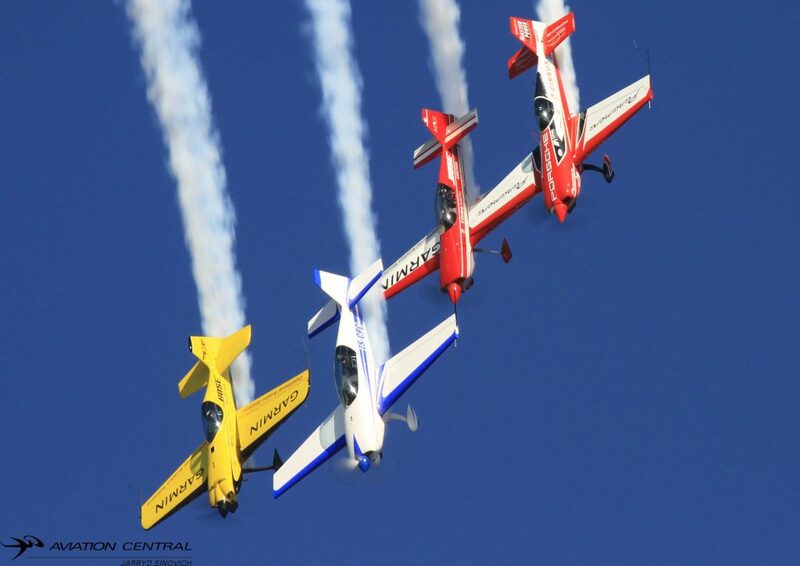 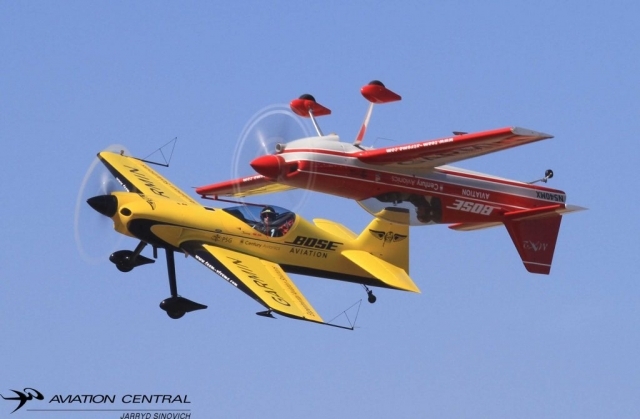 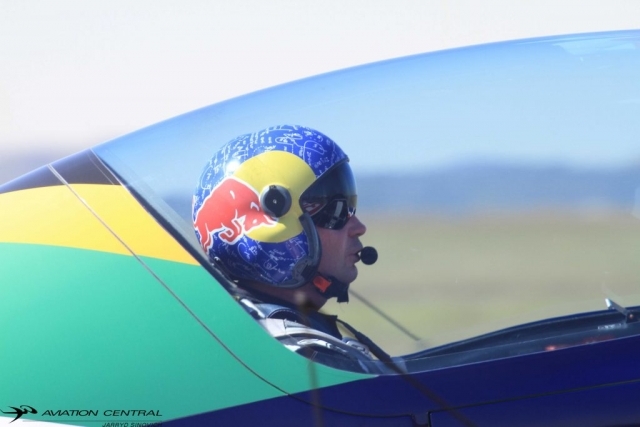 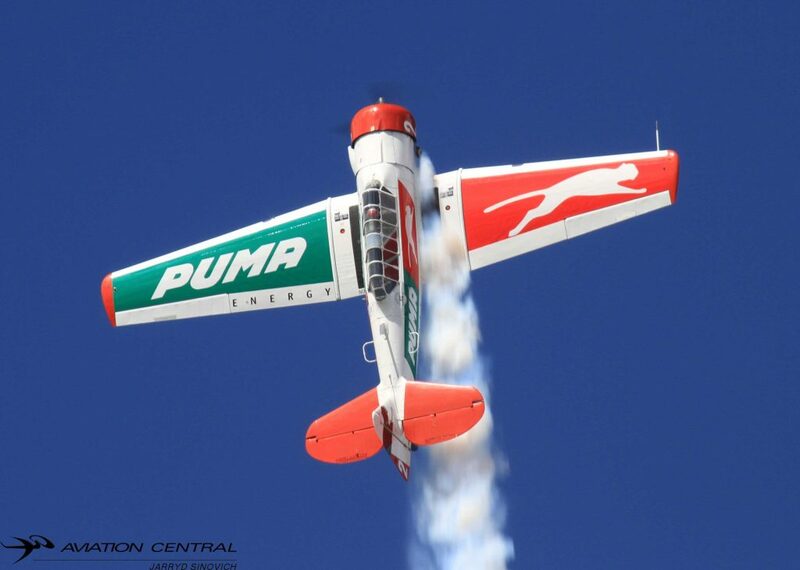 The team flies a range of high performance aerobatic aircraft from the Extra 330, MX2 and Sbach 341. 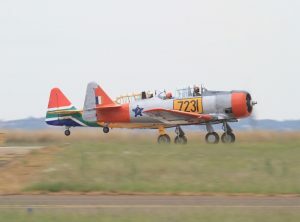 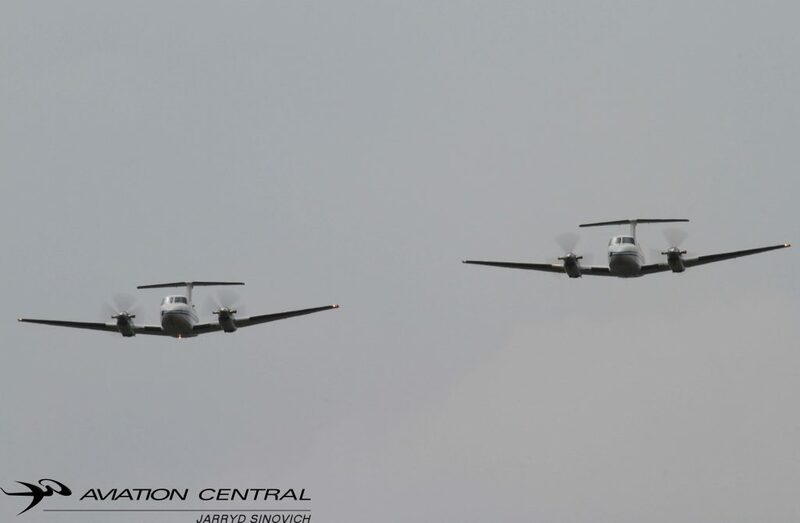 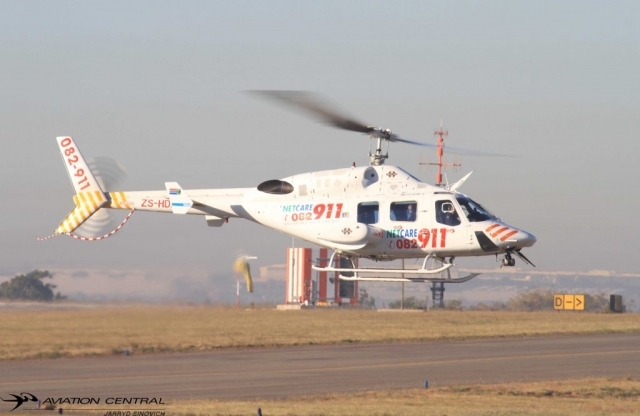 Two aircraft were ferried up from Cape Town just for the show. 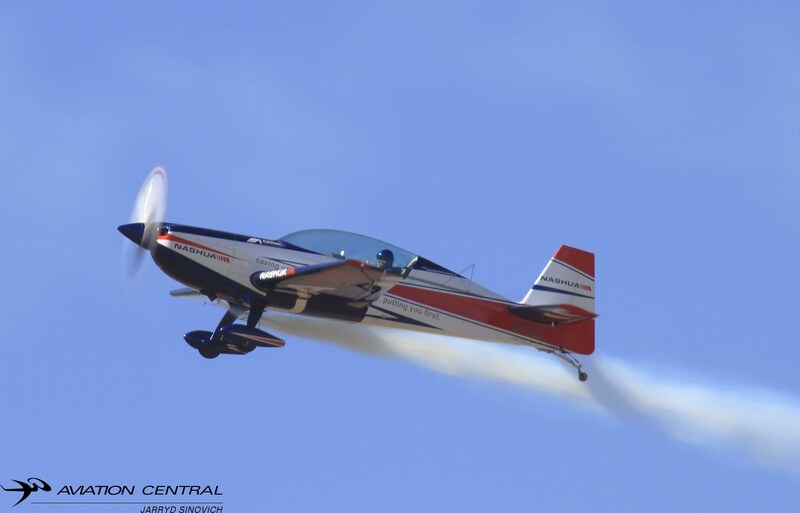 Andrew Blackwood Murray flew his Nashua sponsored Extra 300 in two spirited displays during the day. 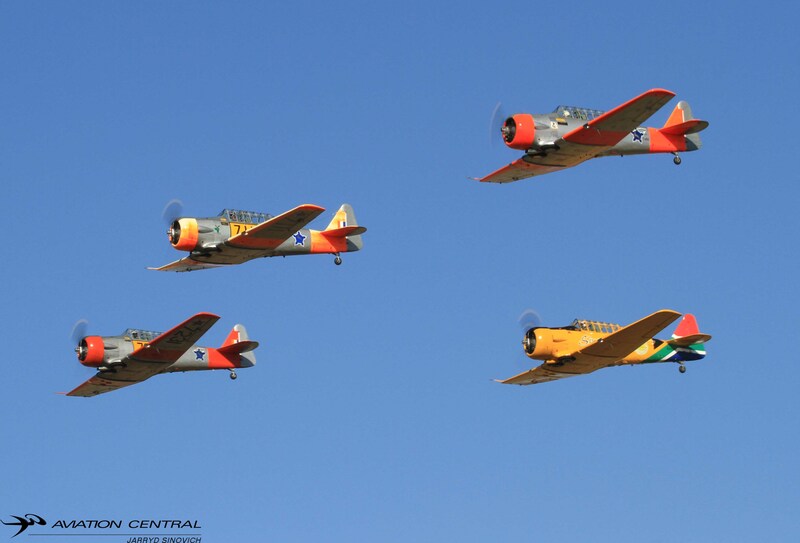 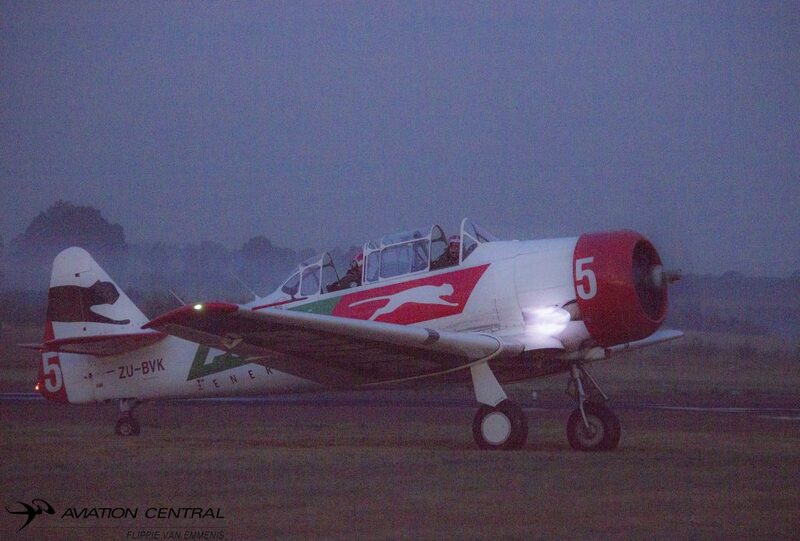 The Rand Airport based team including the Puma Flying Lions T6 Harvard’s led by veteran airshow pilot Scully Levin who still flies for Mango airlines. 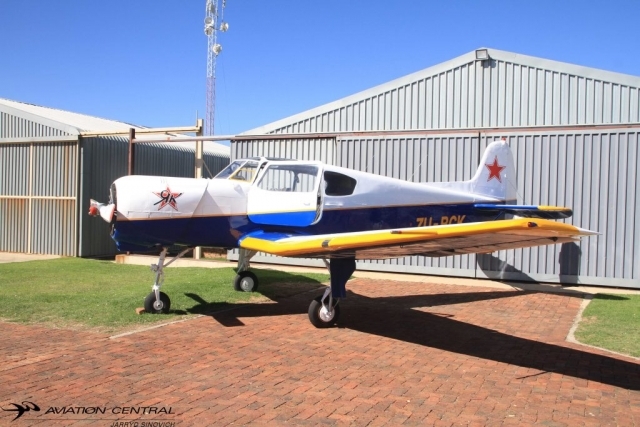 He also led the new Cows Aerobatic team sponsored by ‘Taillifts SA’ flying the Pitts Specials who were sponsored by Torre for some years. 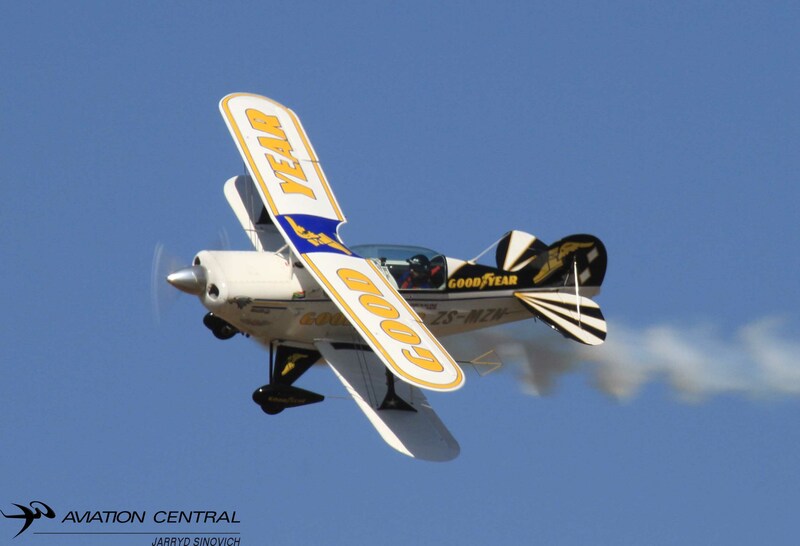 The Goodyear Eagles put a 3ship display,also flying the Pitts Special led by former fighter pilot Glen ‘Gringo’ Warden. 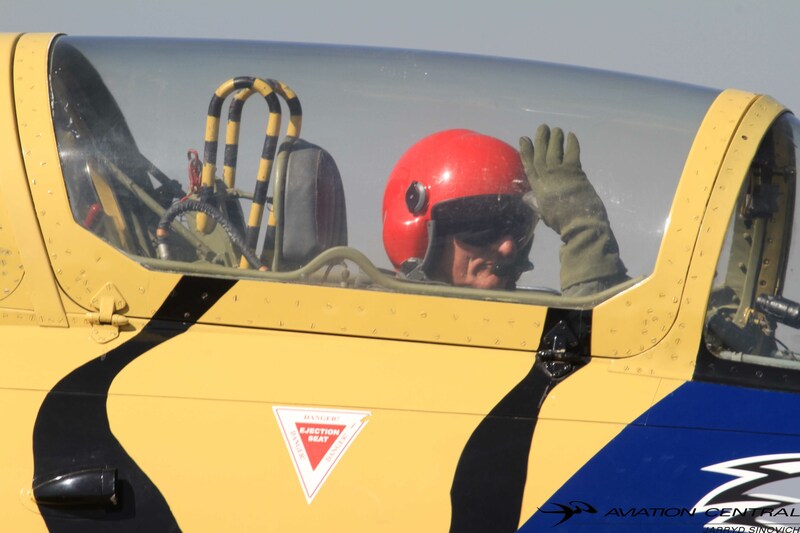 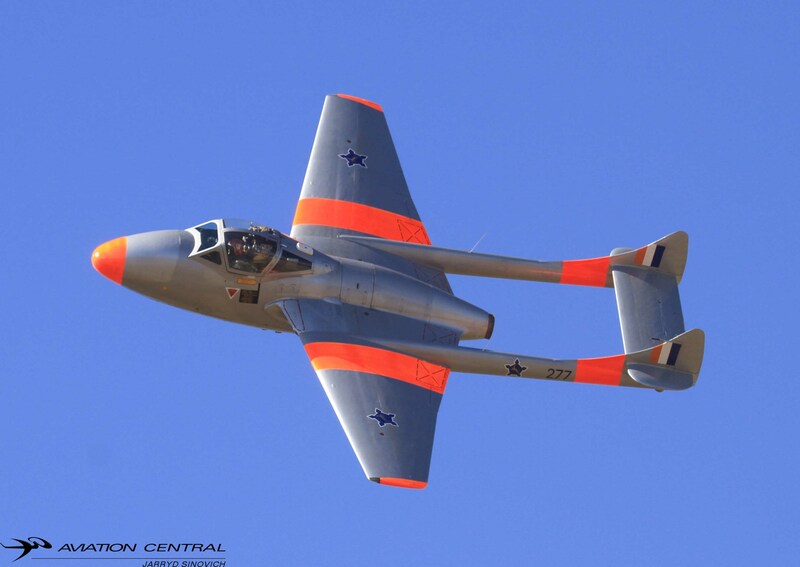 The team is also made up of Paul ‘Cruiser’ Coetzer former 85 Combat Flying School Impala display pilot. 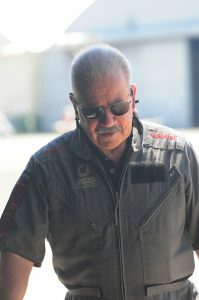 And lastly Johan von Solms a former Cheetah pilot. 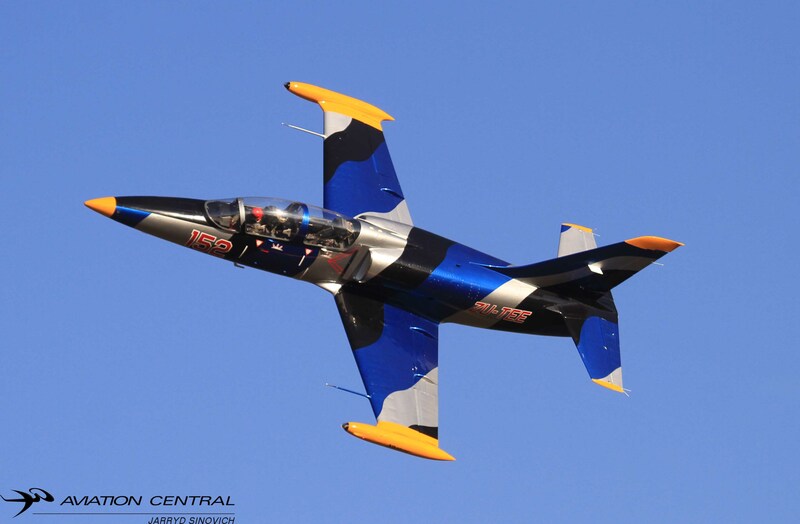 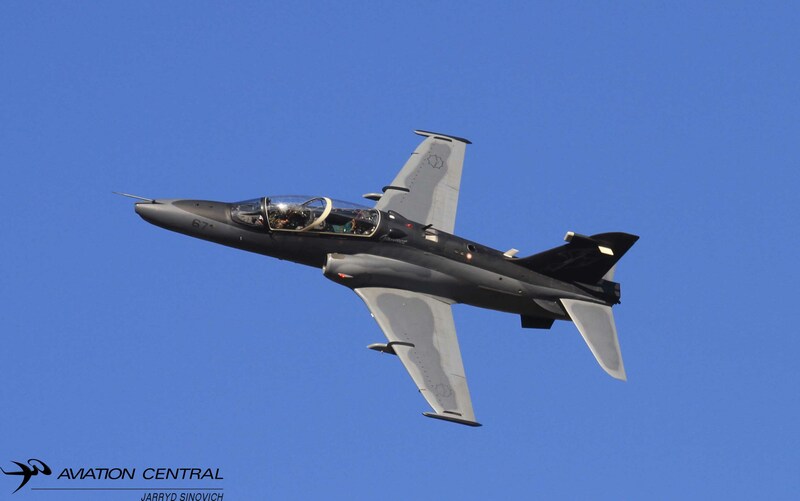 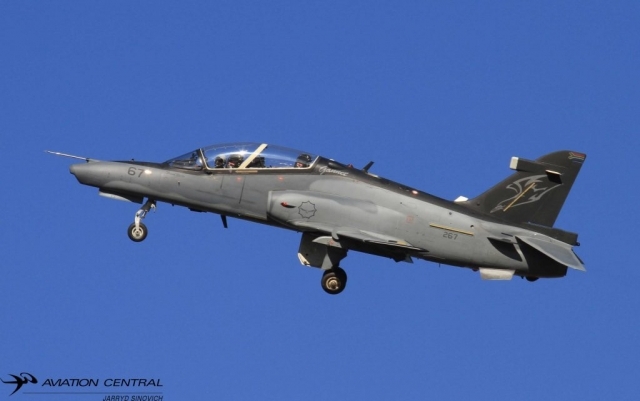 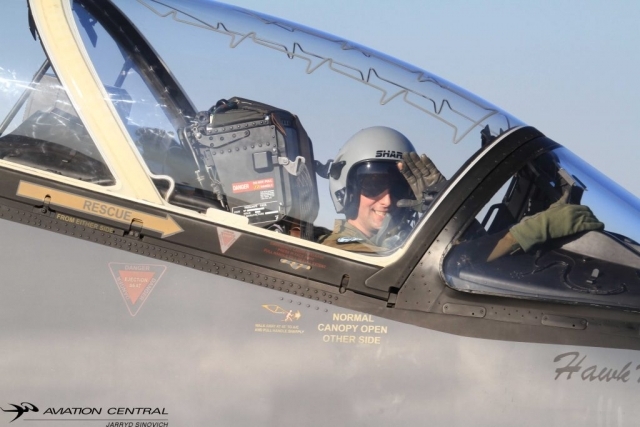 Glen Warden also flew the solo L39 ‘ZUTEE’ display and later paired up with Richard Lovett in his L39 ZU-IBN which both L39s are almost identical. Ivan van der Schaar flew is beautiful Boeing Stearman with gentle aerobatics and also flew his stearman into a immaculate sunset at the end of the day. 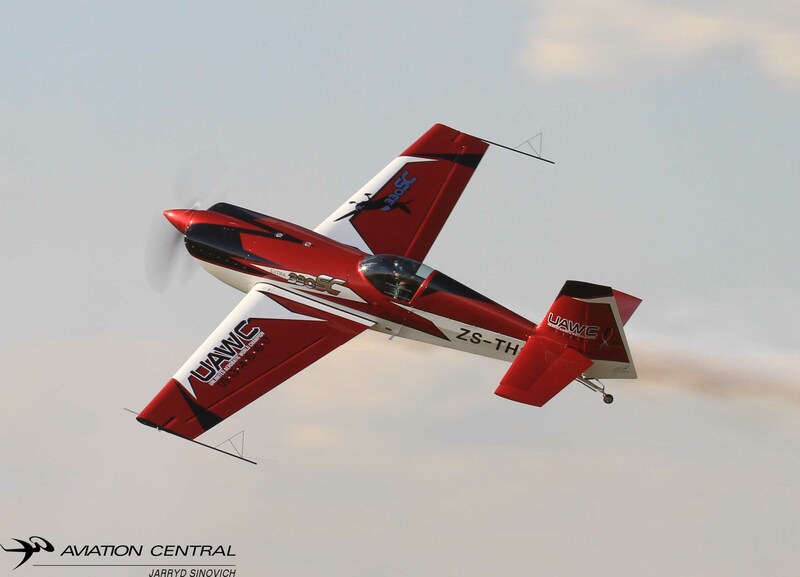 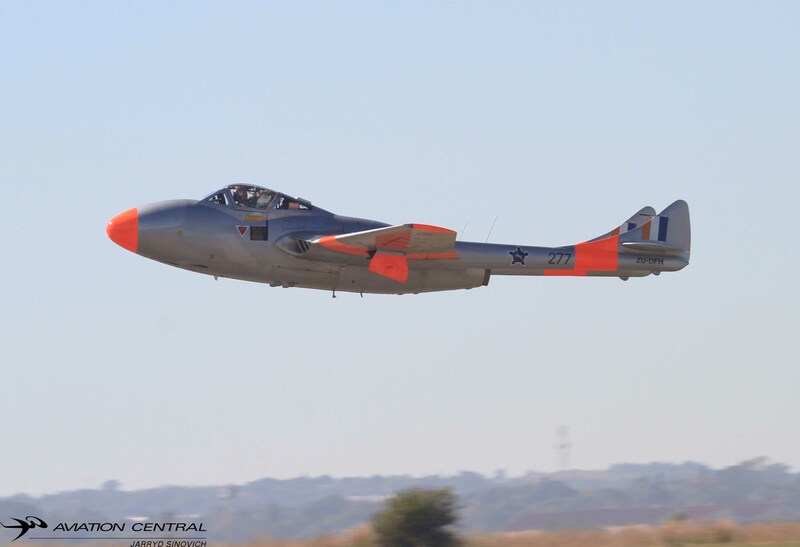 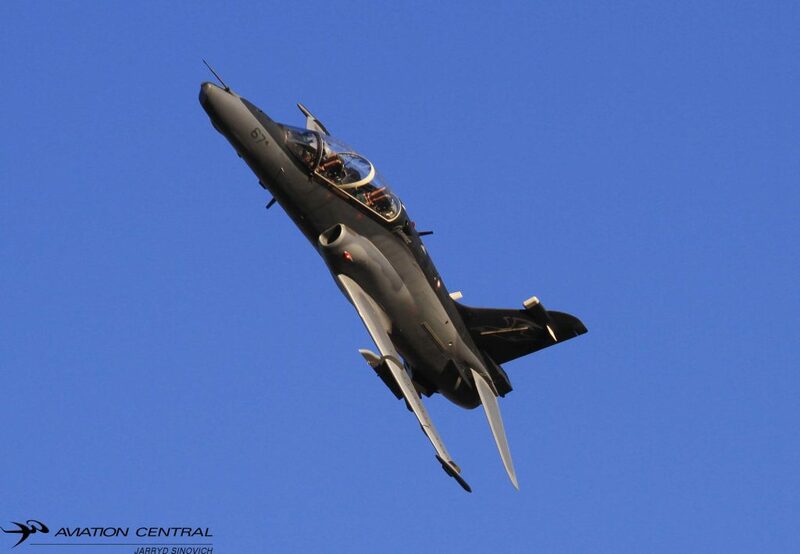 Denel test pilot Mike Weingartz flew David Laas Impala ZU-IMP, Mike has the highest hours on the type in the world. 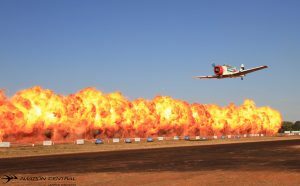 The kishugu AT802 demostarted simulated fire bombing just as the sun set. 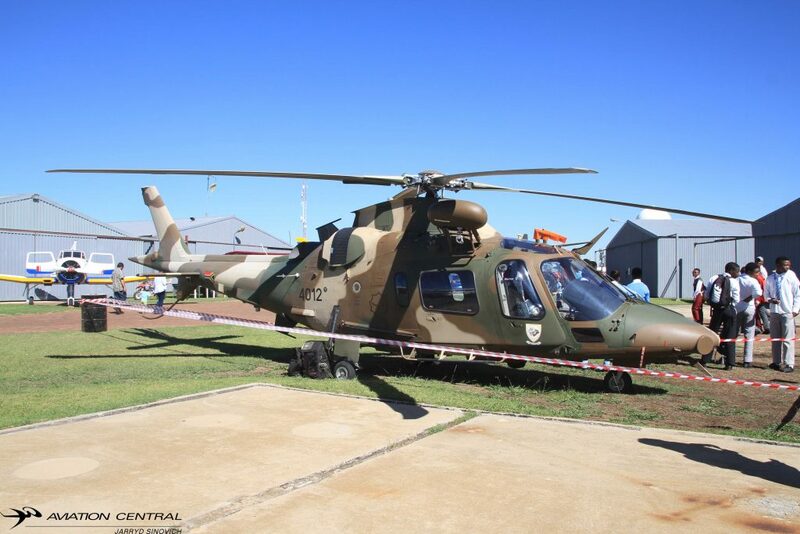 The South African Air force provided an Agusta A109LUH from 19 Squadron AFB Hoedspruit which was on static display. 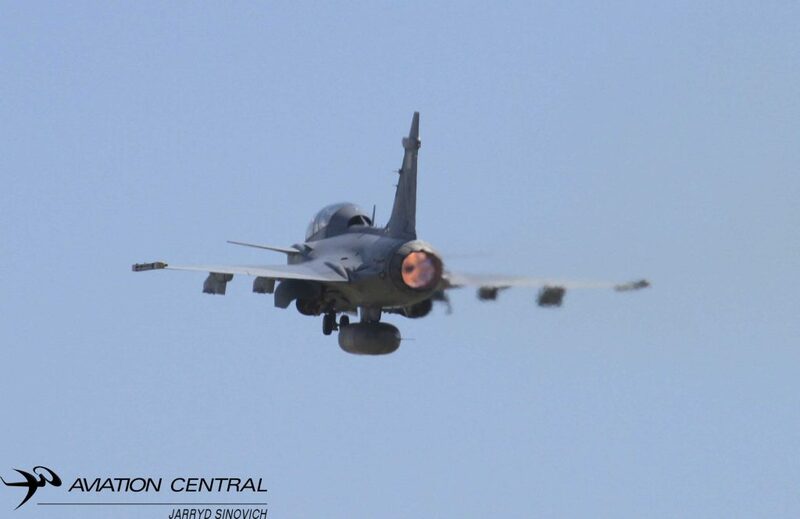 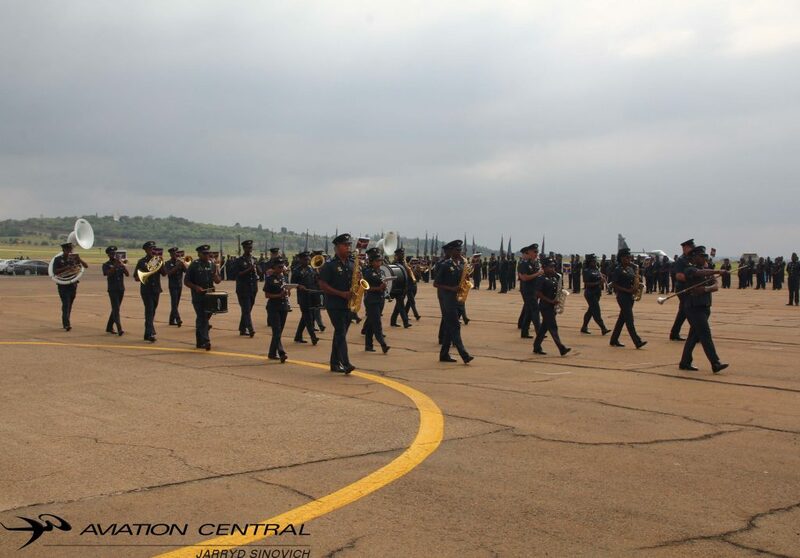 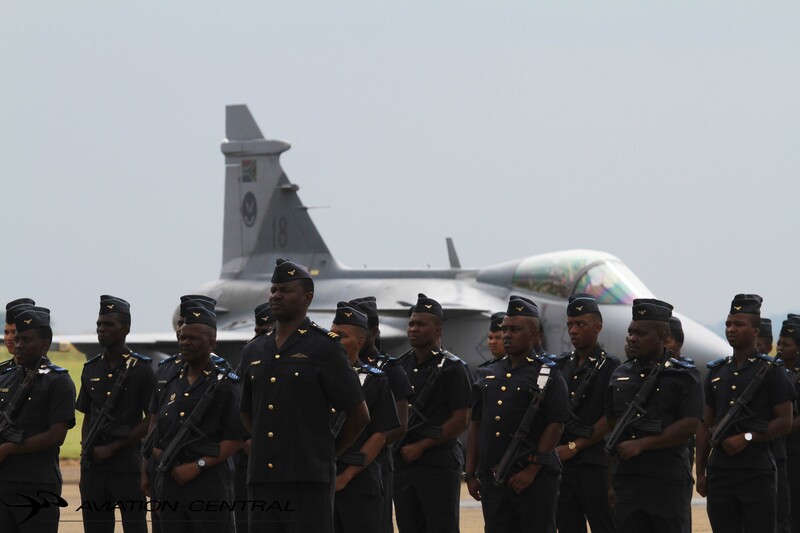 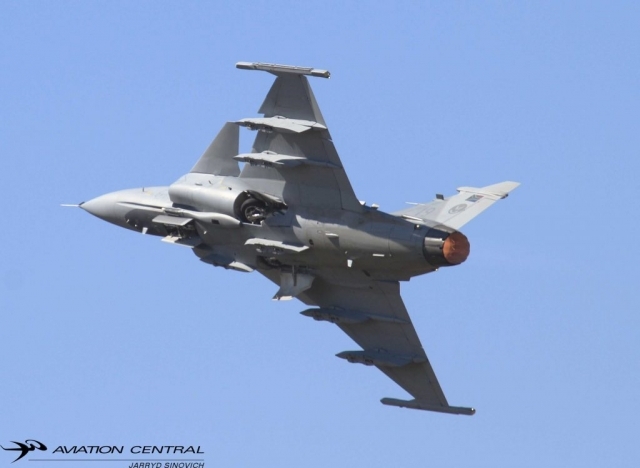 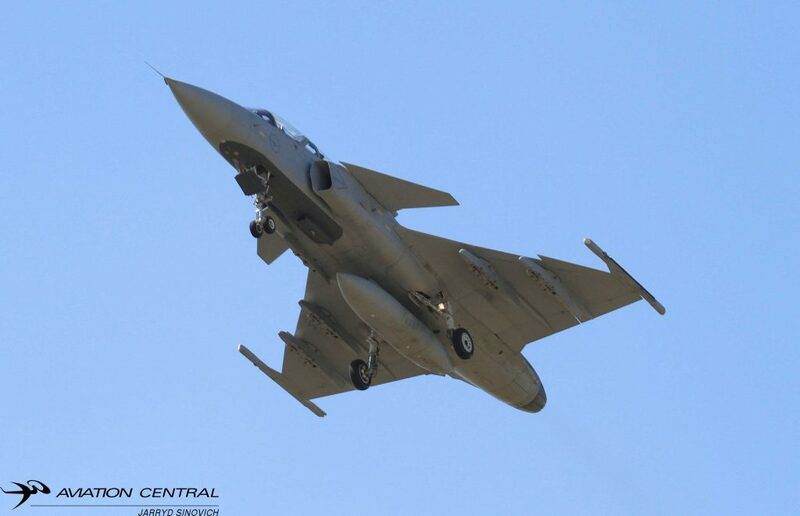 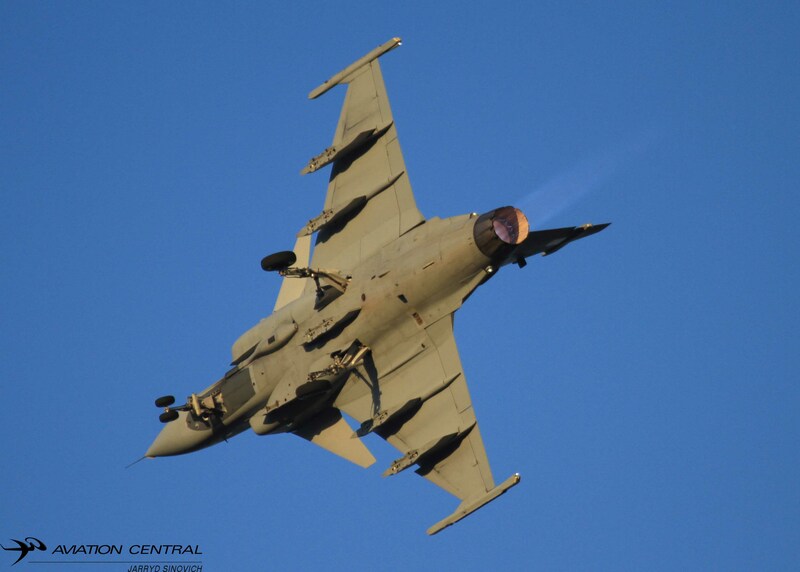 The 2 Squadron JAS39D Gripen flew all the way from AFB Makhado to provide a mini display. The Gripen was flown by Mohau ‘Doberman’ Vundla, this was his first airshow display and in the back seat Marc ‘Bluebird’ Wilson. 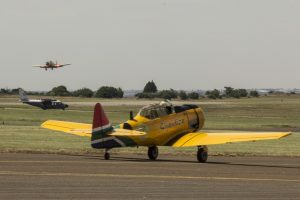 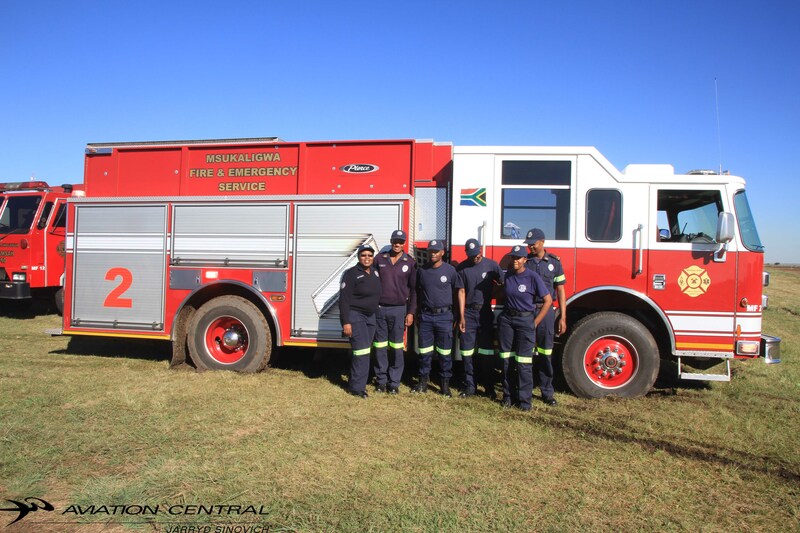 The show was tasked by Andre Van Rooyen who had support from most of the members from the Ermelo Aeronautical Society and the support of the sponsoring of the show from FAW Trucks Ermelo. 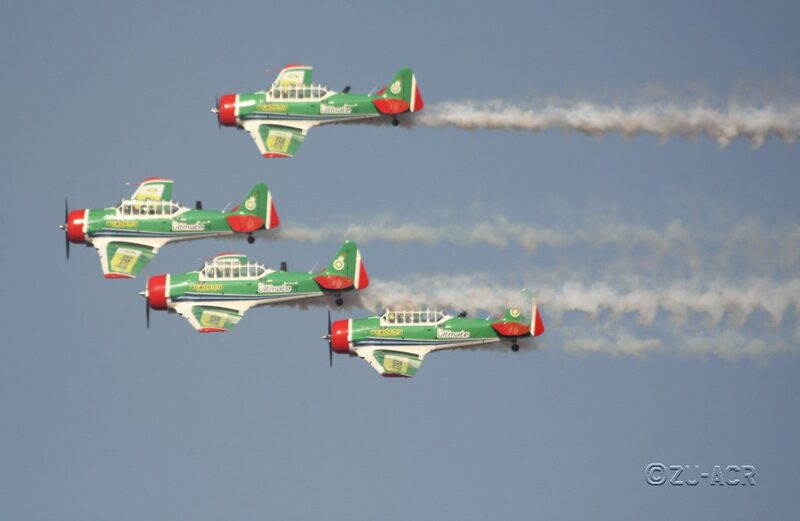 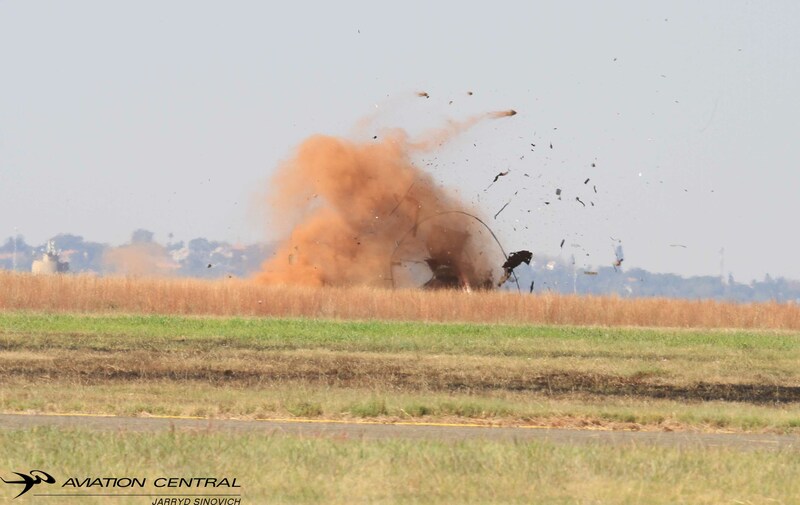 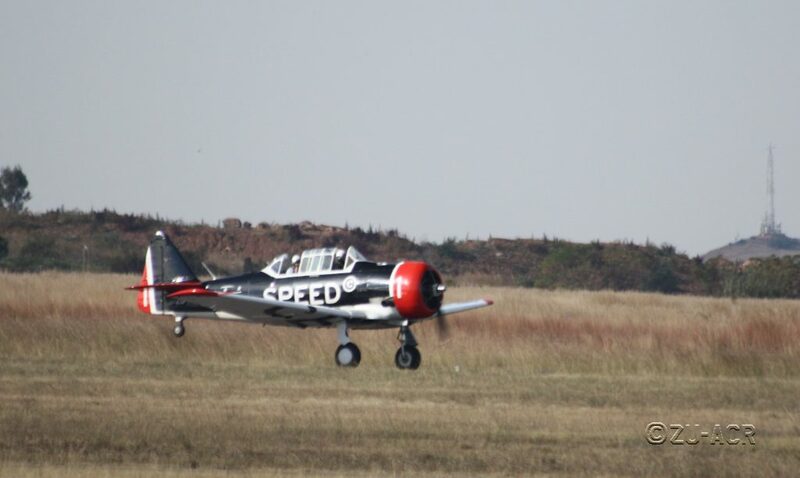 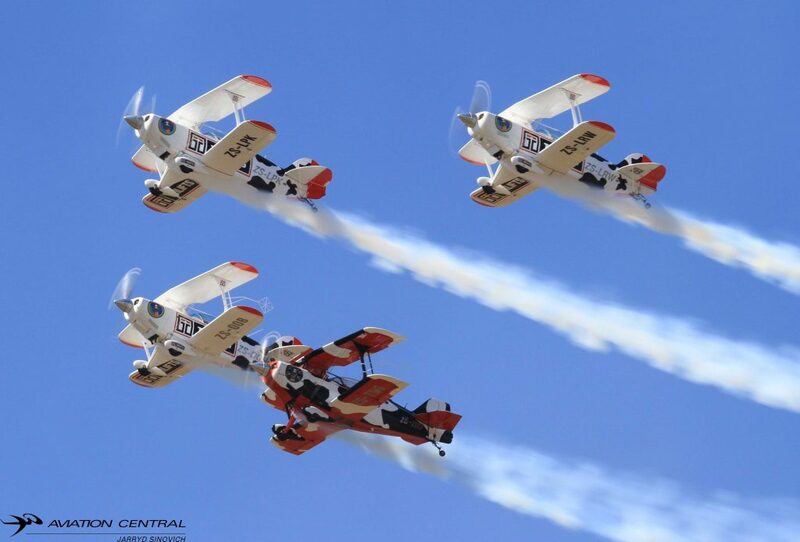 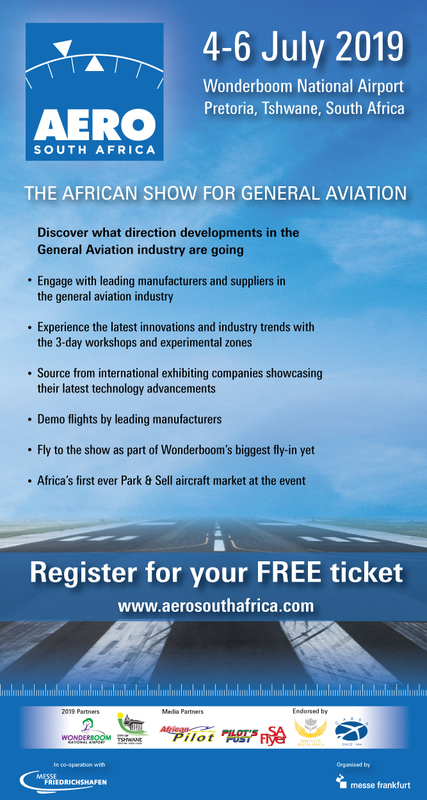 We hope to see the Ermelo Airshow as a regular on the airshow circuit.